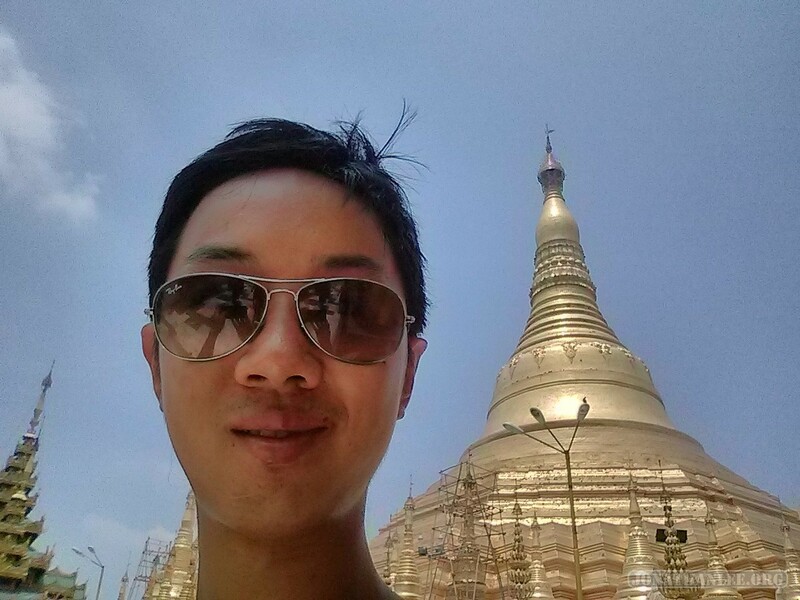 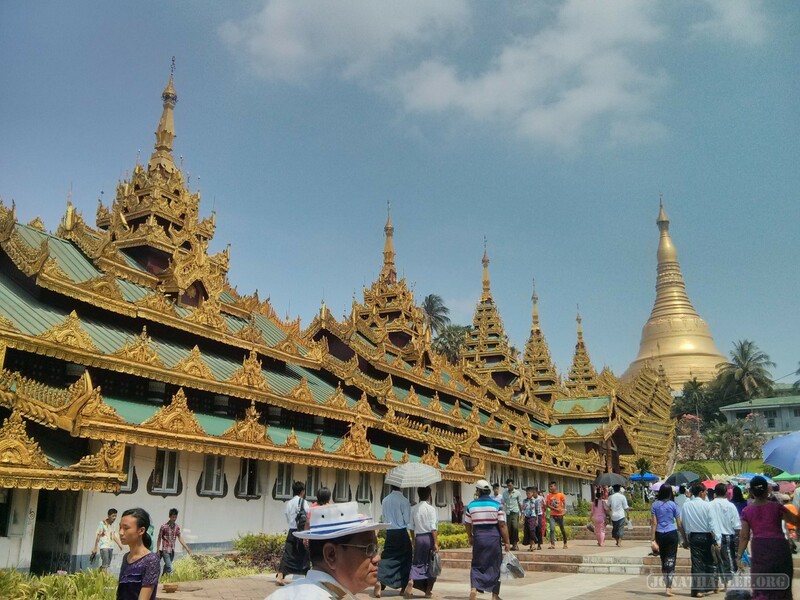 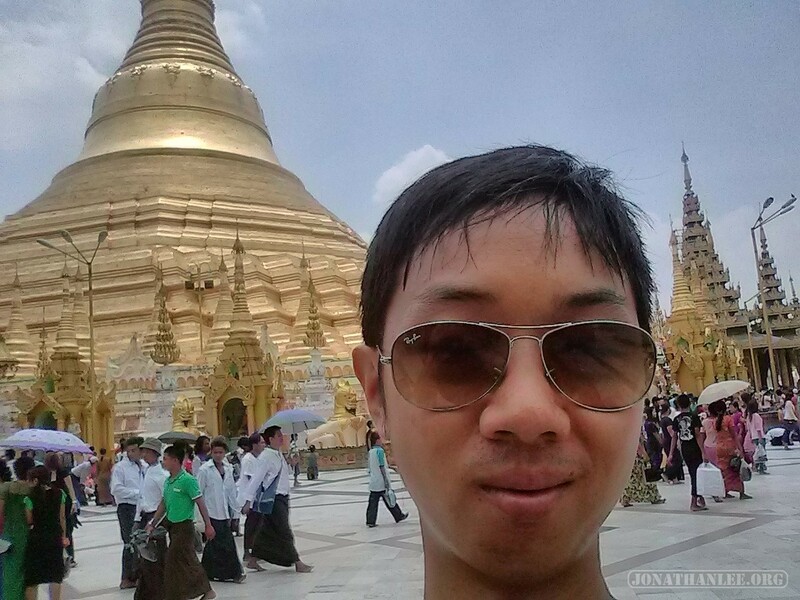 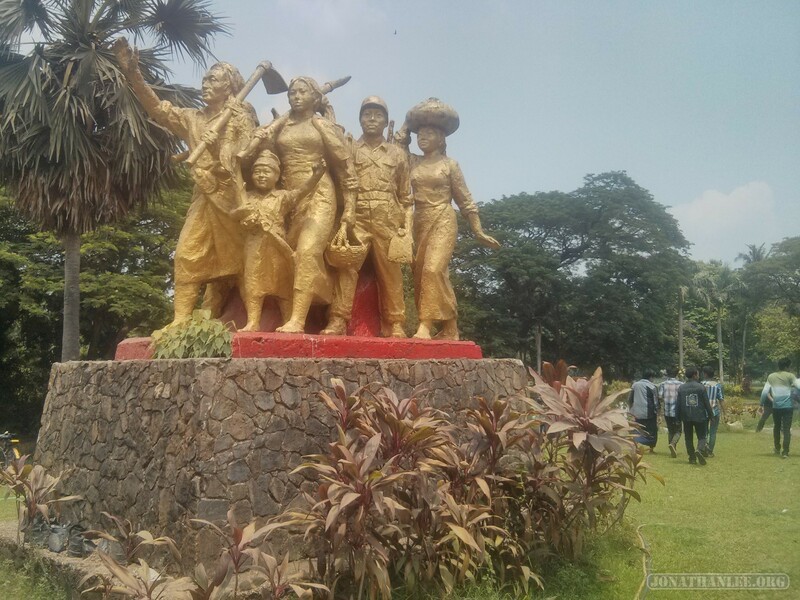 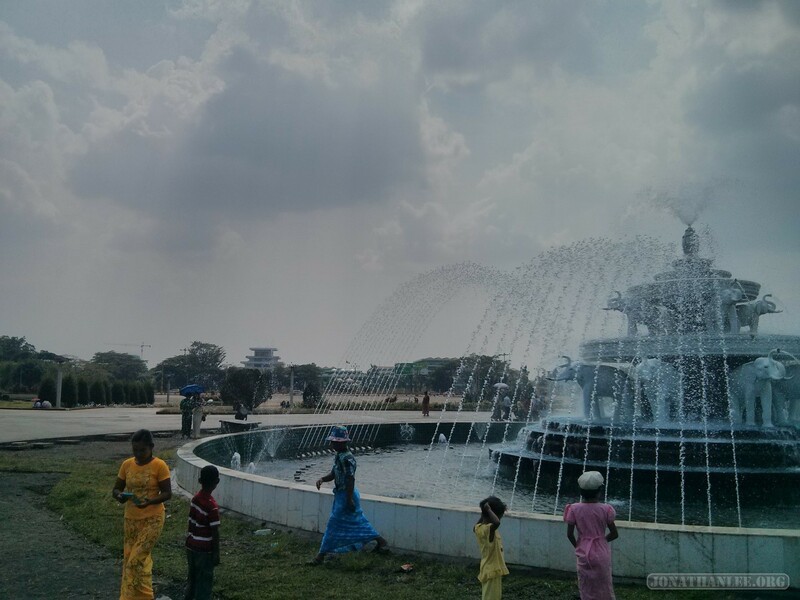 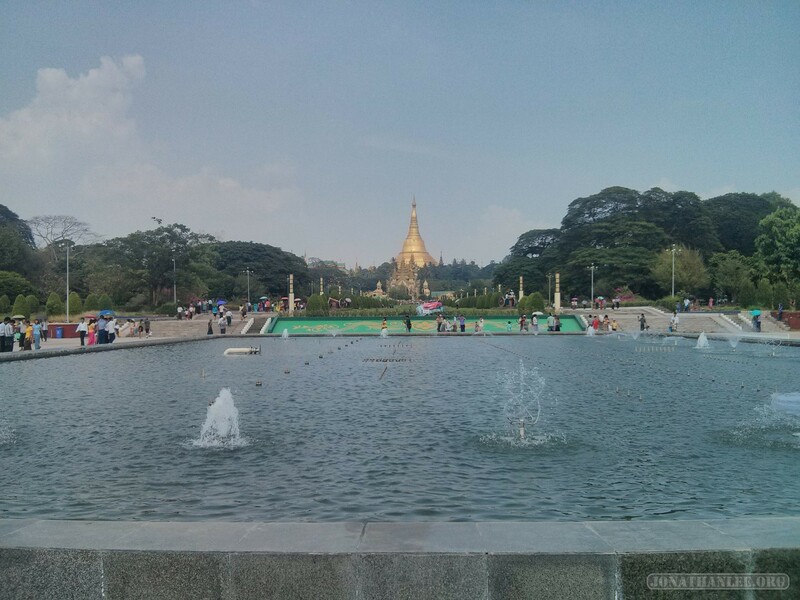 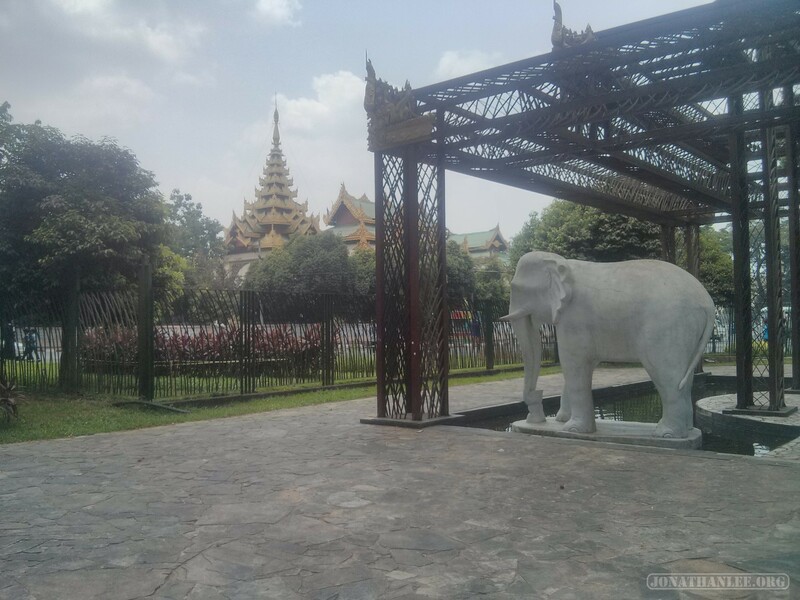 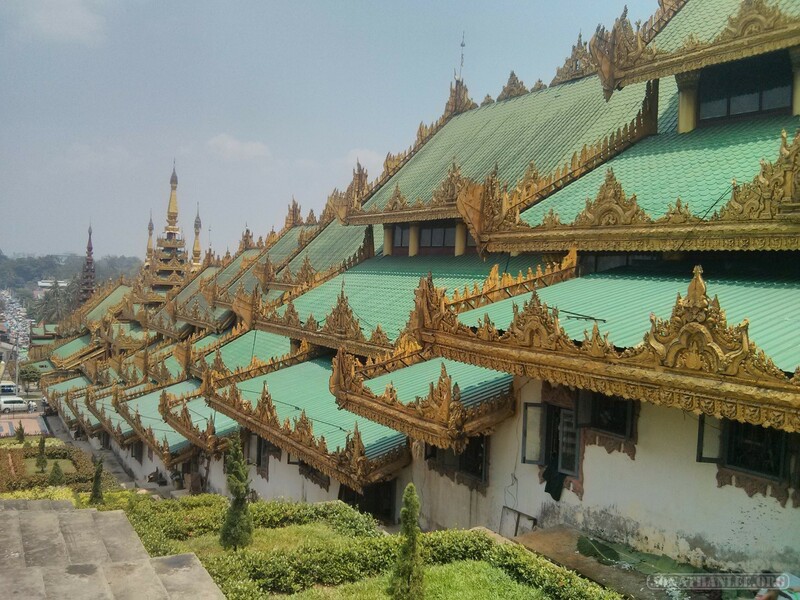 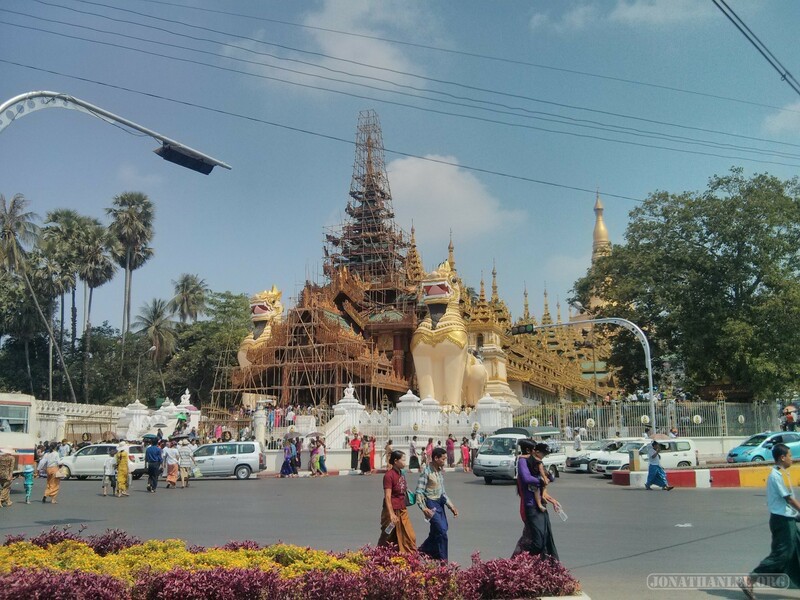 After getting quite tired of getting sprayed by water guns on every Bangkok street corner, I hopped on a plane and flew to Yangon (Rangoon), the capital of Myanmar. 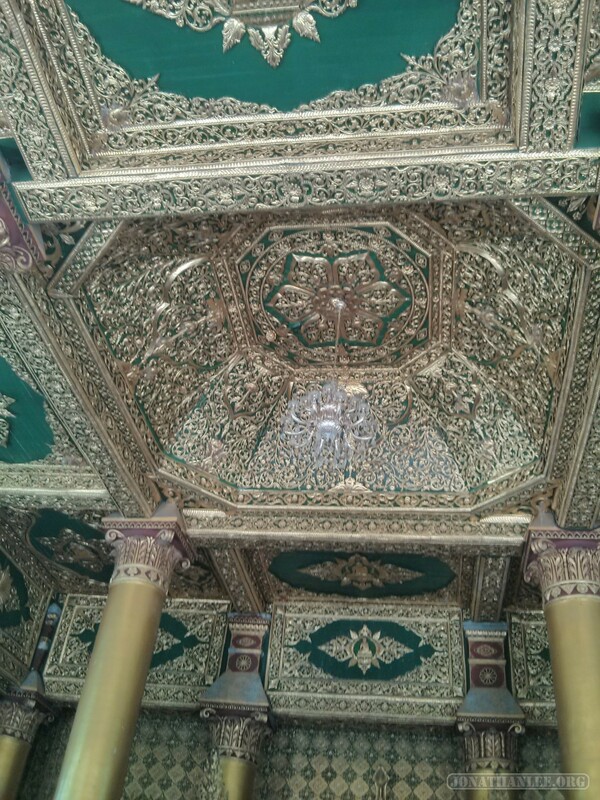 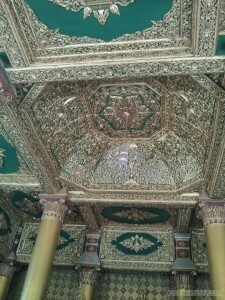 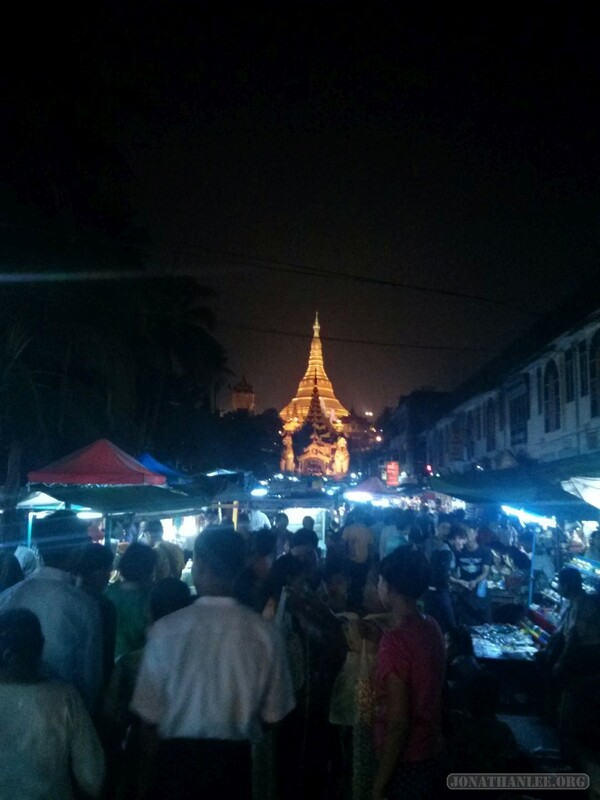 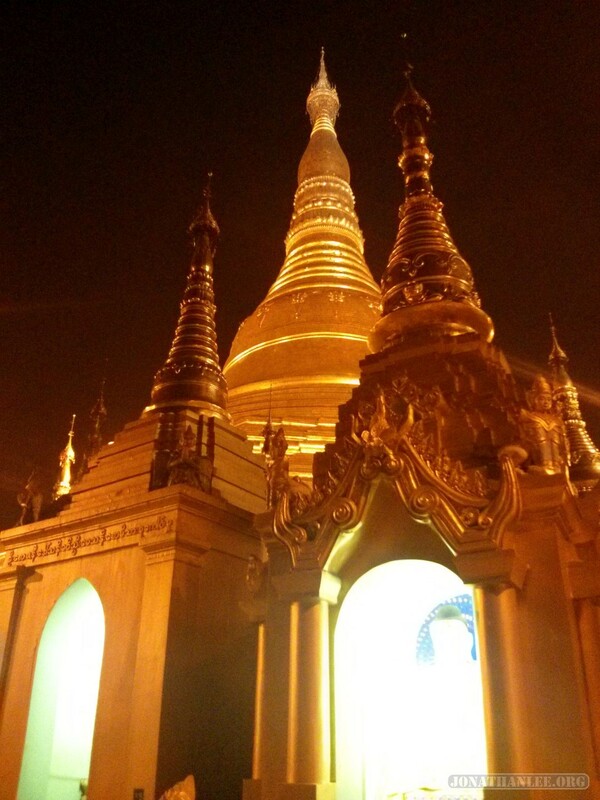 And I discovered, Yangon is a place like no other. 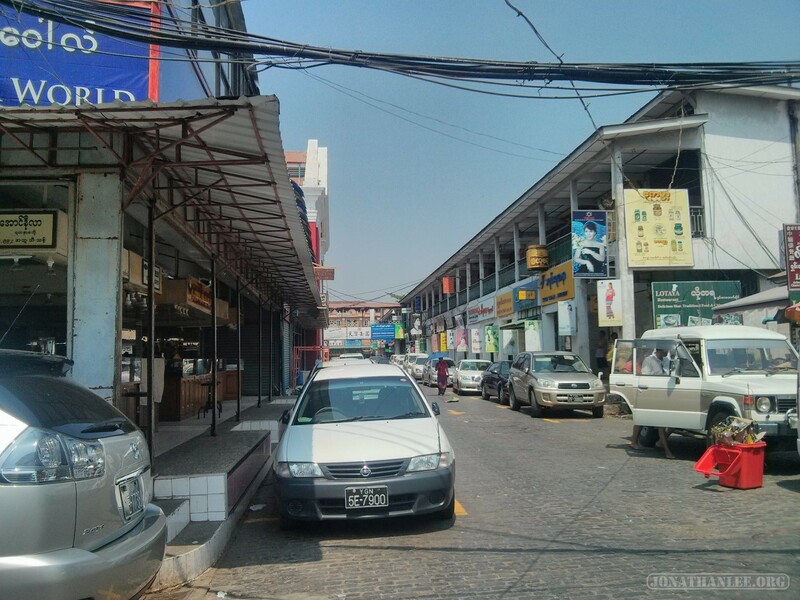 Whereas other cities in Southeast Asia have their unique features, they all westernized to some degree, they all have the same convenience stores, the same big western brands, the same western dress. 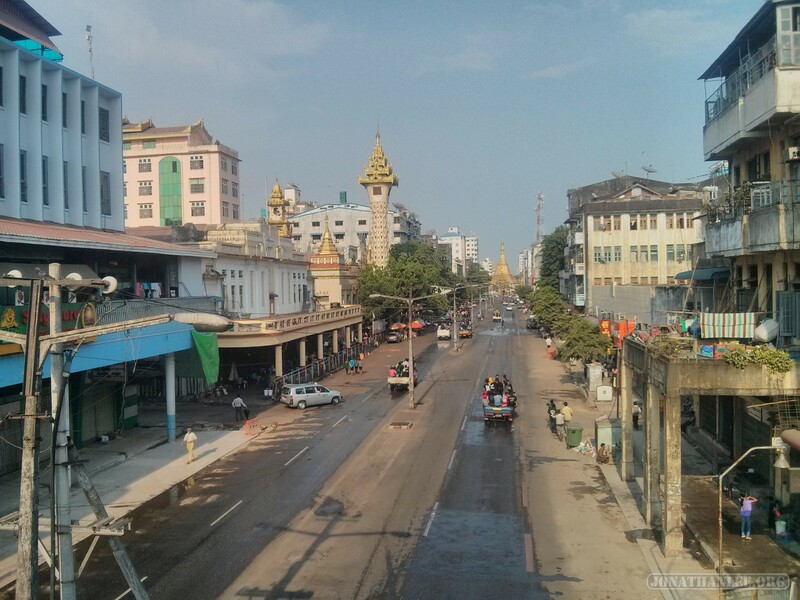 And then there’s Yangon. 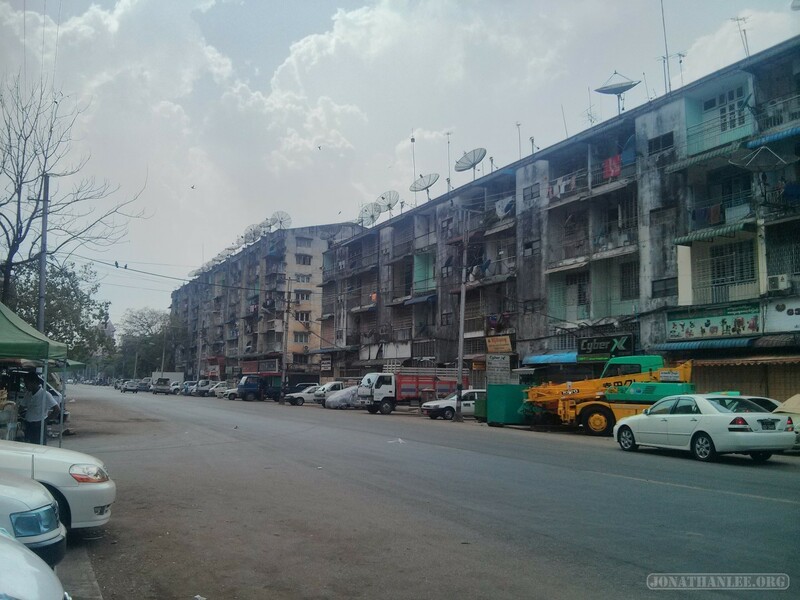 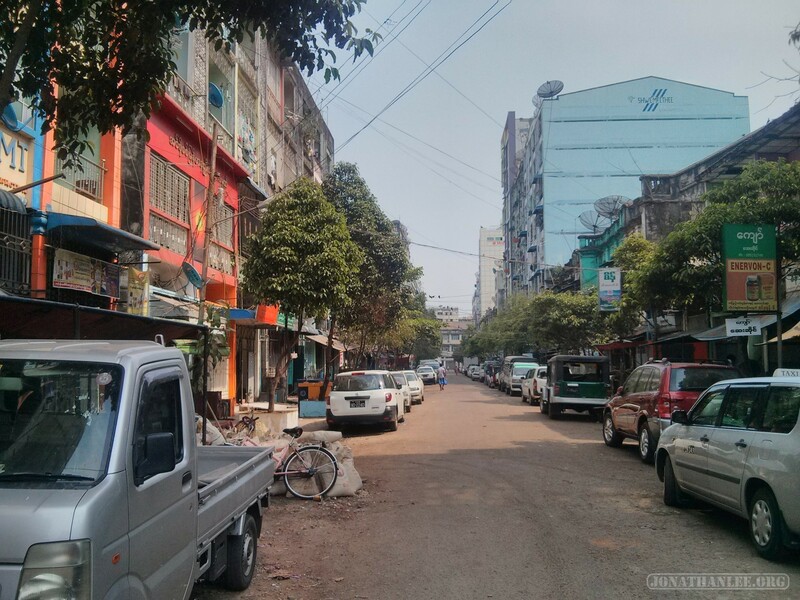 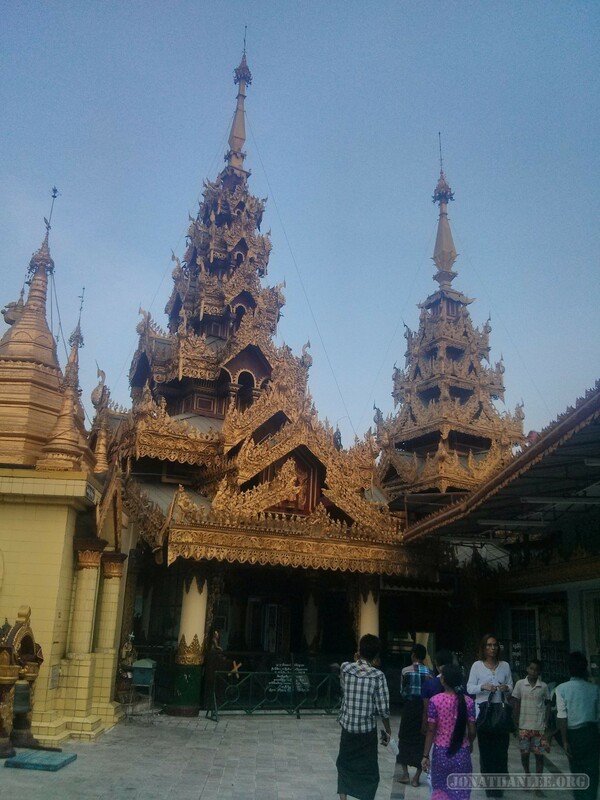 The first thing you notice about Yangon, is how non westernized it is. 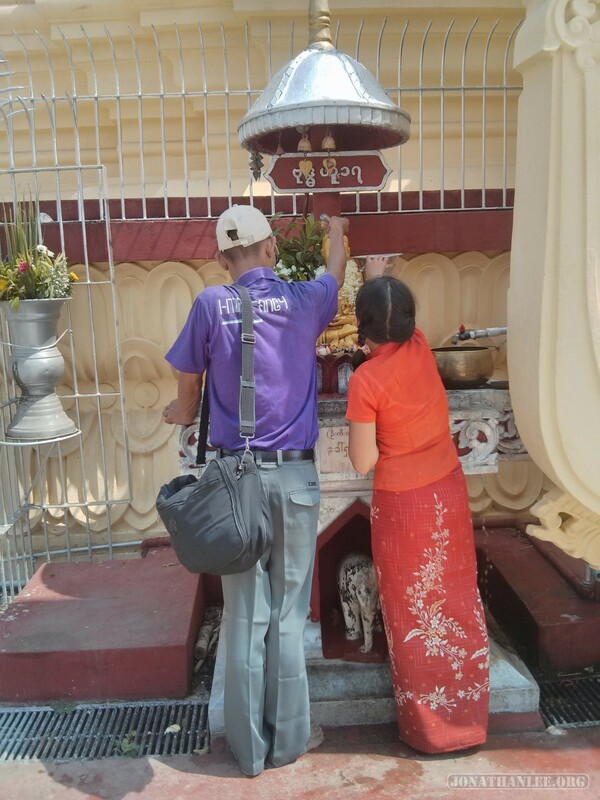 It’s somewhat like Laos in this respect – Laos is much less westernized than Vietnam or Thailand, but that’s mostly due to its poorness. 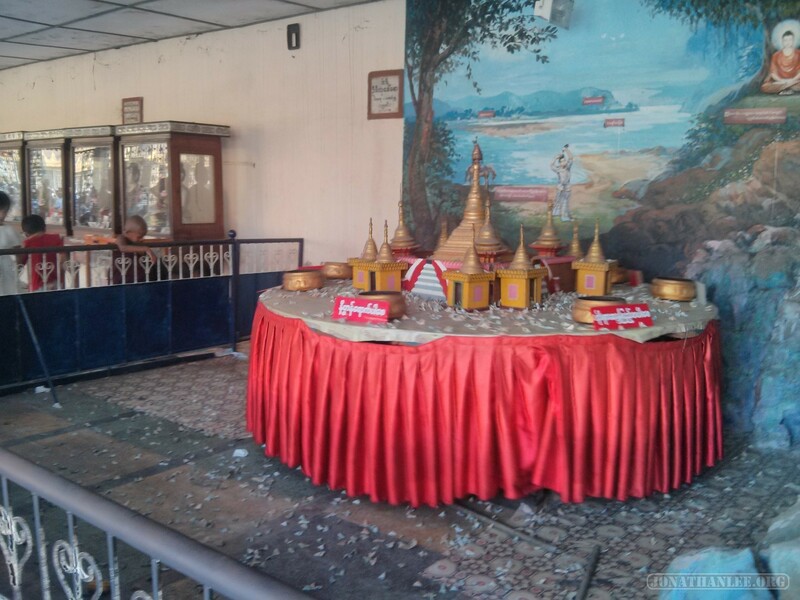 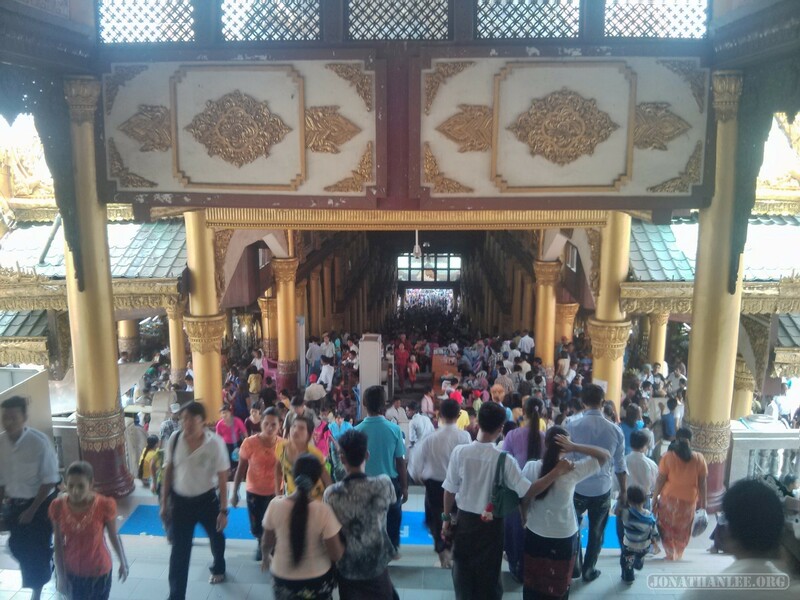 On the other hand, Yangon gives the impression of a country that simply refuses to subscribe to western influence. 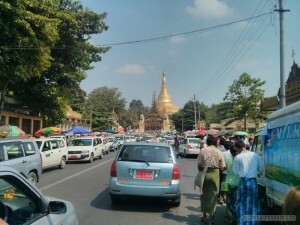 This is reinforced by the fact that until recently, it was very difficult for westerners to come into Myanmar at all. 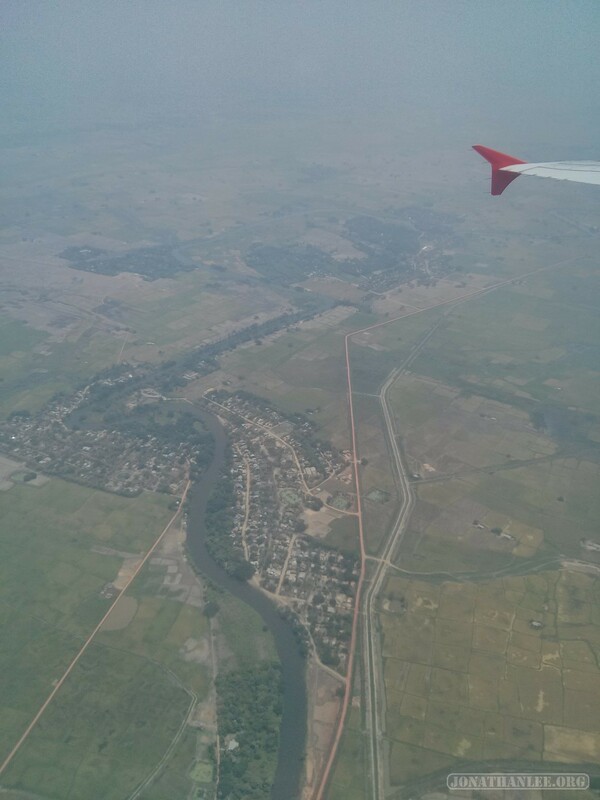 So flying in Yangon was quite exciting! 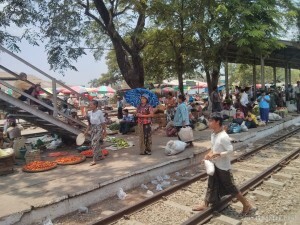 Coming into the country, it’s a bit of a shock to see everyone walking around in a sarong, to see girls wear the traditional makeup of white circles / squares / figures on each cheek, to see a country utterly without western fast food influences. 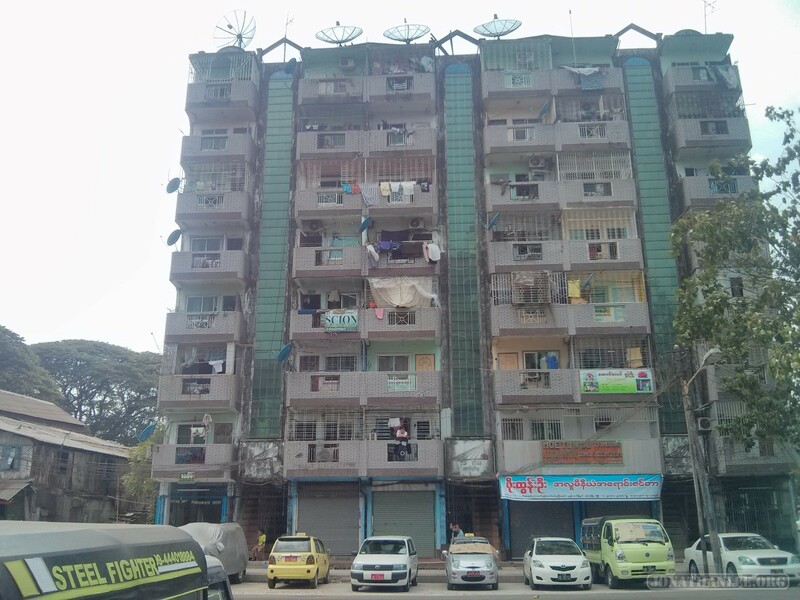 Walking down the street, buildings just seem so drab. Also, this is the Myanmar currency equivalent of $100. 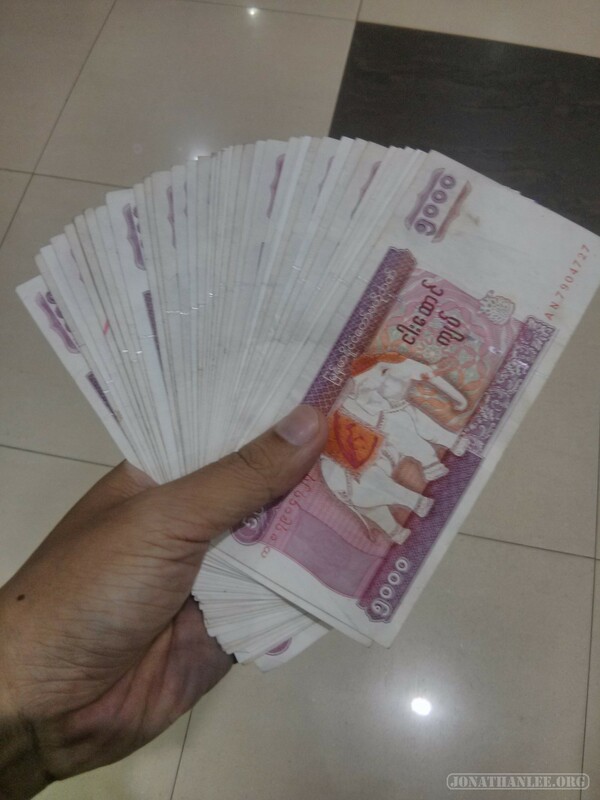 I felt like a baller. 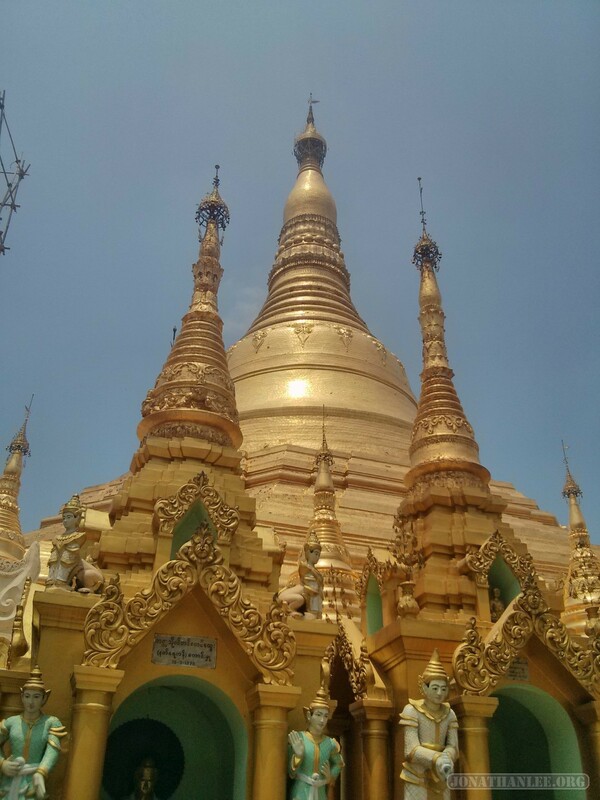 Shwedagon Pagoda is the religious center of all of Myanmar, and it is an absolutely massive temple complex. 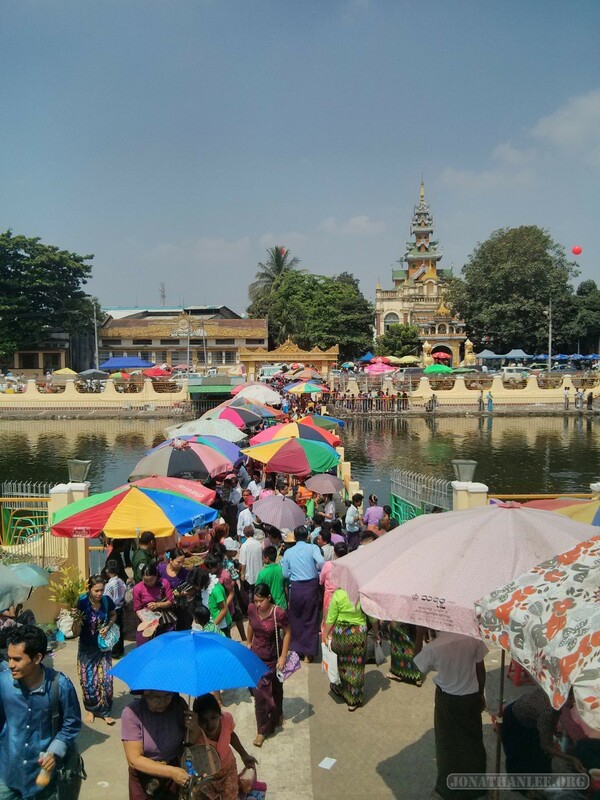 Since I visited Yangon right on the eve of the Burmese new year, I also found it to be massively crowded, as part of the new year celebrations! 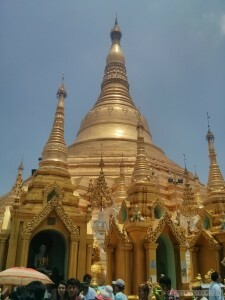 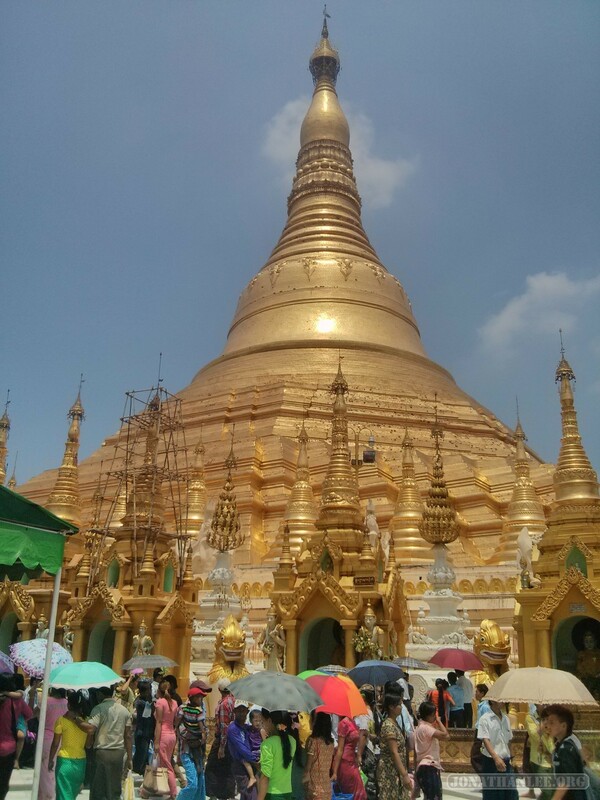 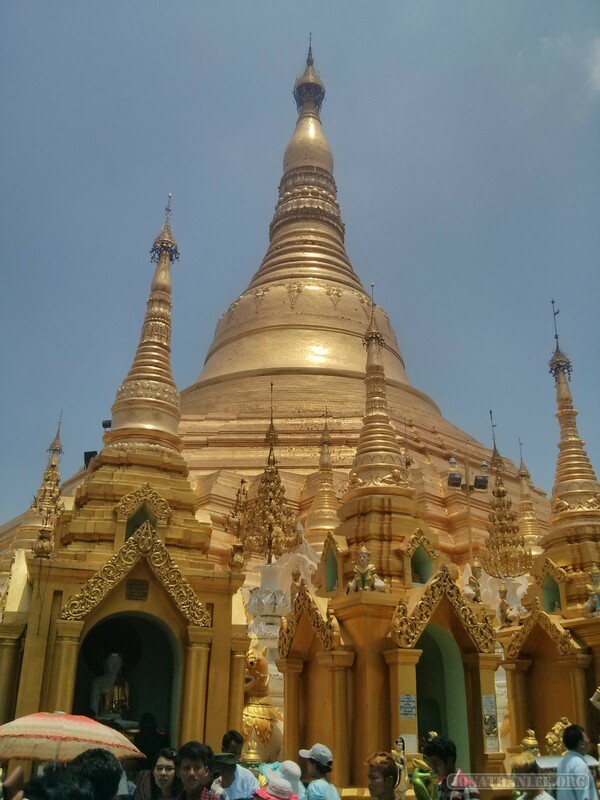 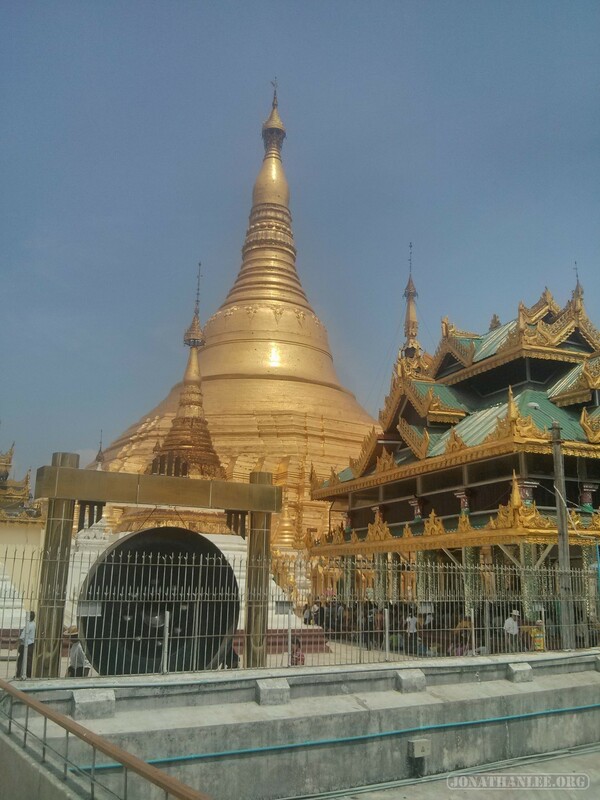 And the thing about Shwedagon is, it’s a massive complex. 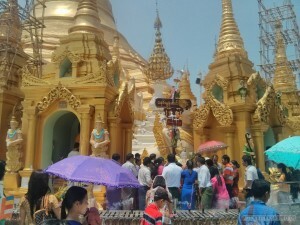 It’s a temple complex on a hill. 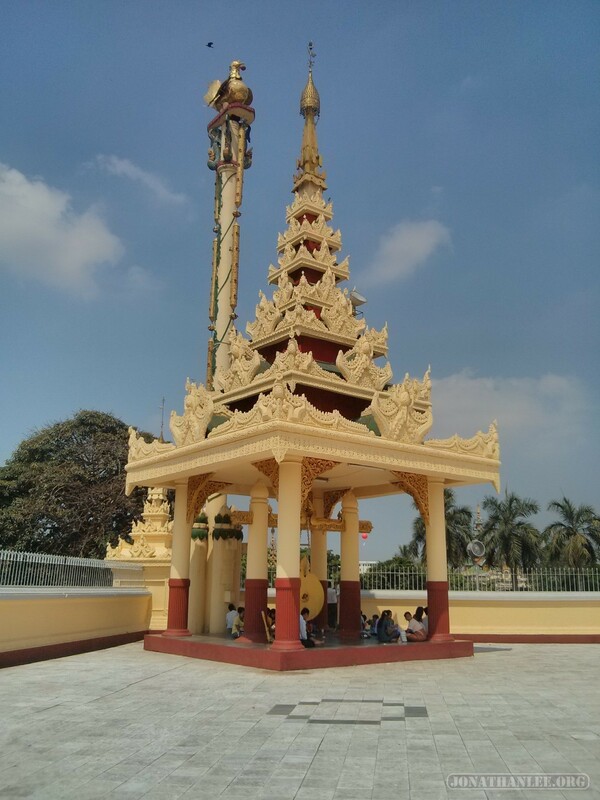 There’s one main golden pagoda spire, but it’s surrounded by whole bunch of other temples and buildings as part of the temple complex. 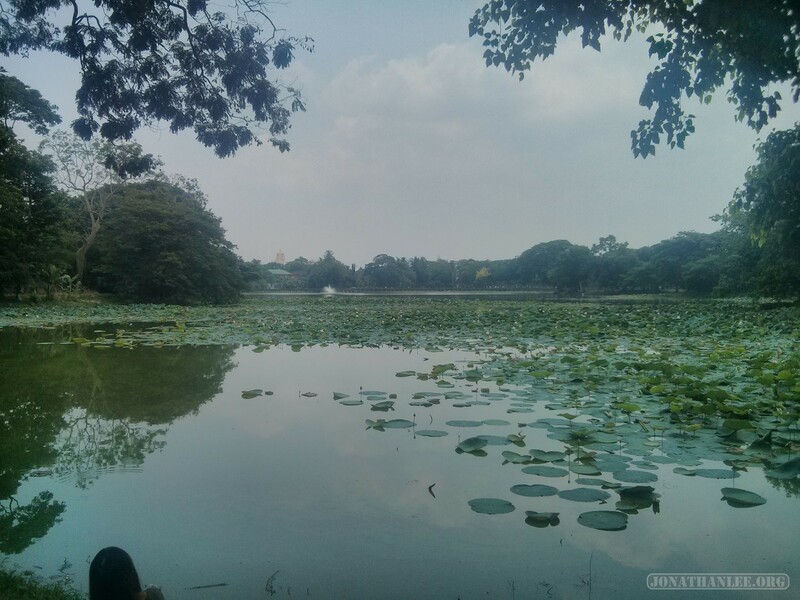 It’s actually quite a hike, getting from the street level to the pagoda proper, and wow it’s crowded. 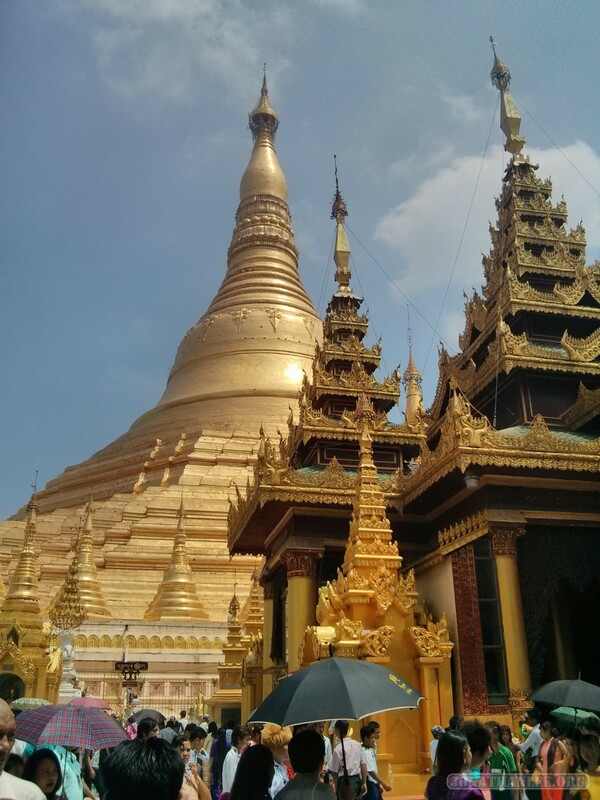 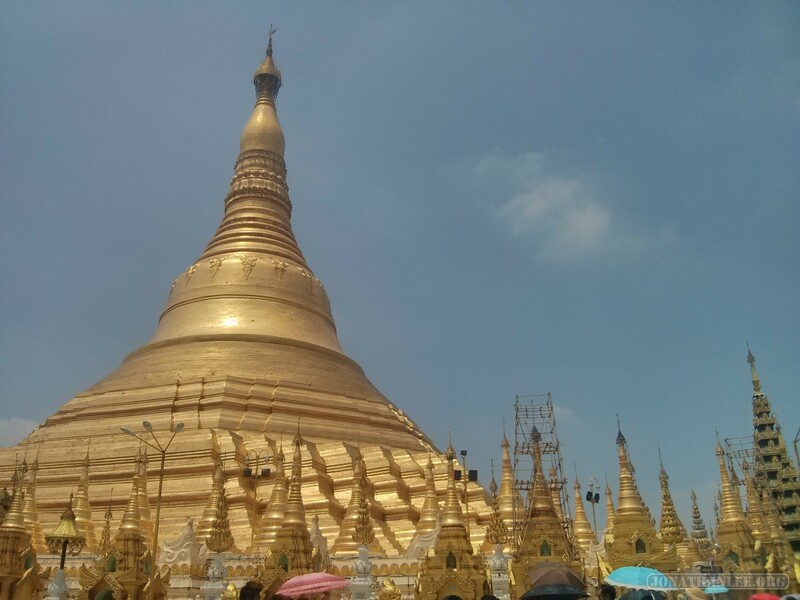 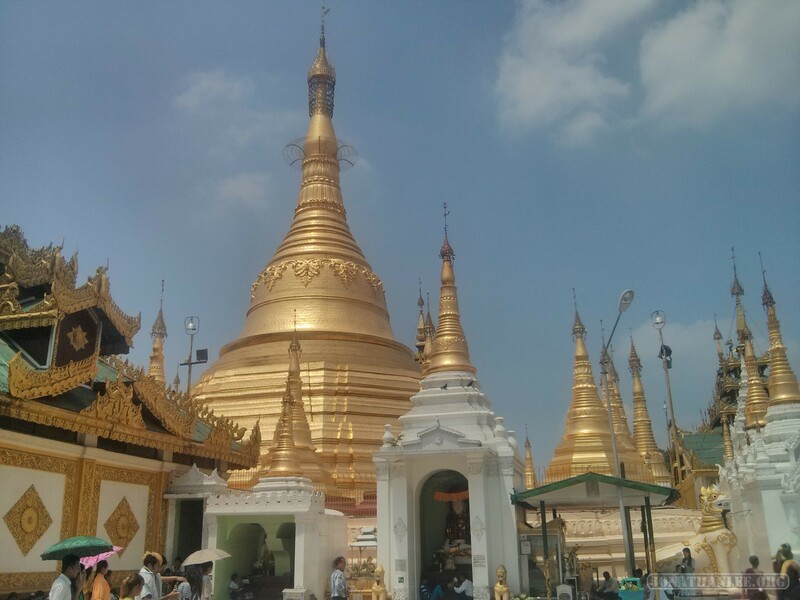 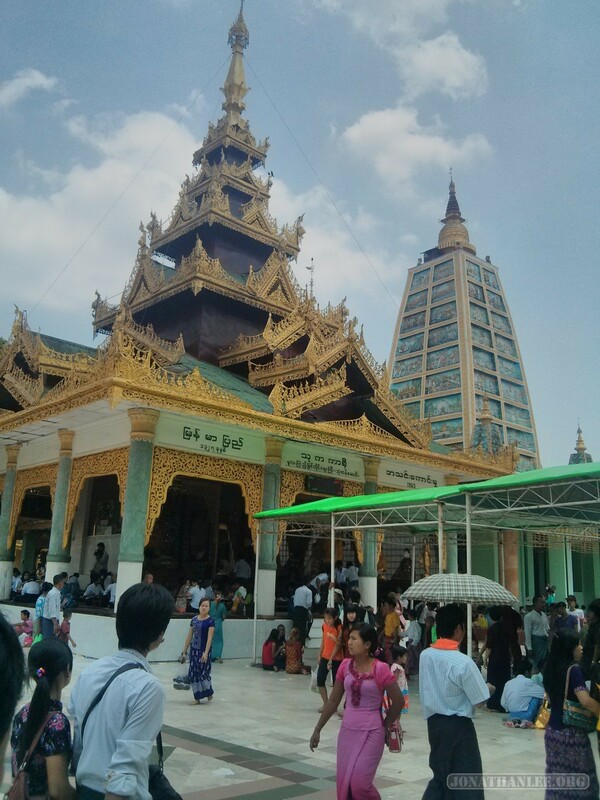 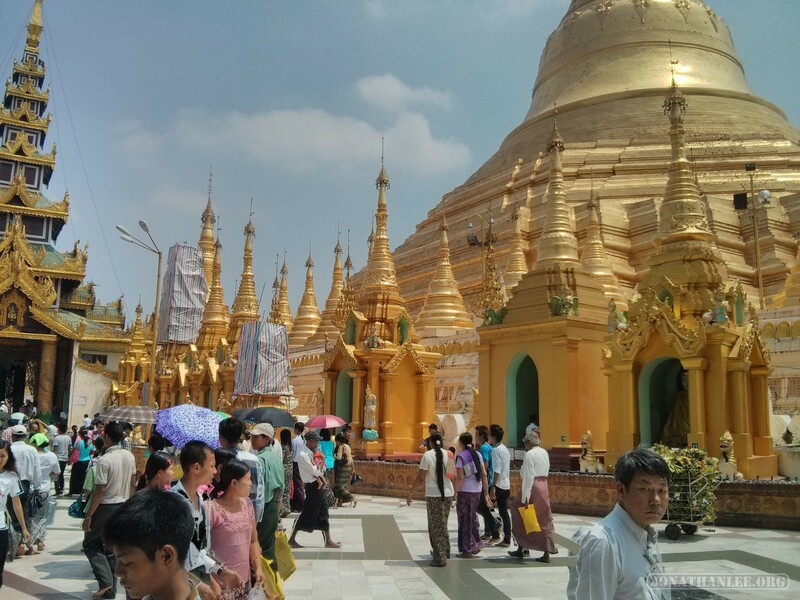 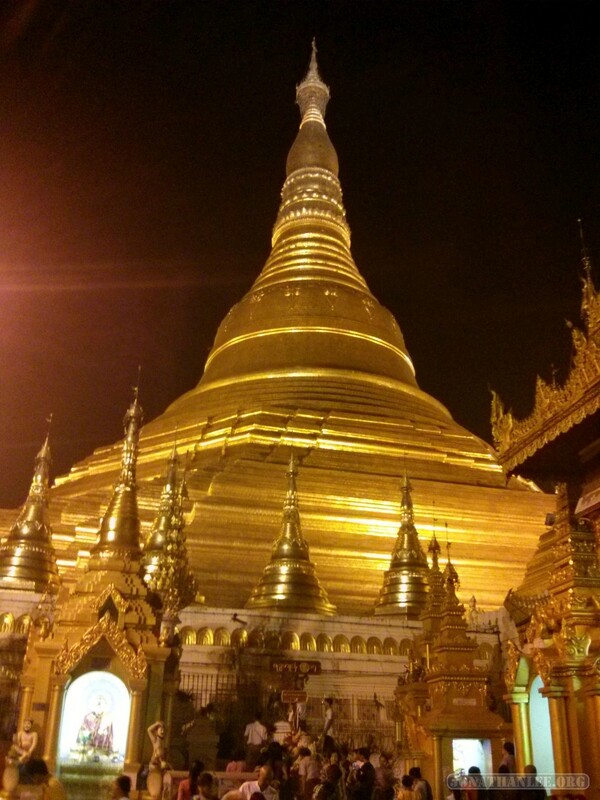 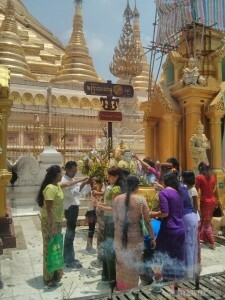 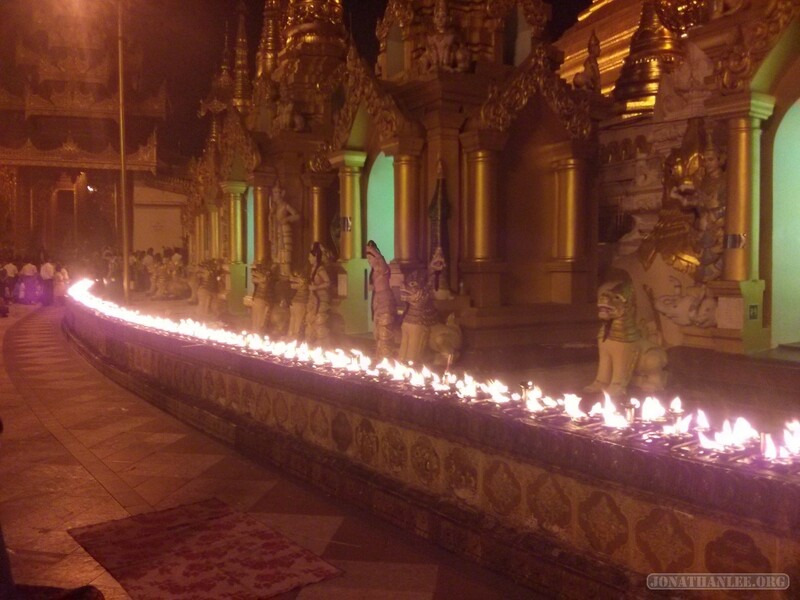 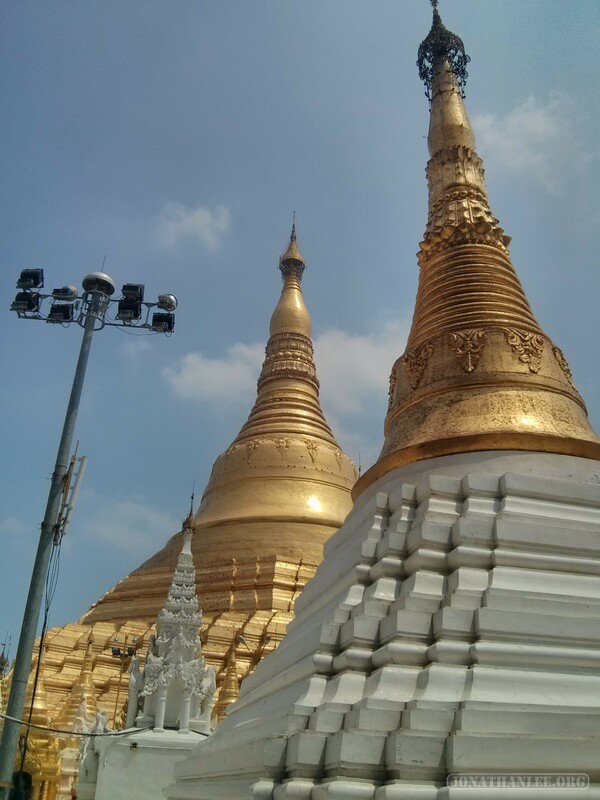 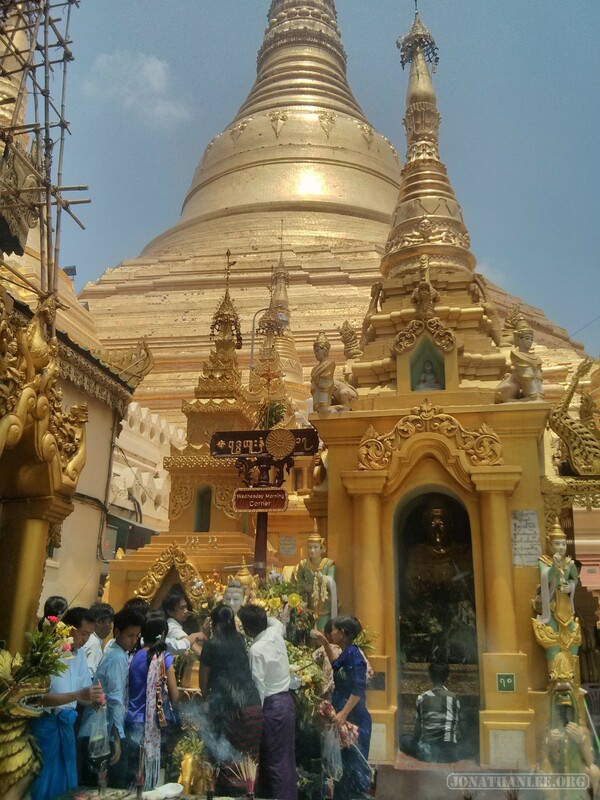 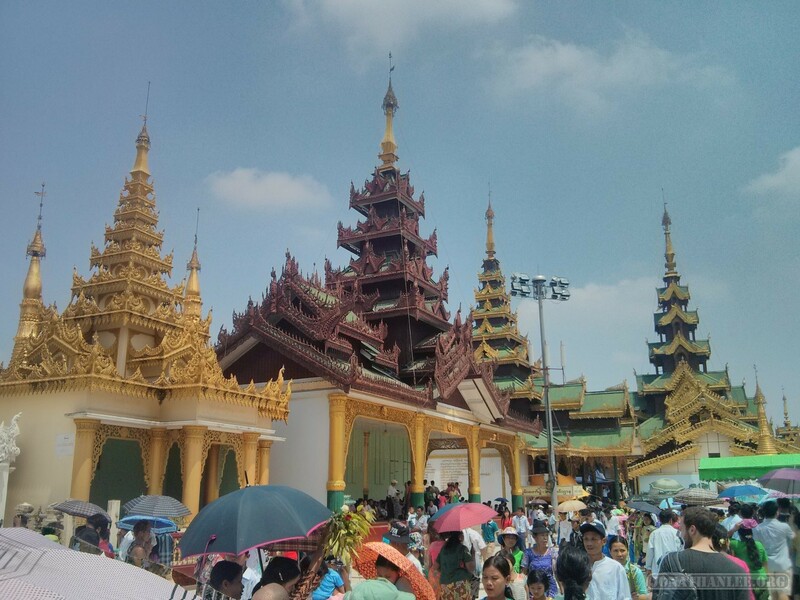 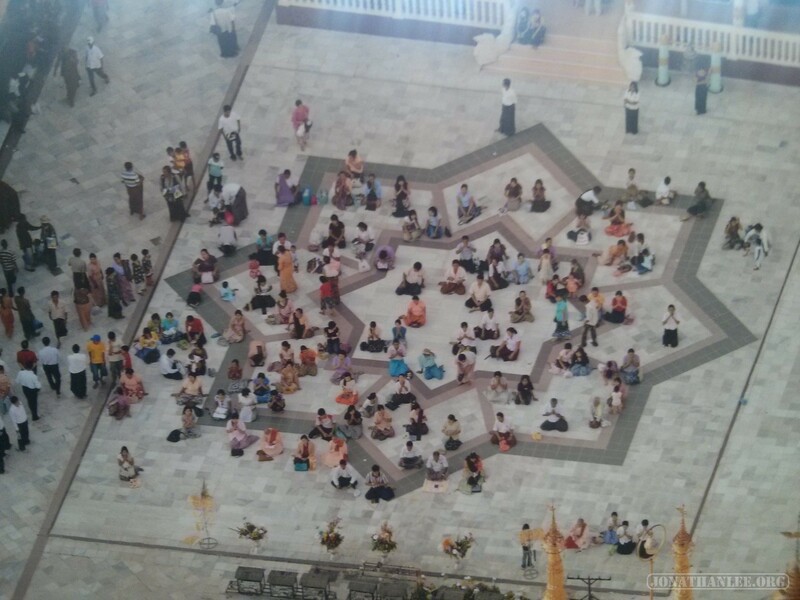 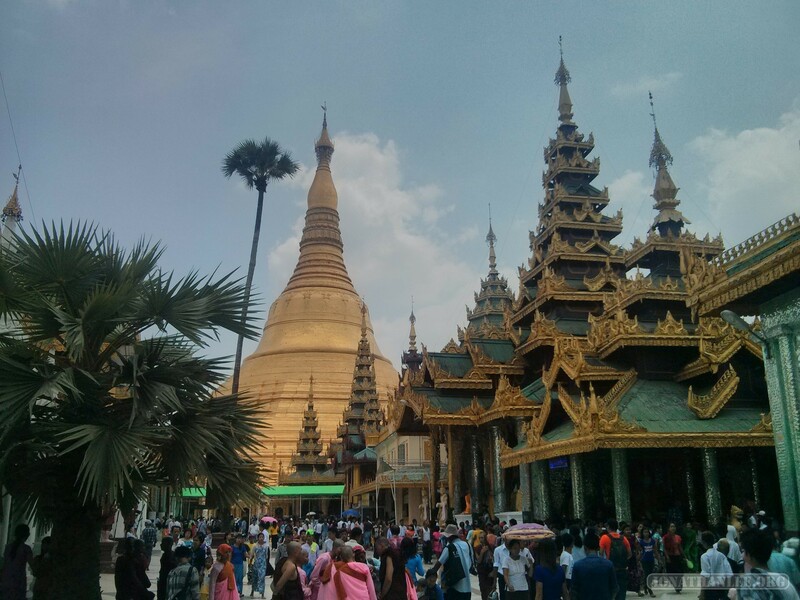 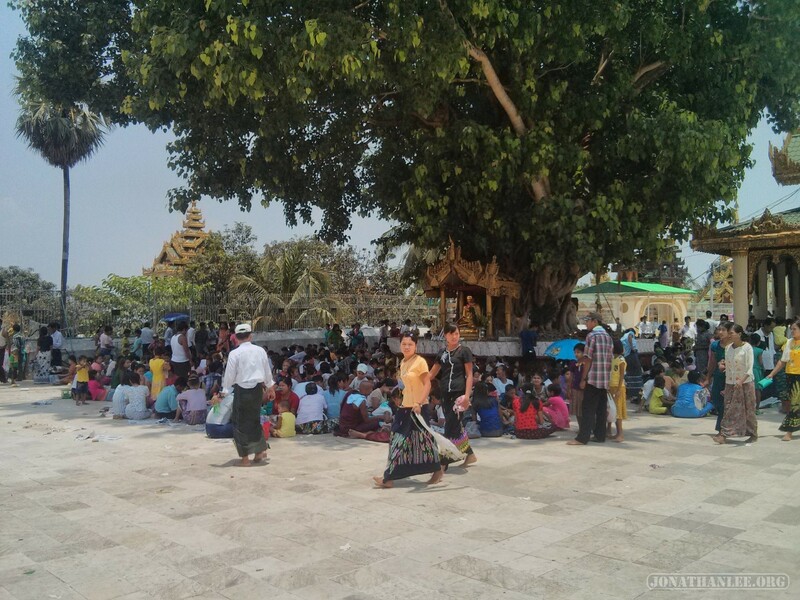 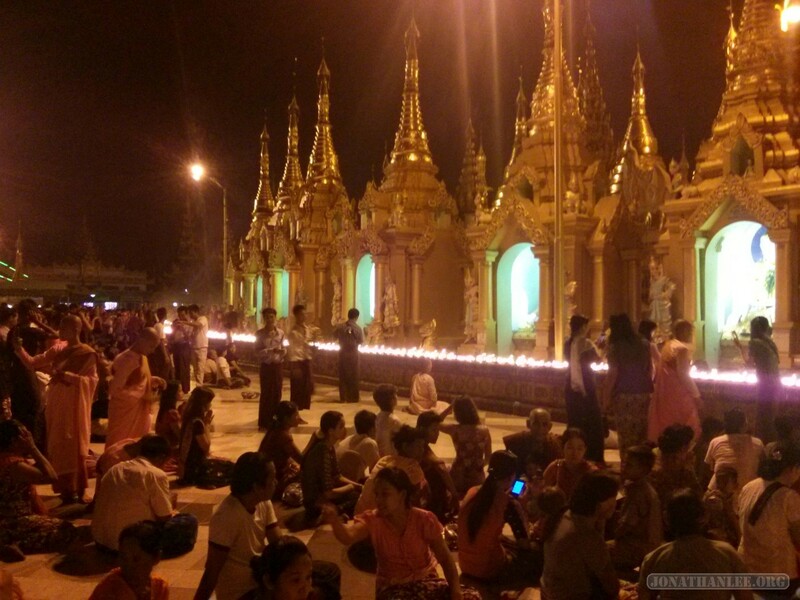 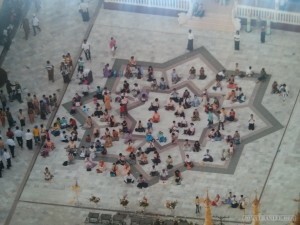 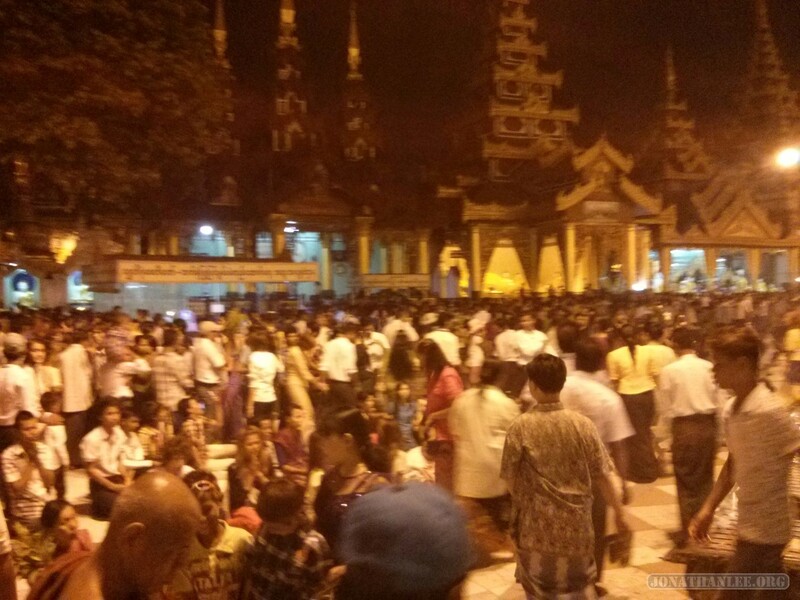 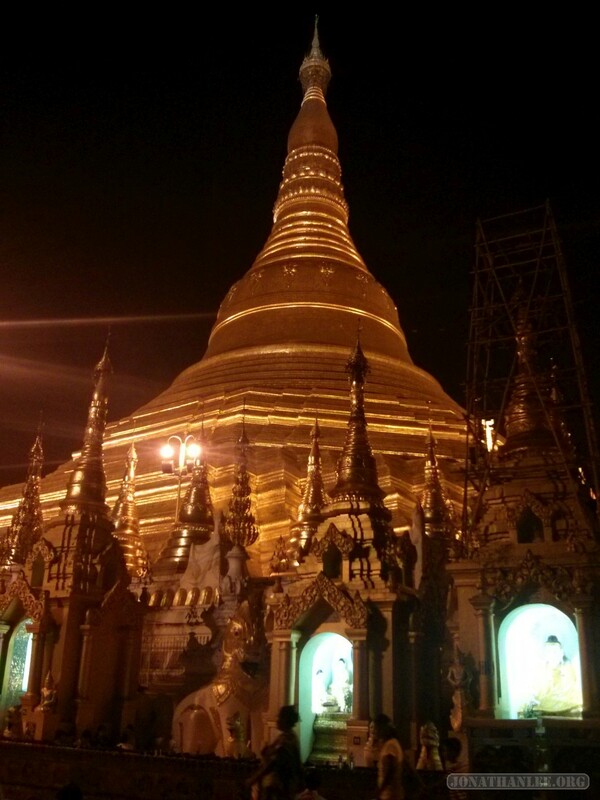 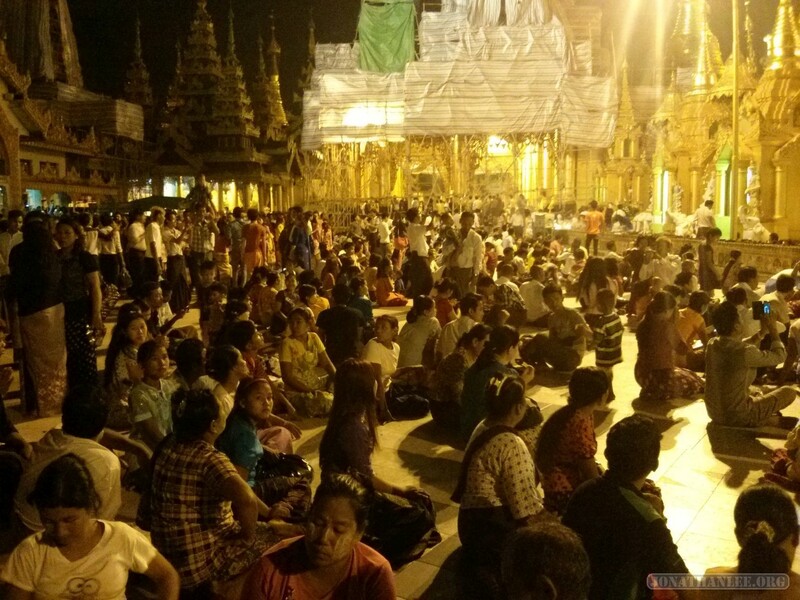 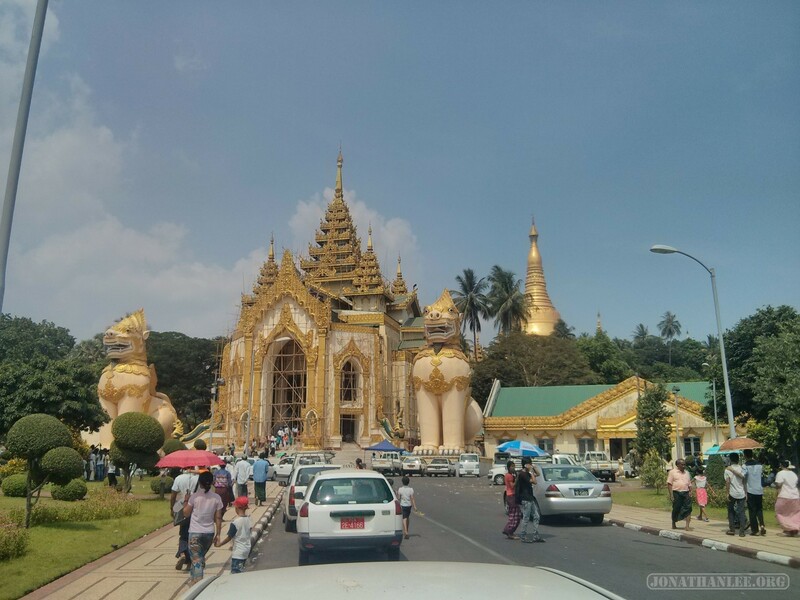 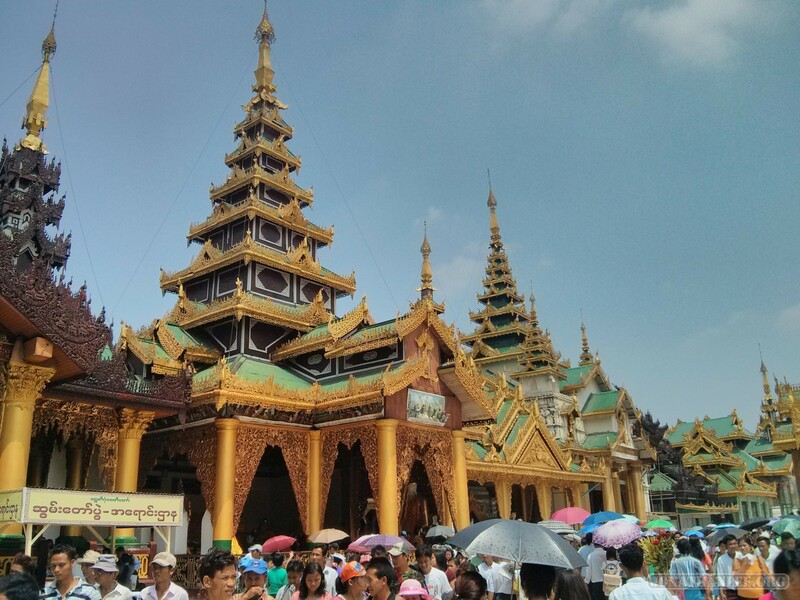 Everyone wants to go up to Shwedagon for New Years! 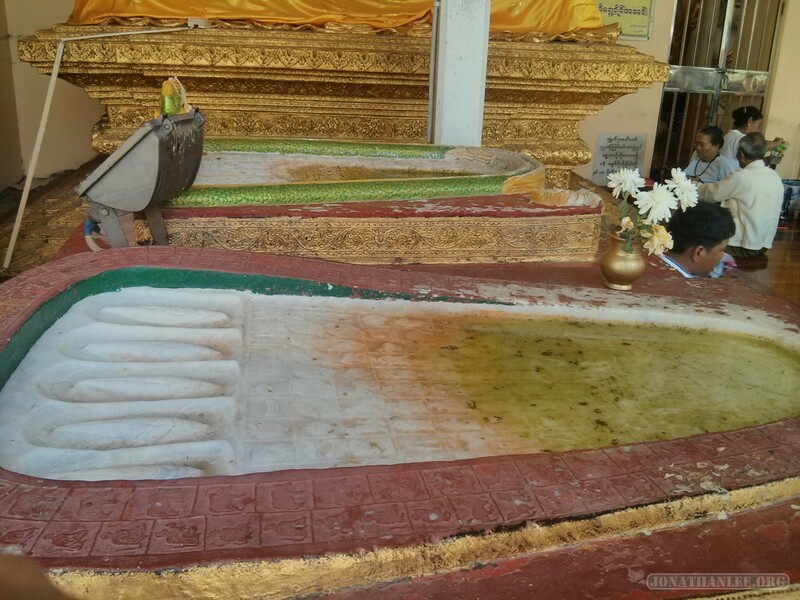 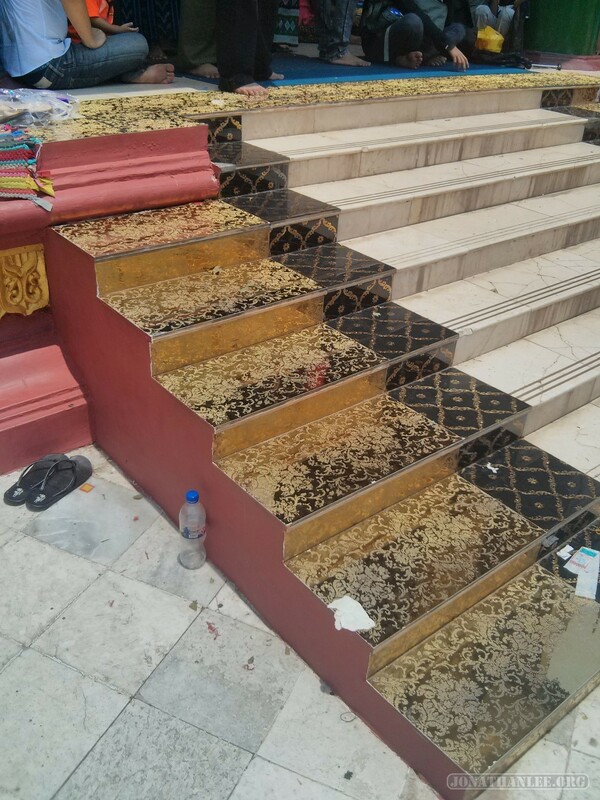 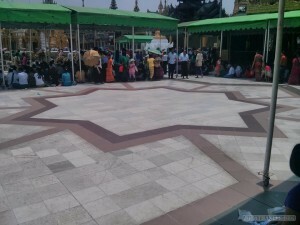 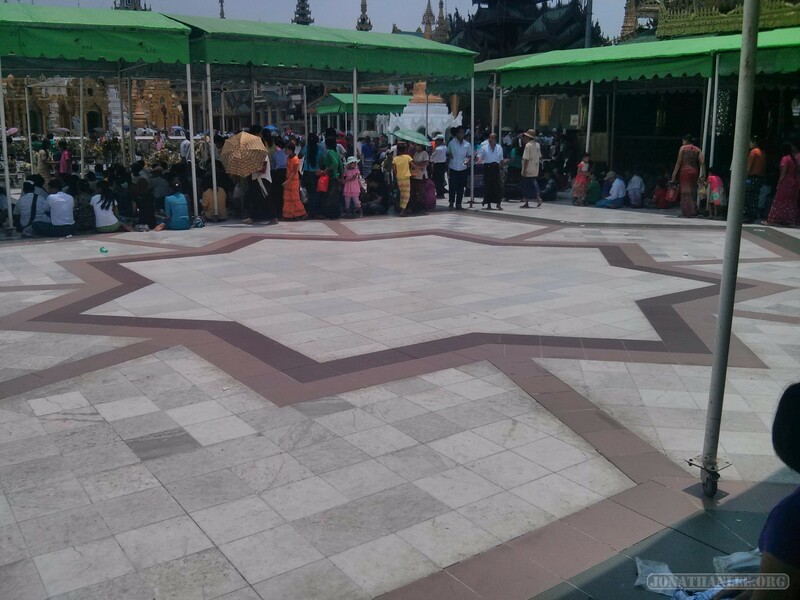 Did I mention that in Shwedagon, as well as all Burmese temples, you have to take off your shoes at the entrance? 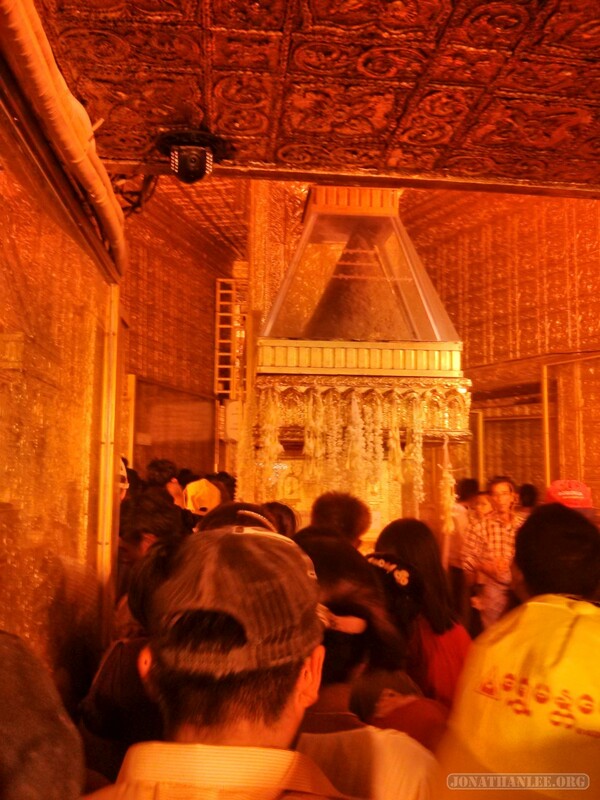 And then, once you get to the top, you have to walk around on bare feet, on hot stone marble floors. 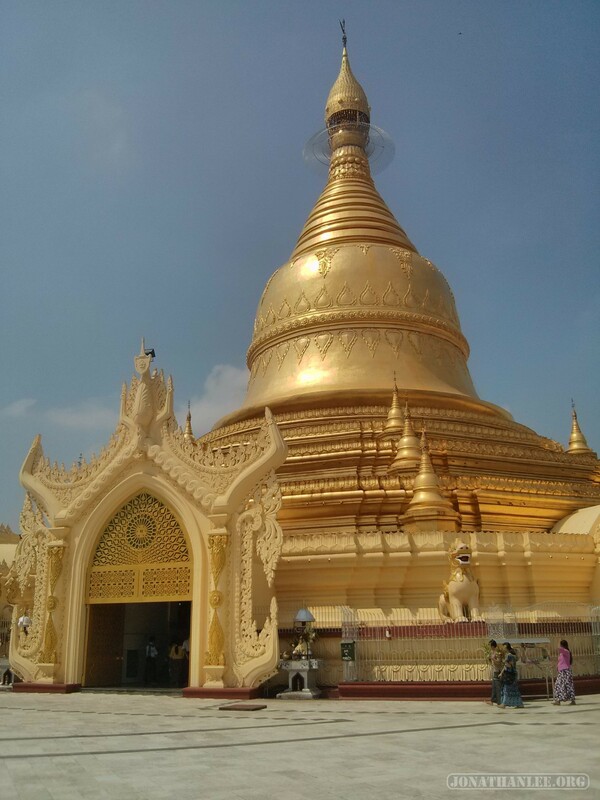 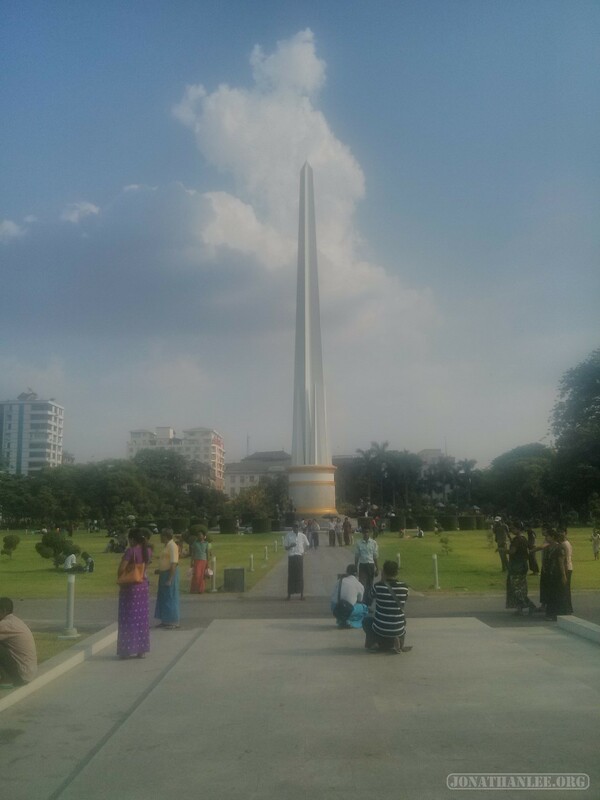 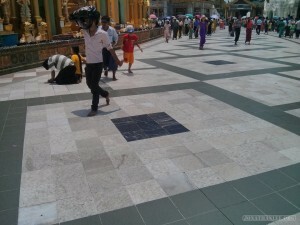 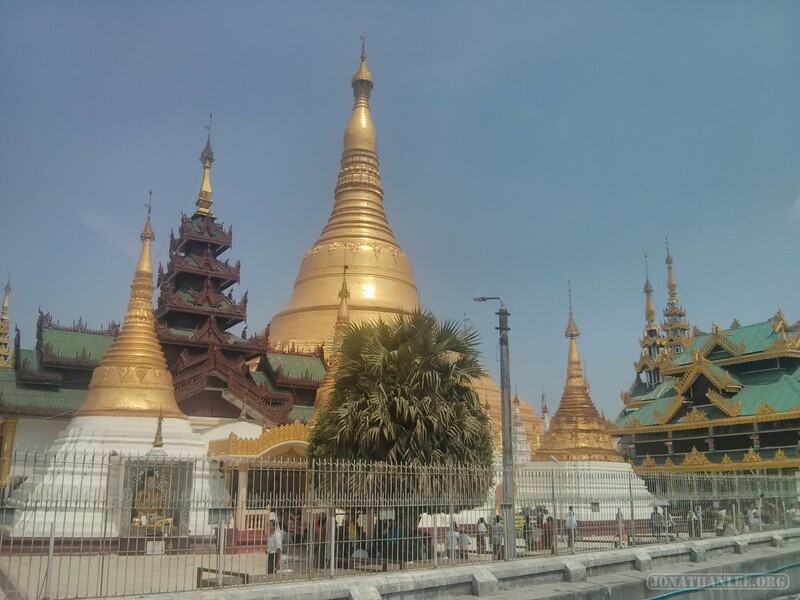 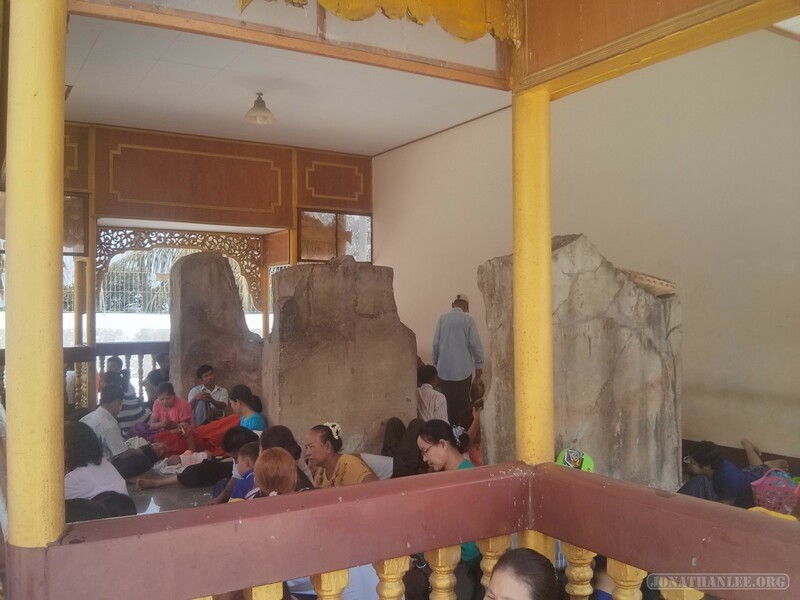 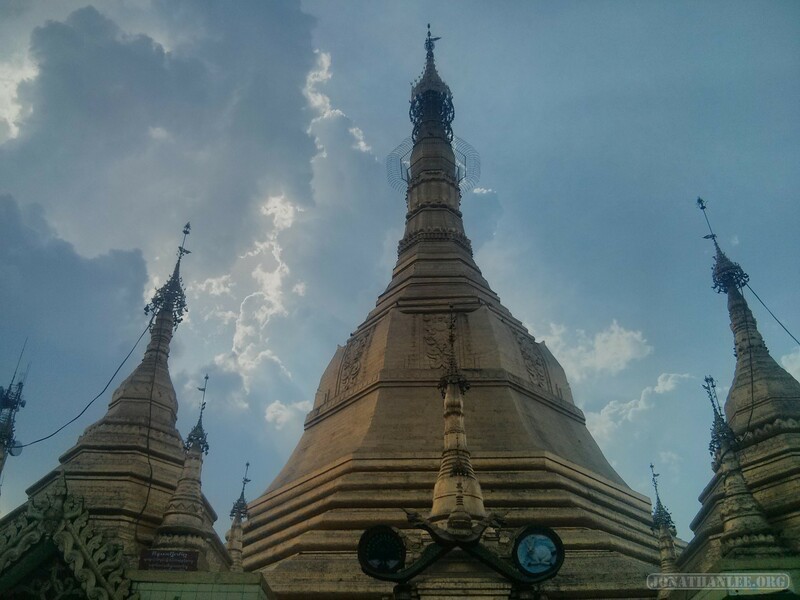 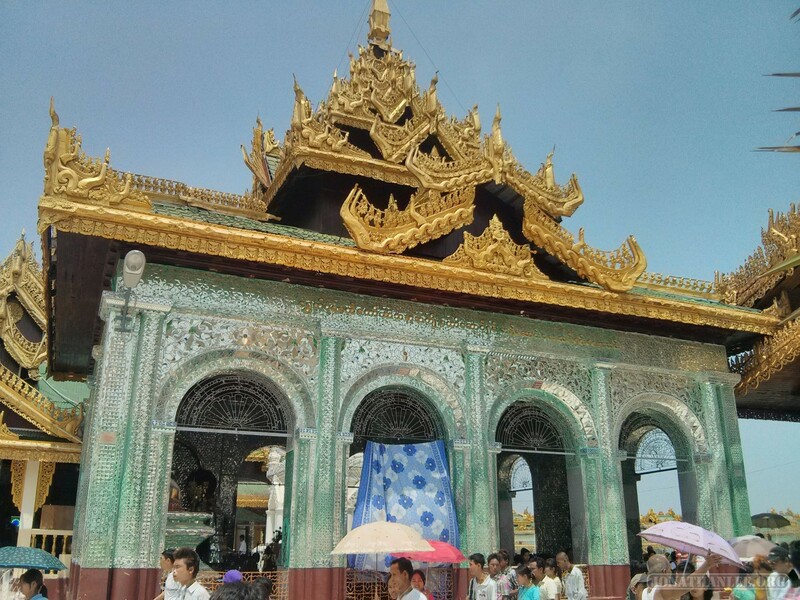 The white parts aren’t bad, but the black marble gets to be excruciatingly hot in the Burmese heat. 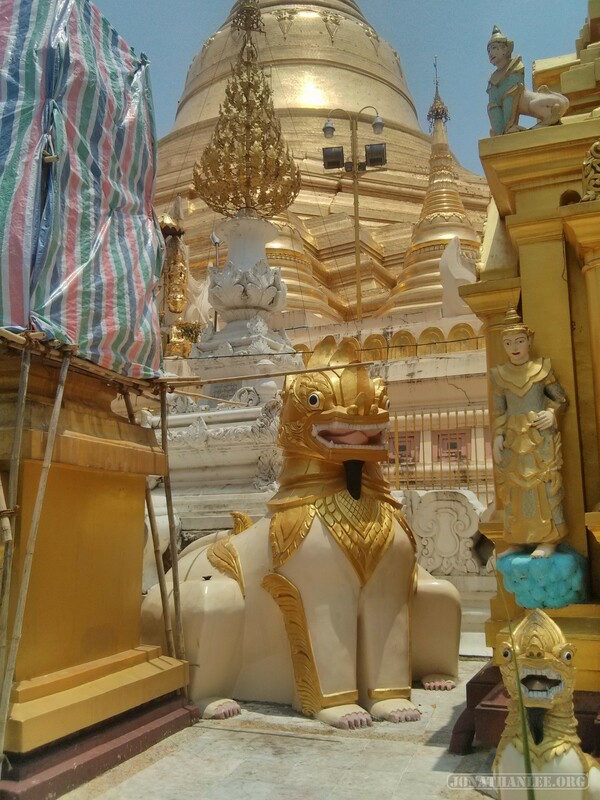 And surrounding it, a whole bunch of smaller stupas, spires, buildings with Buddha statues, and whatnot. 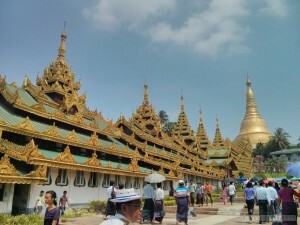 You notice that everything is golden, there are a ton of people especially inside buildings where it is cool, and everything looks quite fancy, fitting for a country’s more religious site! – These are the Buddhas for Thursday and Sunday, respectively. 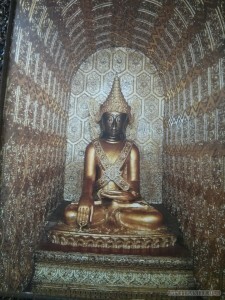 In the Myanmar calendar, there is a Buddha for each day of the week, except for Wednesday, which has two! 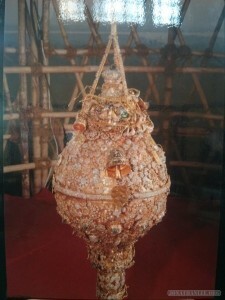 – At the very top of the main spire, you’ve got this diamond orb, with a total of 1,800 carats. 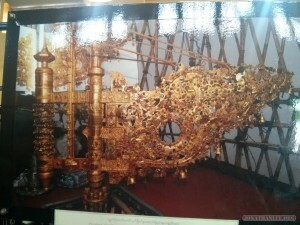 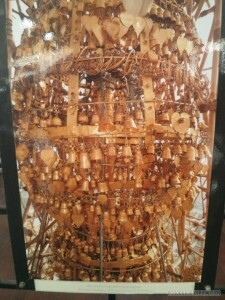 – As well as this gold vane, weighing 924 pounds. 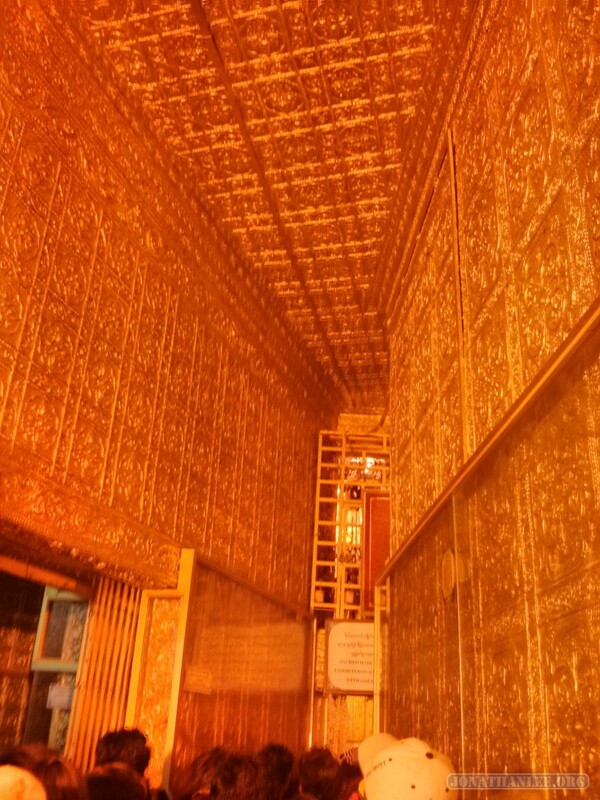 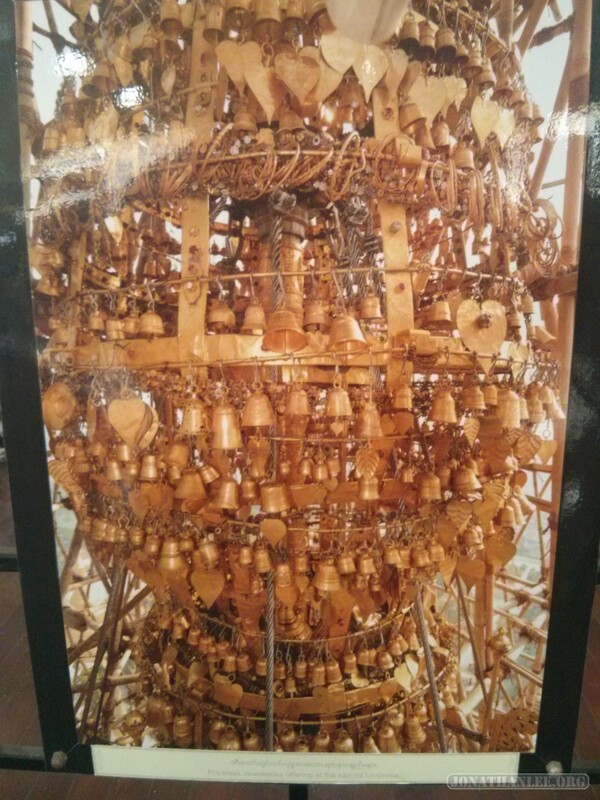 – Followed by this golden “umbrella”, weighing a whopping 5,000 kilograms (~5 tons), 1/10 of which is pure gold! 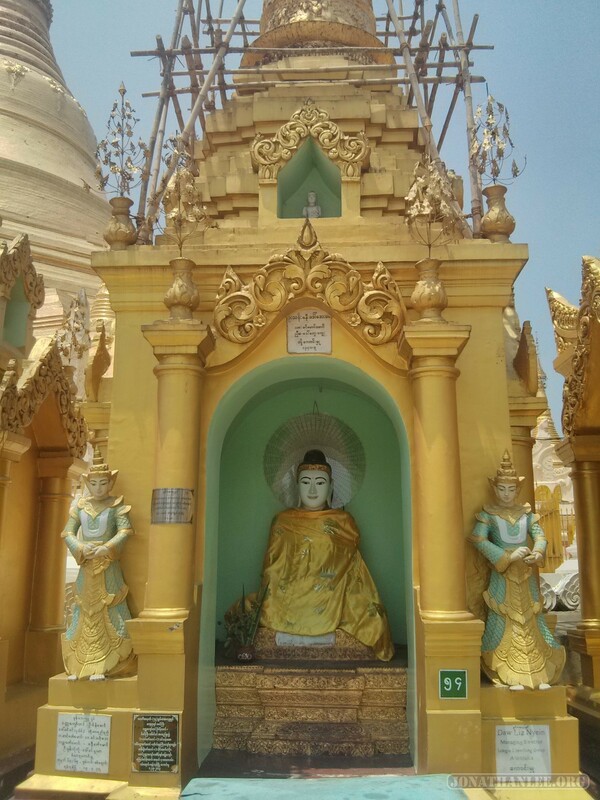 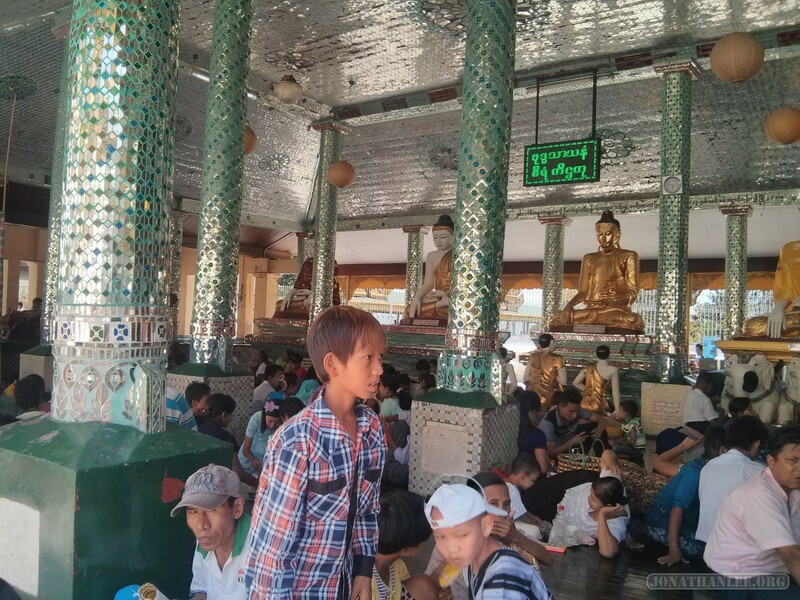 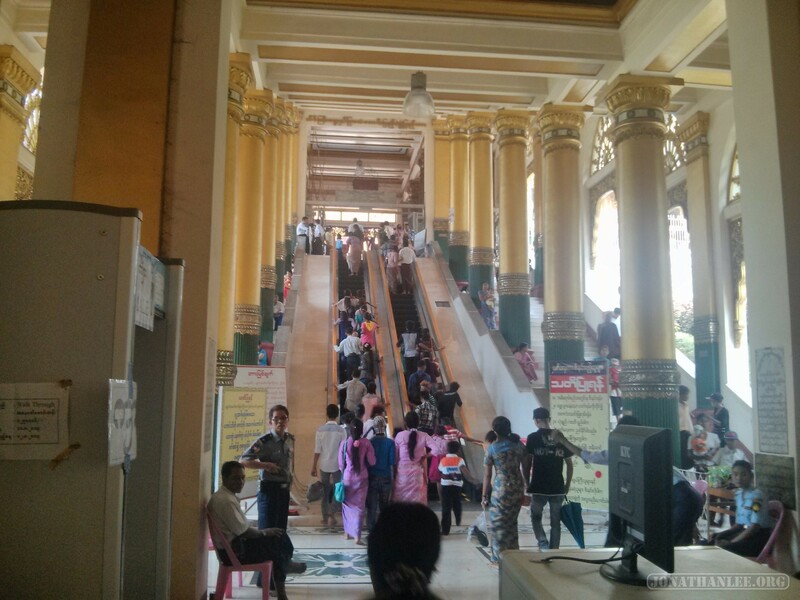 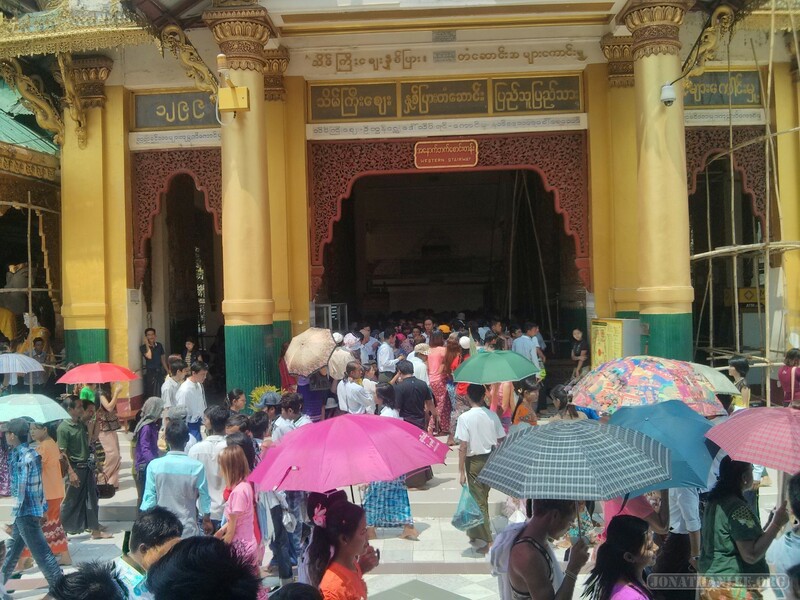 Since Shwedagon has four entrances, one for each cardinal direction, I took some time and explored those too – it’s mildly interesting, how each entrance is different, but all are quite crowded. 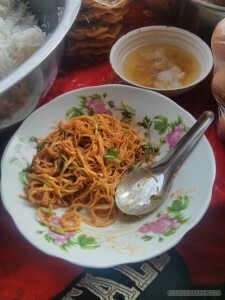 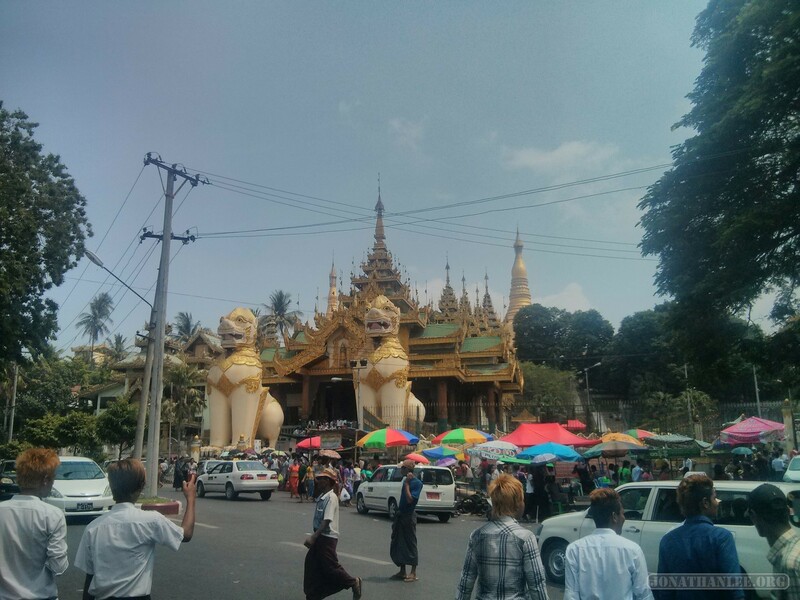 To the east of Shwedagon, there’s a large market of sorts, where I got some delicious lunch! 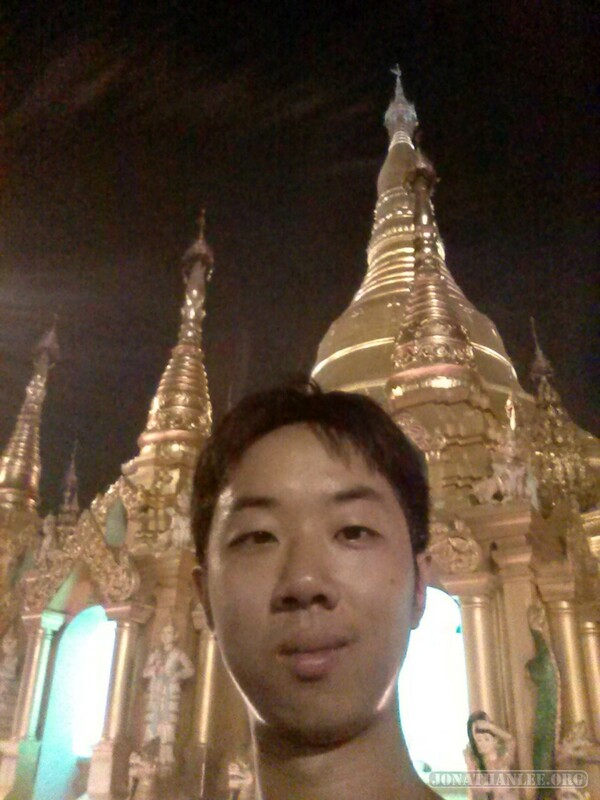 I initially went to Shwedagon during the afternoon, right at the peak of the midday heat, but then I also went back at night, trying to catch the sunset over the spire. 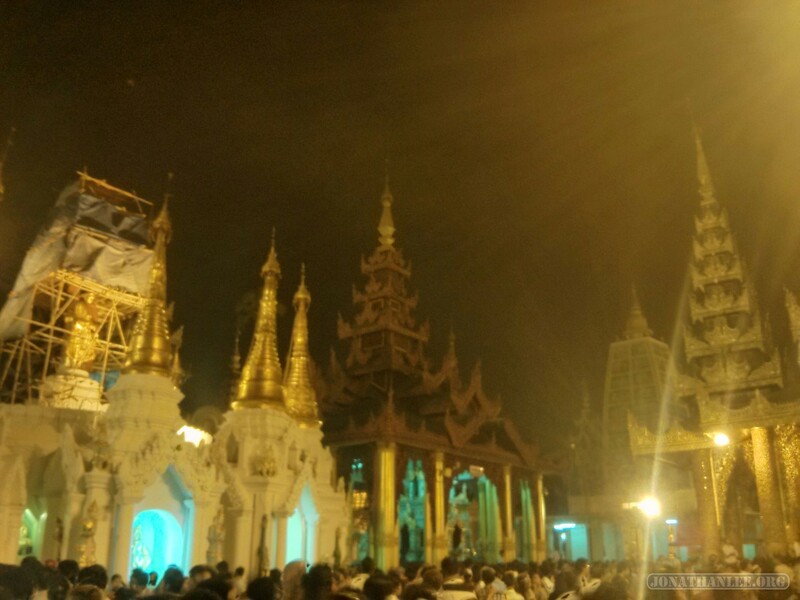 I was much too late, and missed the sunset, but got to see Shwedagon at night, which was pretty beautiful, as well as crowded – in the cooler night temperatures, a lot more people came out to enjoy the ambiance at Shwedagon! 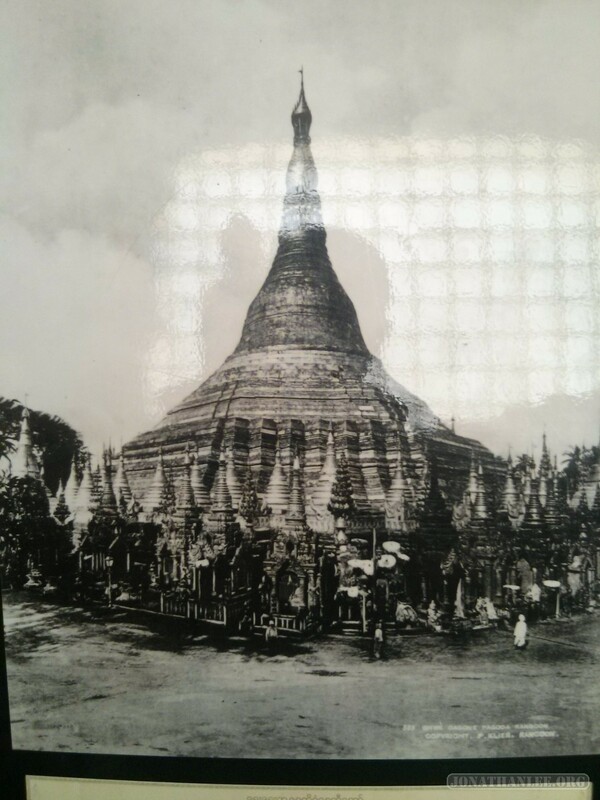 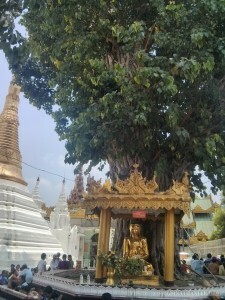 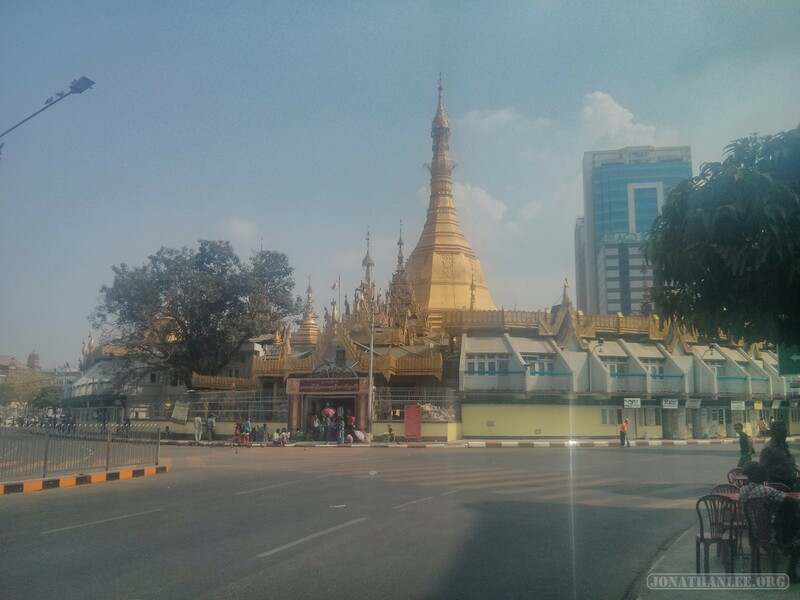 Right southeast of Shwedagon is Maha Wizaya Pagoda, which I initially though was part of Shwedagon. 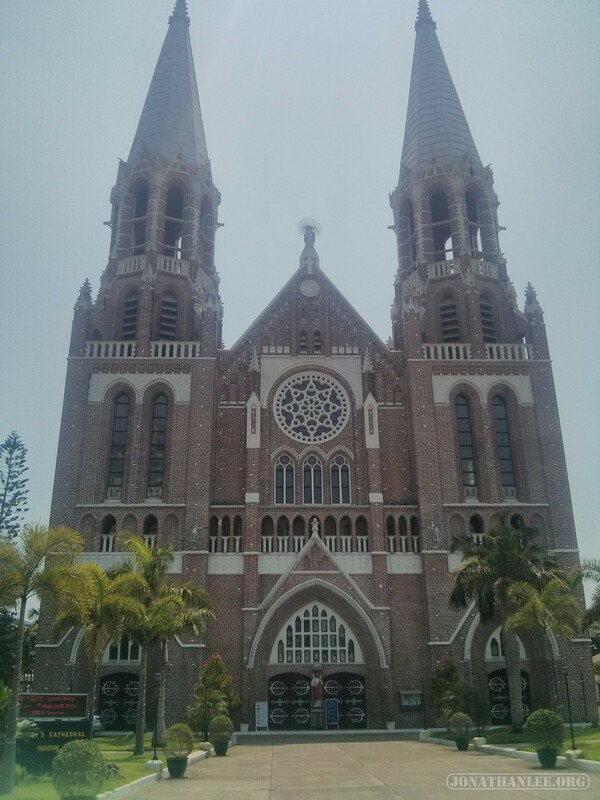 A couple of weeks ago, I read a description of churches in Medieval England as being centers of social activity. 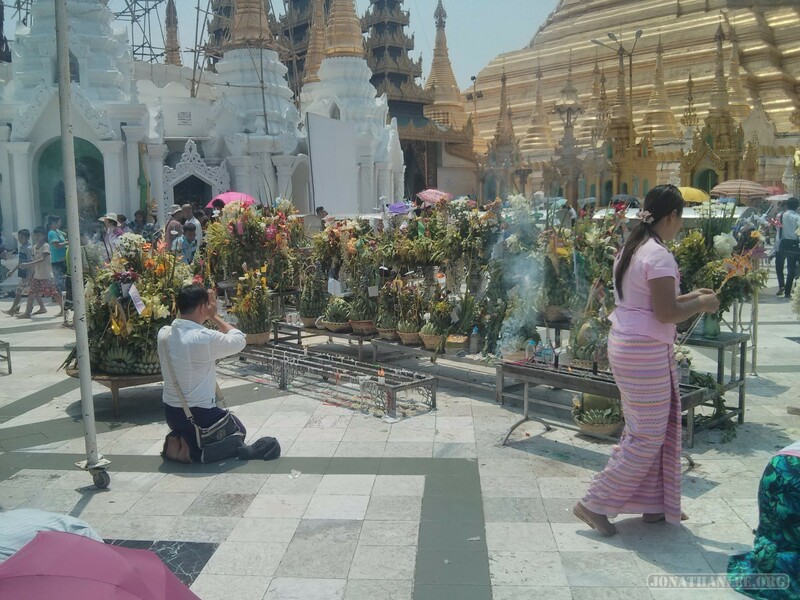 Sure, there would be the priests praying and doing their thing, with some people in attendance, but there would also be plenty of people doing business, sitting around, or just socializing. 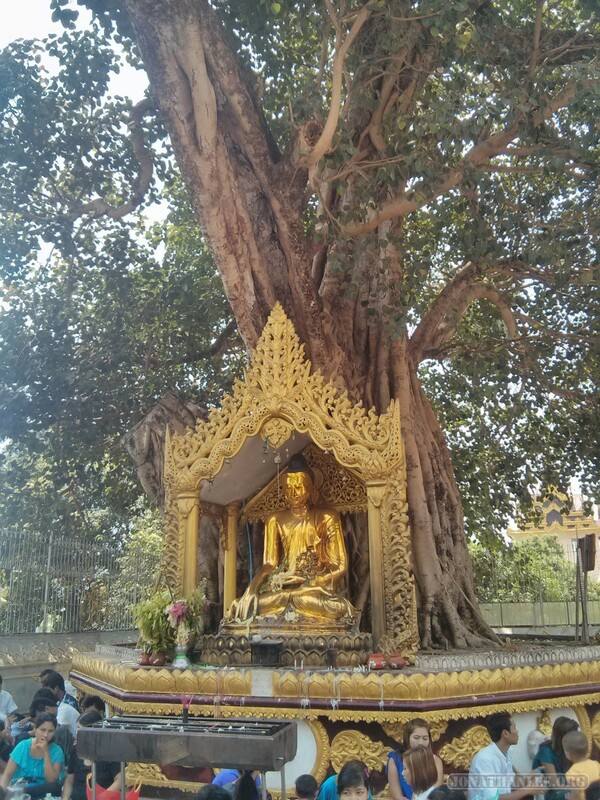 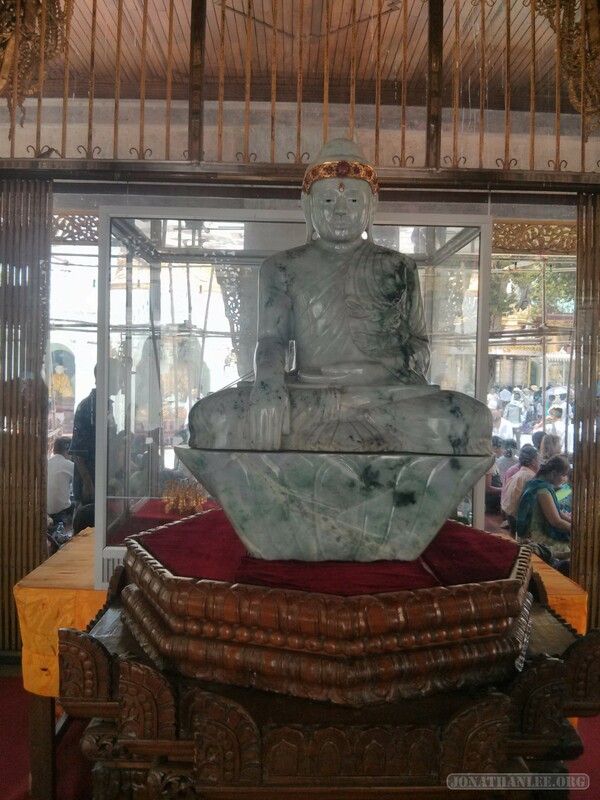 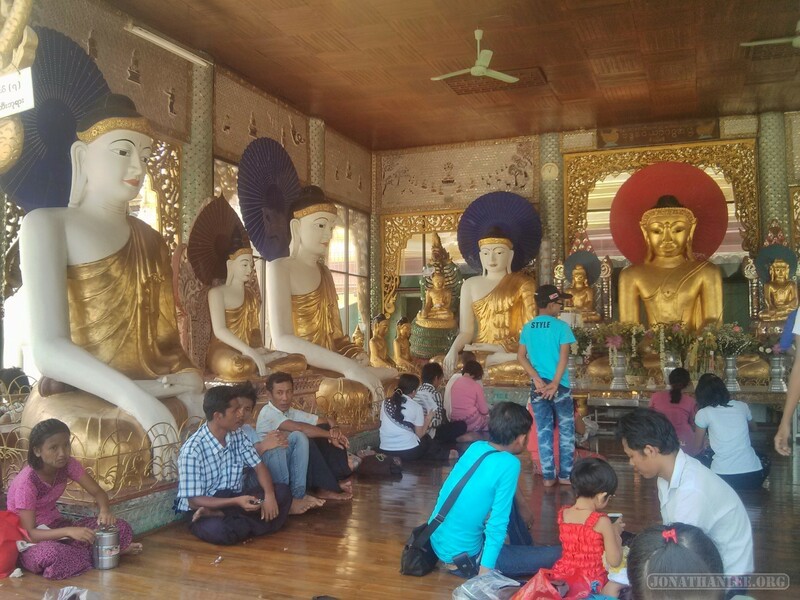 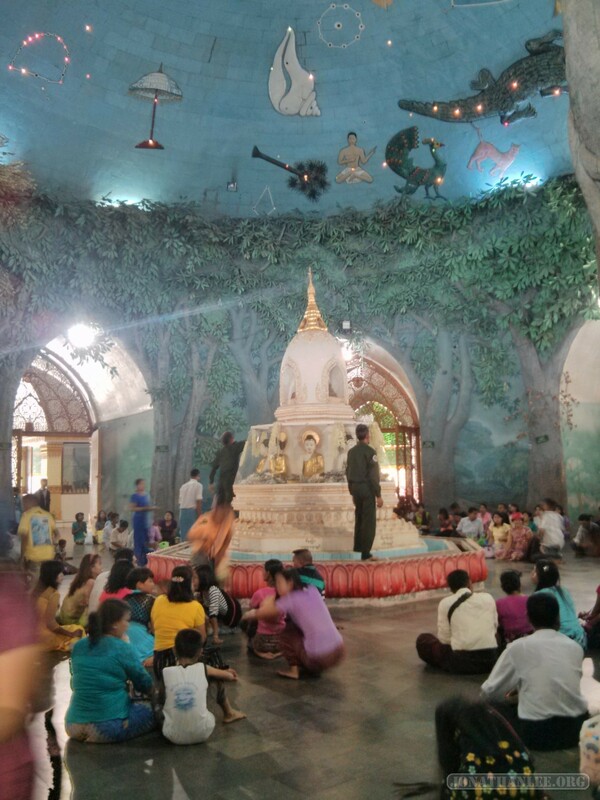 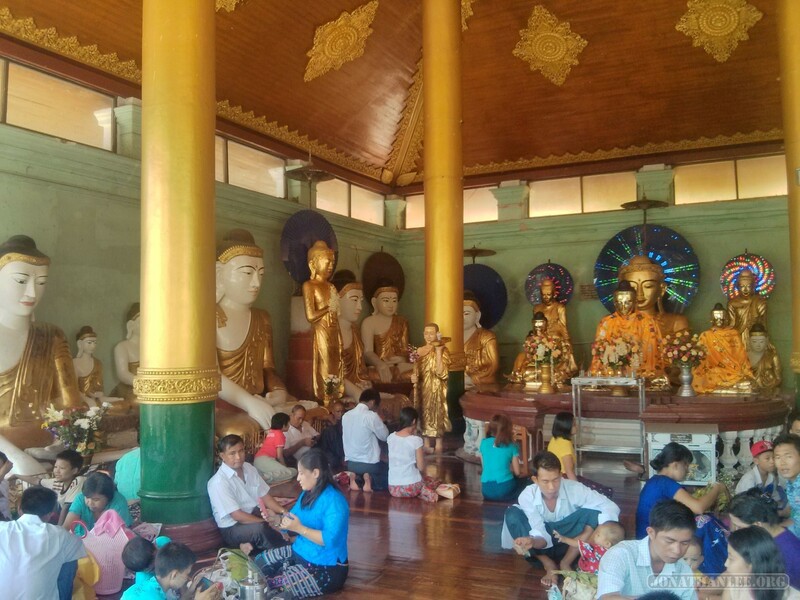 Sitting here for a bit, Maha Wizaya (and Shwedagon Pagoda) reminded me a lot of that description – there were some folks standing around teaching / telling a story to some kids, a whole crowd of people just sitting around, and some folks washing / rinsing a buddha statue. And outside, there was a large and crowded market – including vendors selling birds that you can buy and then set free for good karma! 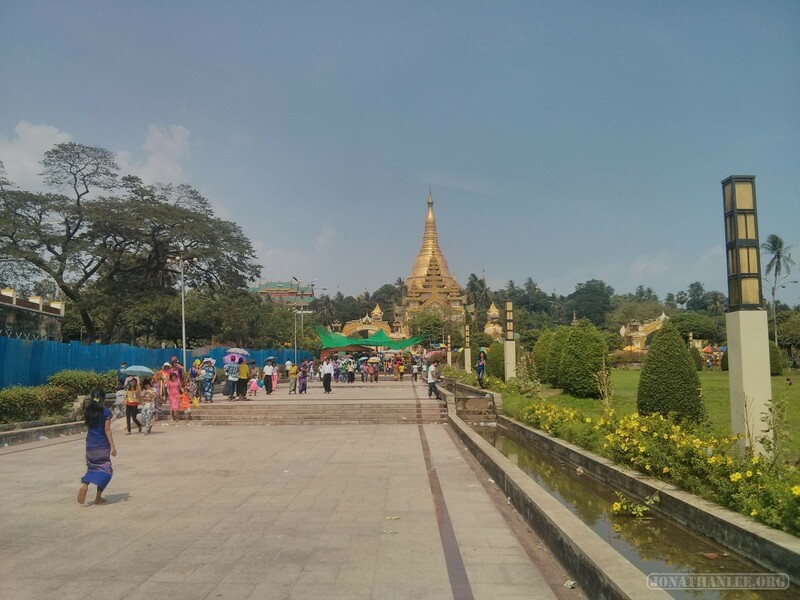 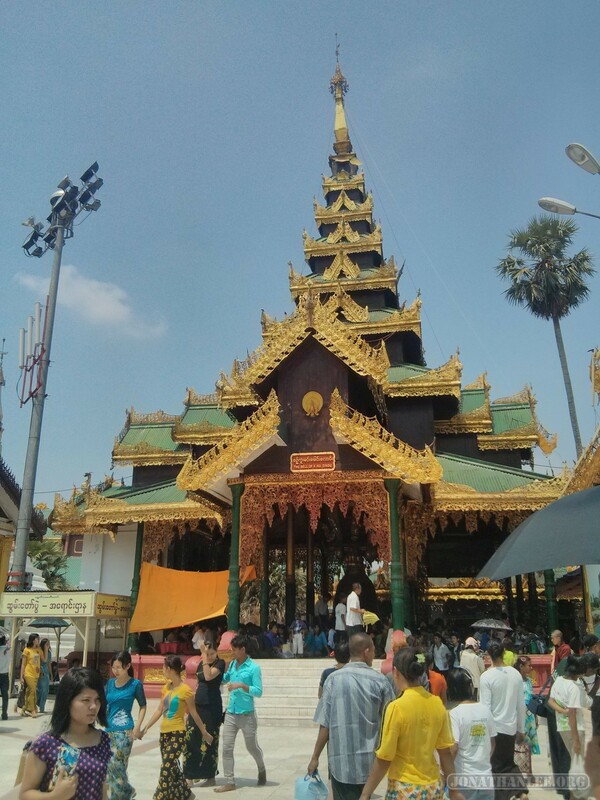 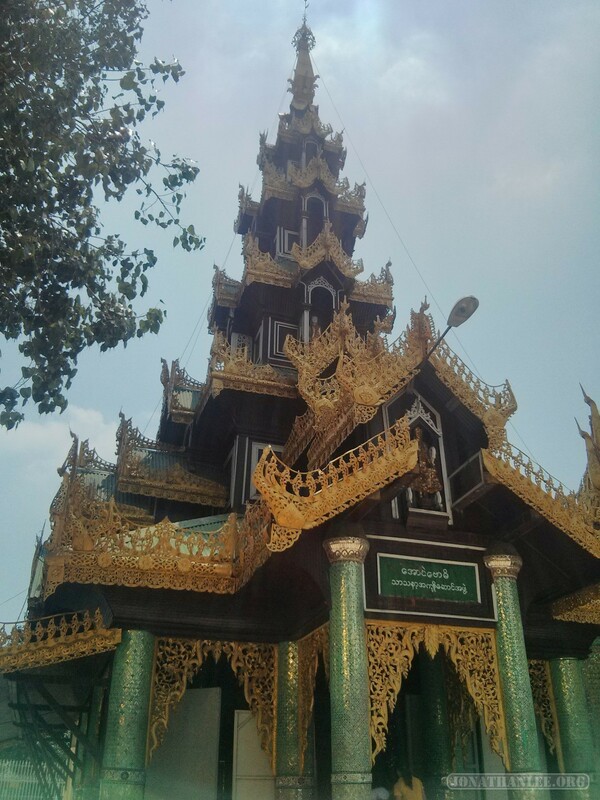 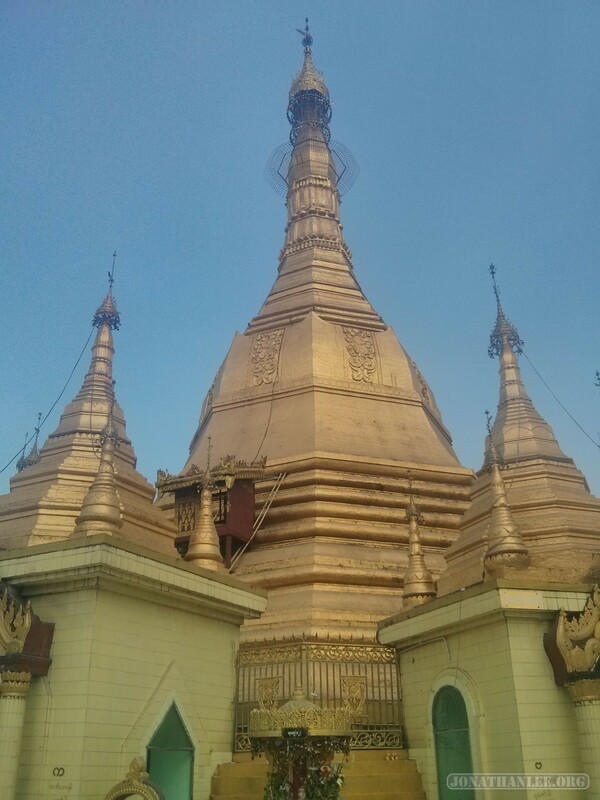 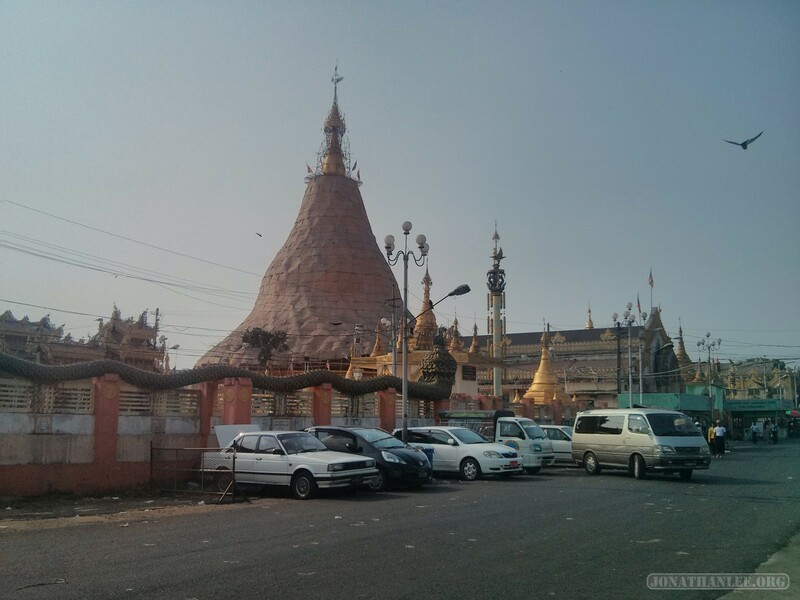 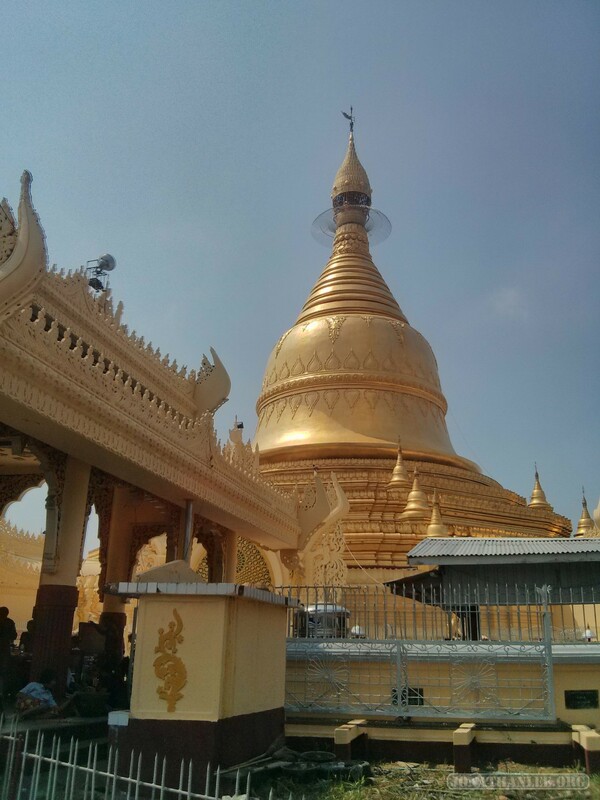 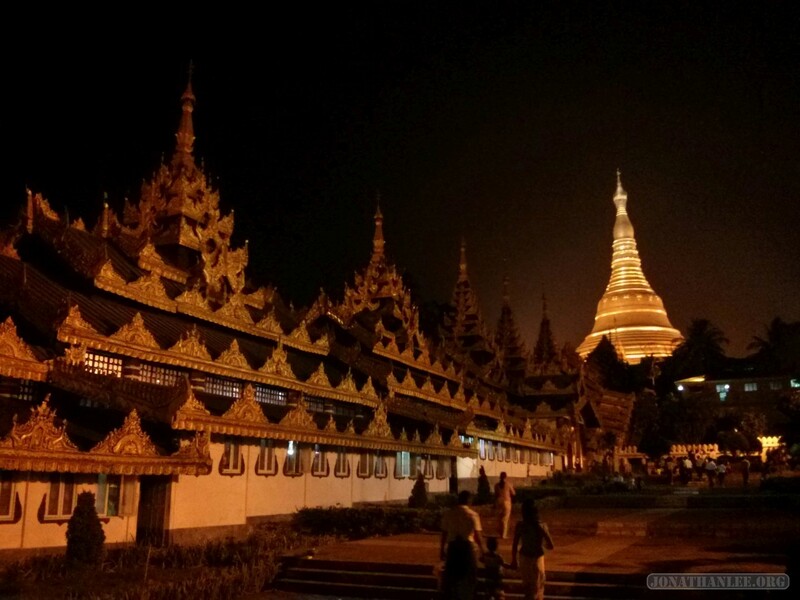 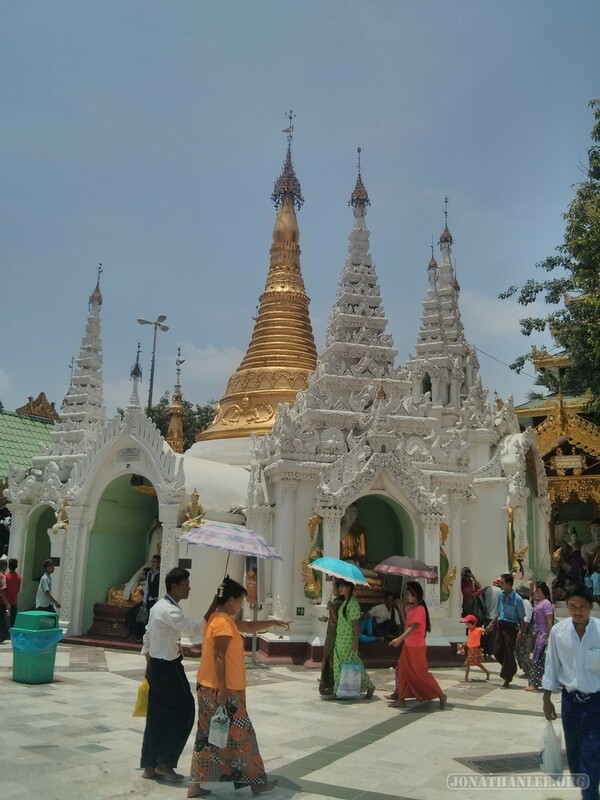 Sule Pagoda is also a pretty important pagoda in Burmese culture, and it’s located in the middle of a roundabout. 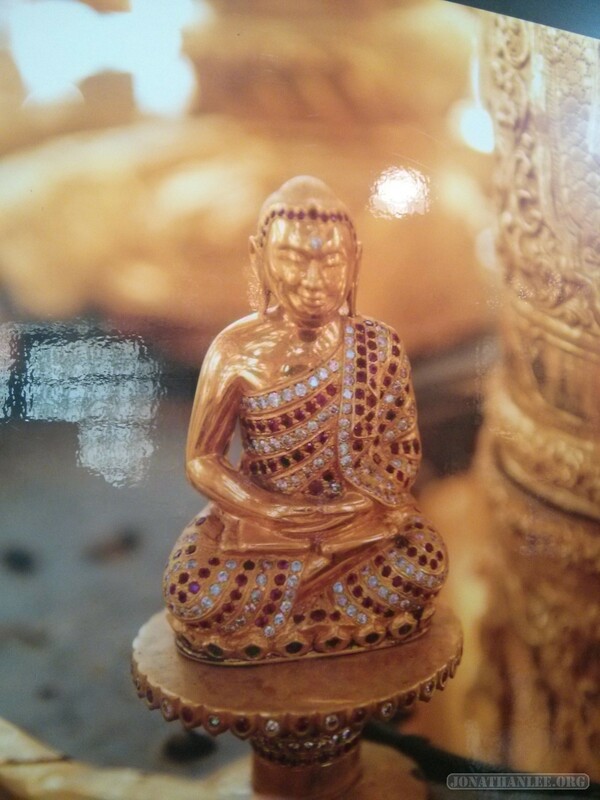 I’m not sure why it’s so important, it seemed rather small. 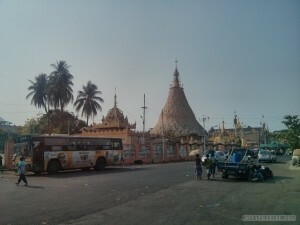 Maybe it’s famous because it’s right near the tourist district, where all the hotels are? 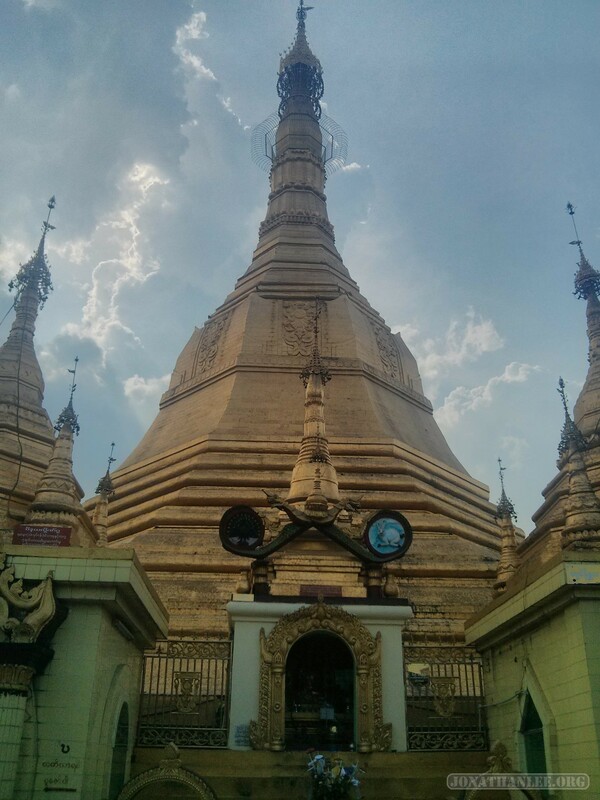 In any case, the pagoda is a rather dull. 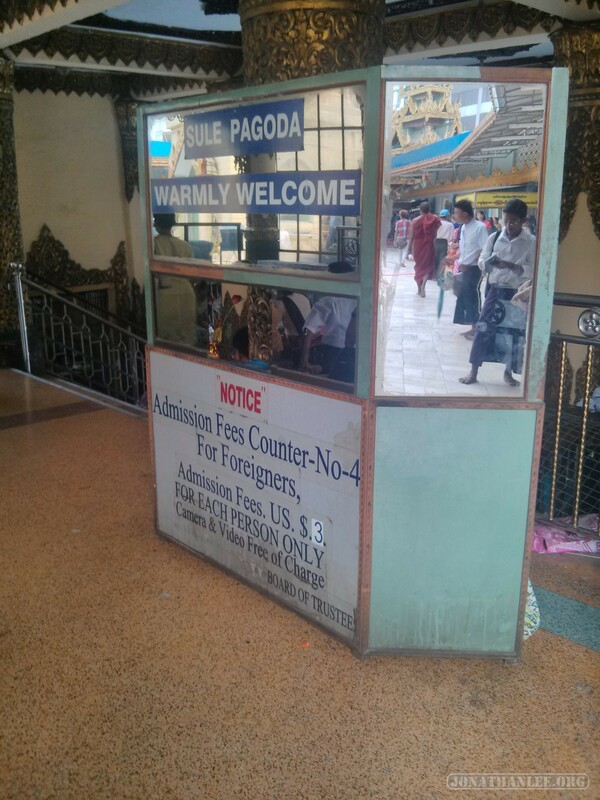 In fact, the most remarkable feature is that given its smallness, at each of its four entrances, there is a booth charging admission – but only to foreigners. 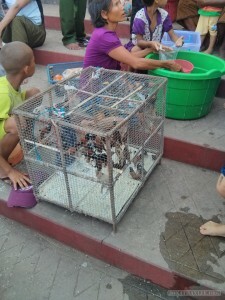 This kind of thing just annoys me, the whole hose-the-foreigners mentality. 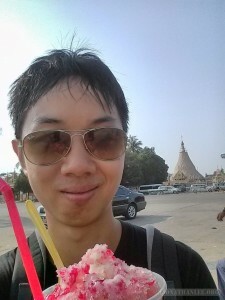 Sure, there are some things that only foreigners buy, and I don’t mind paying a bit extra for those, but if I’m doing the same thing a local might do, there’s no reason for it to cost extra! Combined with the lack of anything interesting in Sule pagoda, the entire thing just left a bad taste in my mouth. 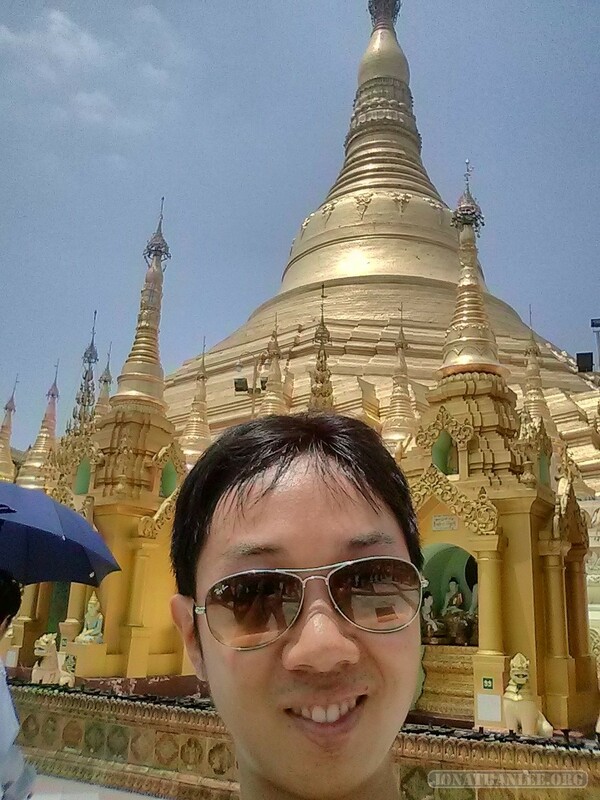 Sure, it’s not a huge admission cost, but it’s the principle that matters. 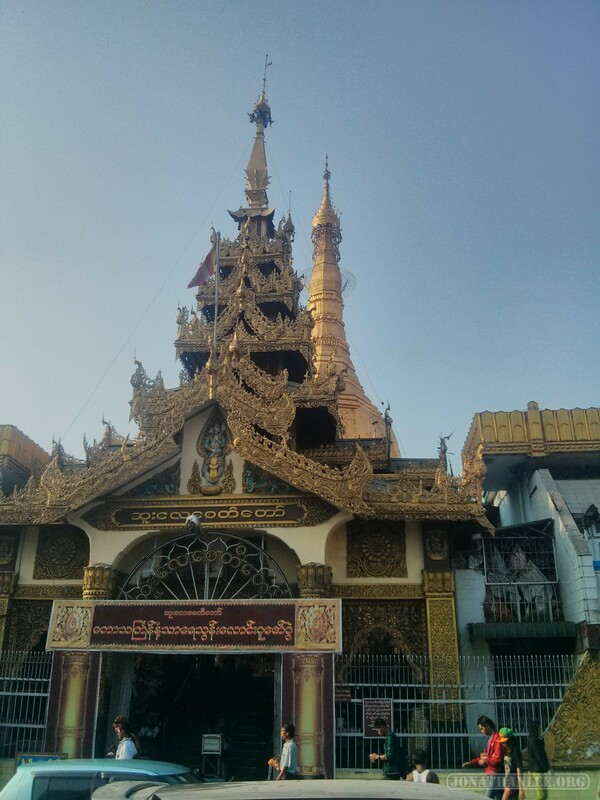 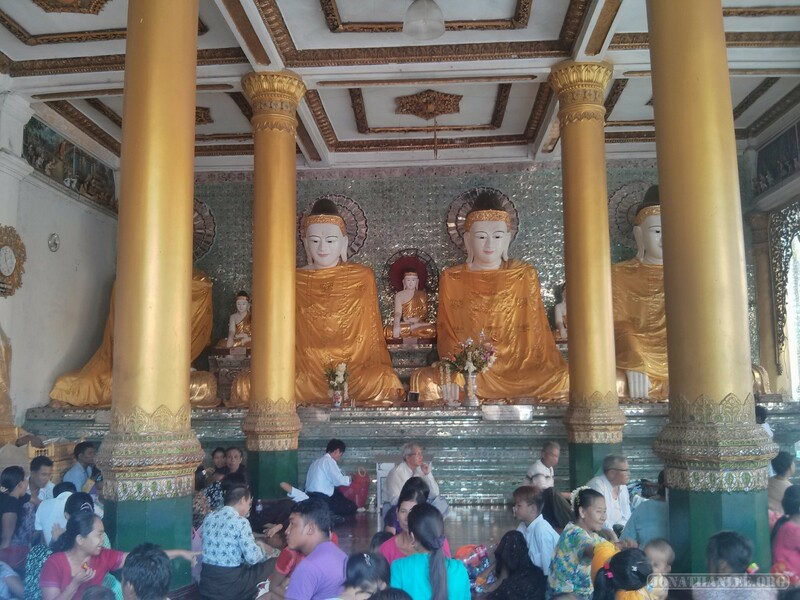 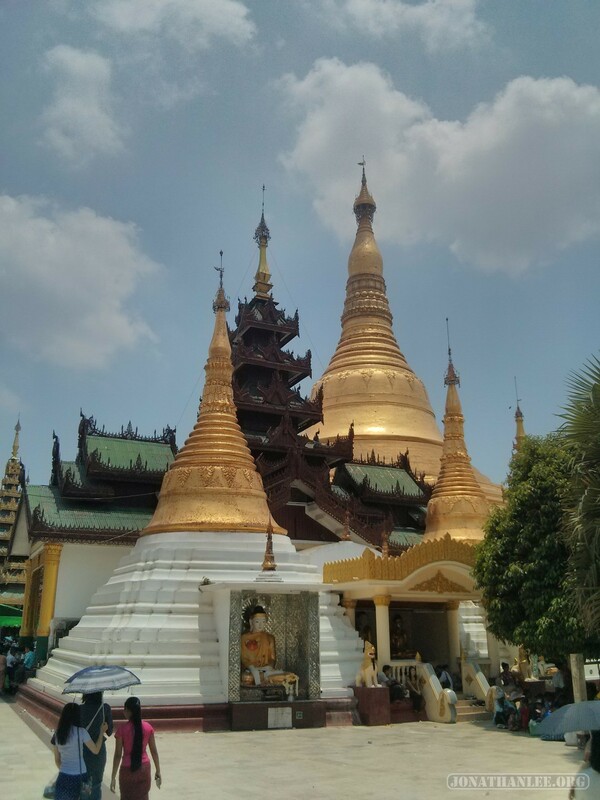 Botahtaung Pagoda is another big pagoda in Yangon, famous for supposedly holding some of Buddha’s hair (?). Like Sule and Shwedagon, this is a pay-to-enter pagoda for foreigners, but I managed to wander in through a side entrance. 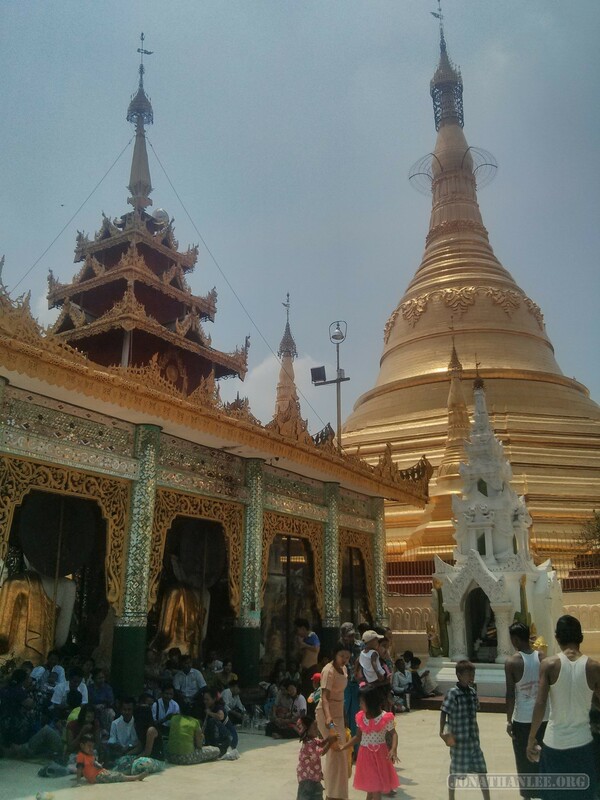 The pagoda itself seemed ordinary enough, but it seemed to have a food giveaway for the new year. 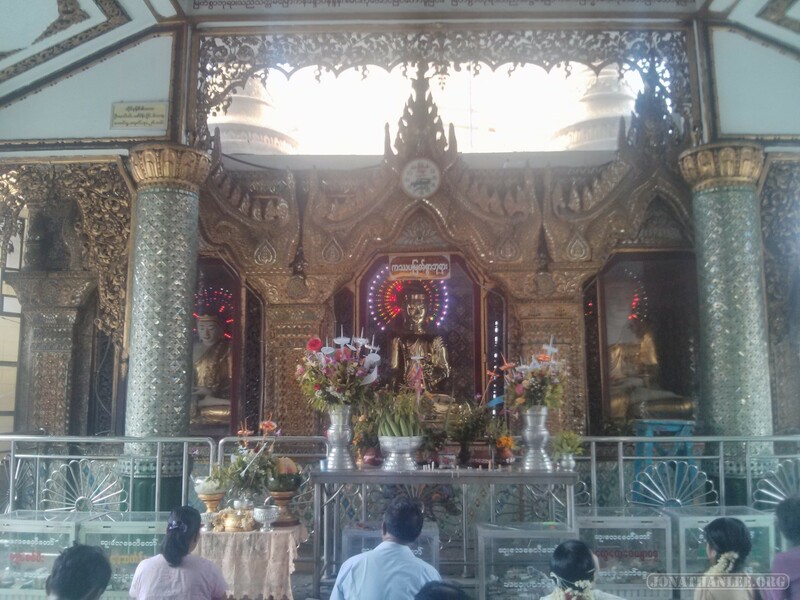 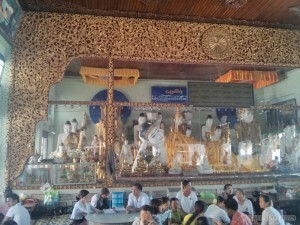 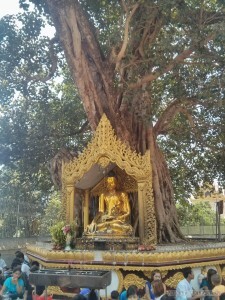 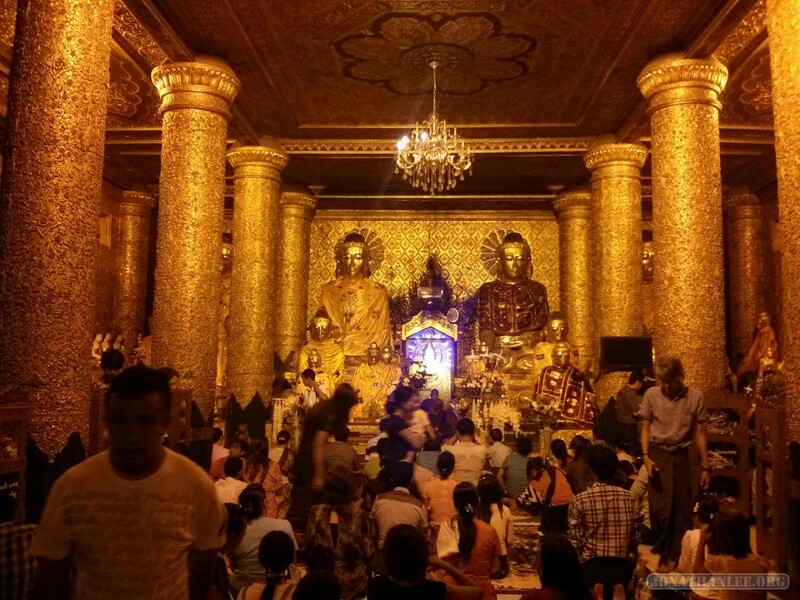 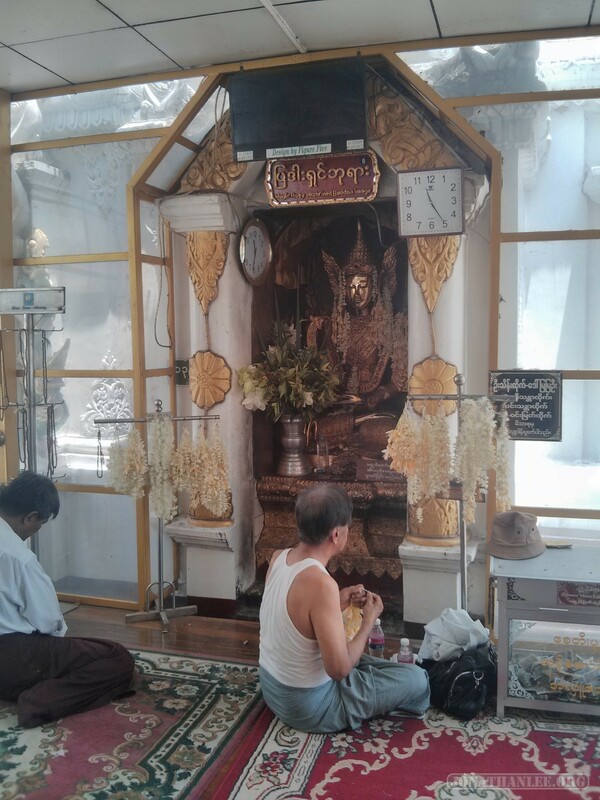 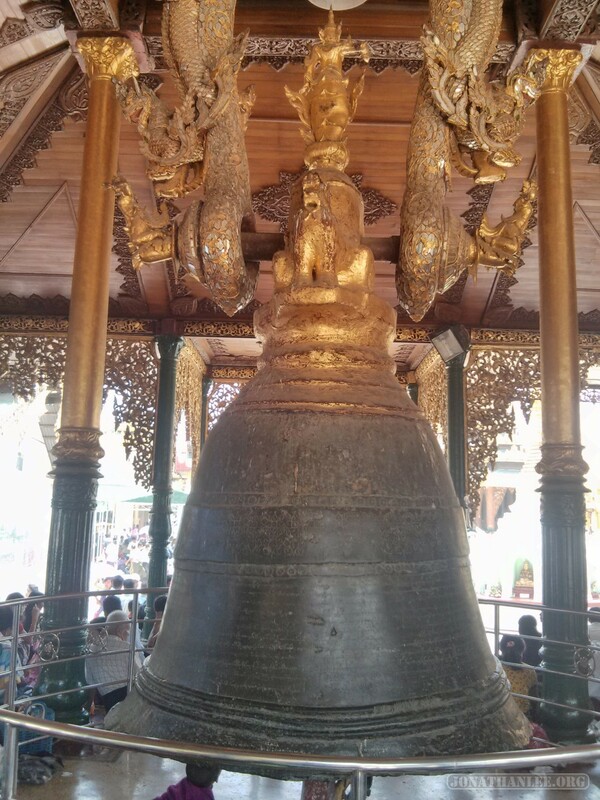 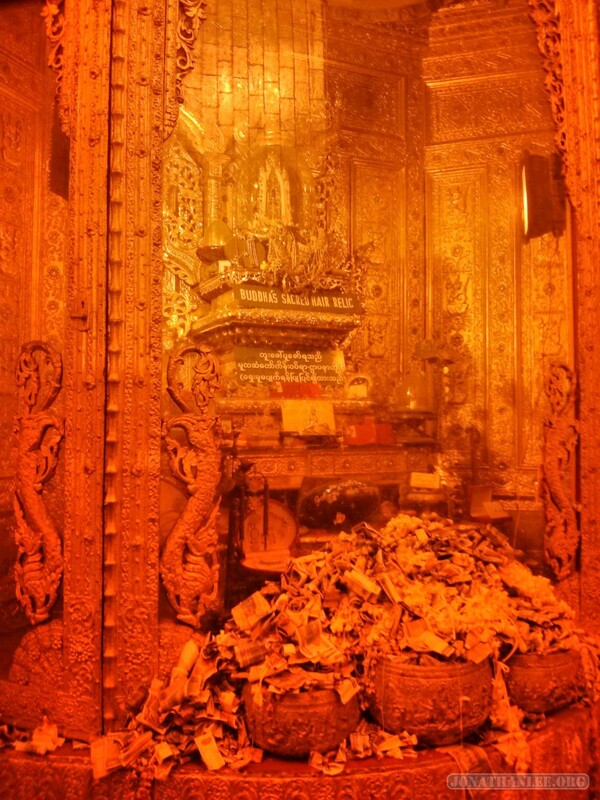 You could also enter the inner sanctum (very crowded, very golden), and see an alter holding a couple strands of Buddha’s hair, overflowing with monetary donations. 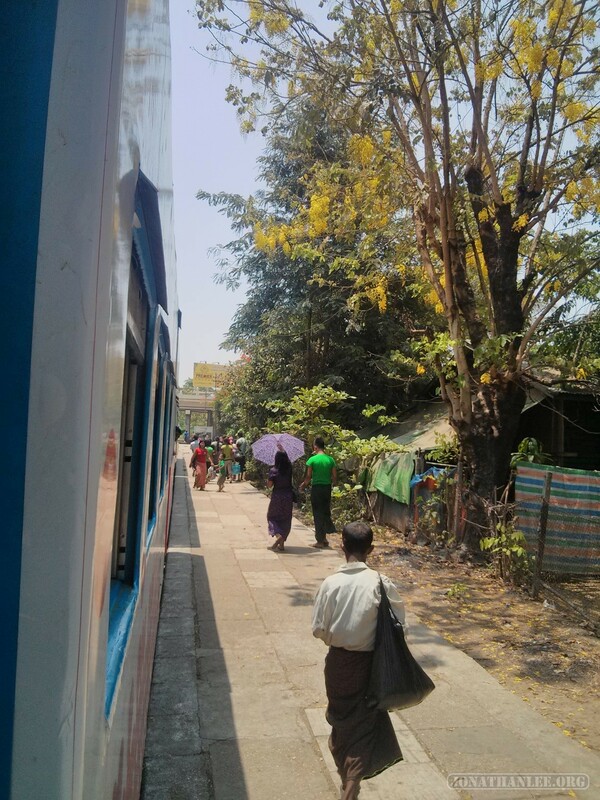 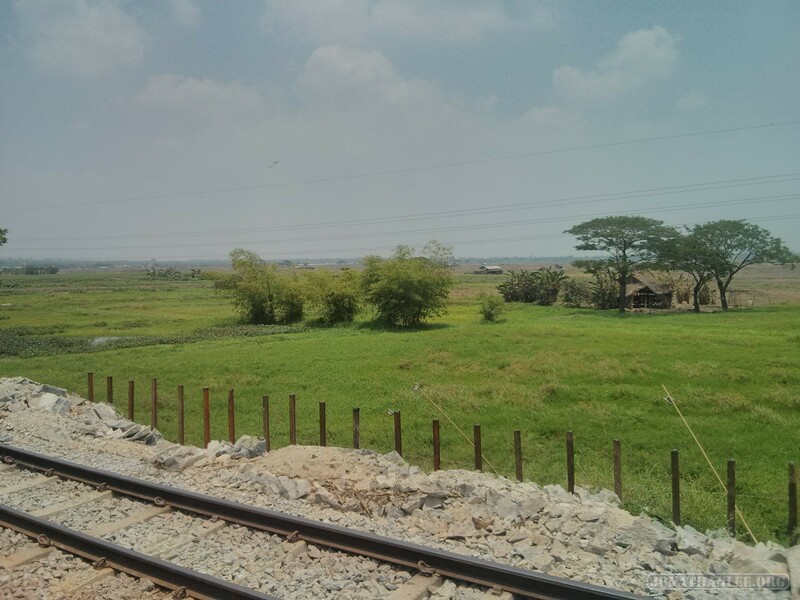 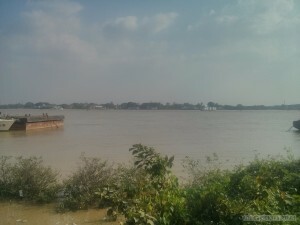 The circular train, as its name implies, is a train track that goes around Yangon, from the city to the countryside and back again, in a little over 2 hours. 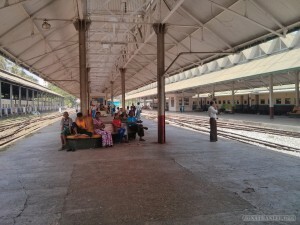 The train station itself is also pretty cool, it’s got a classic feel to it, like how I’d expect a train station to look a century ago. 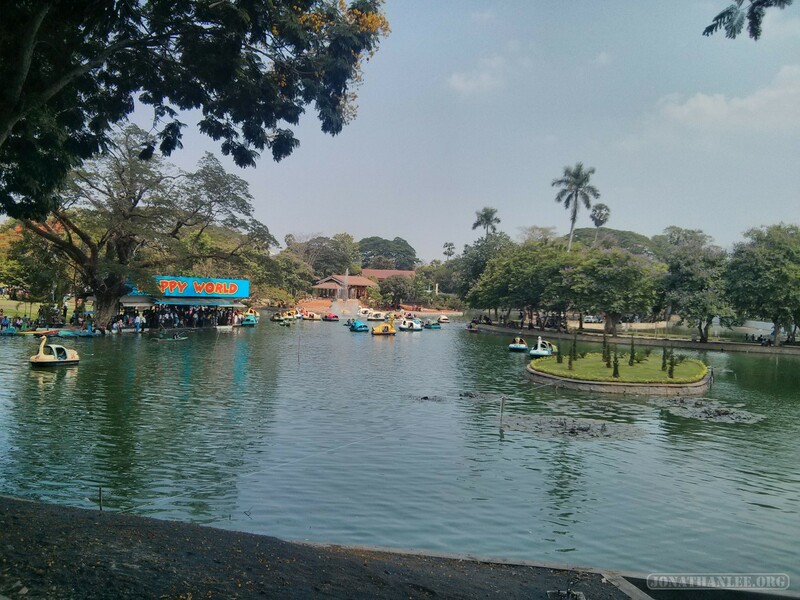 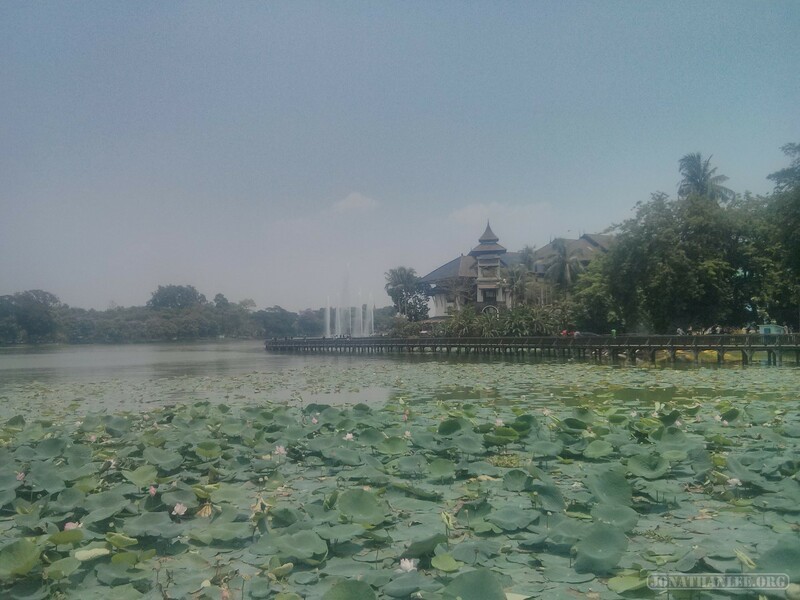 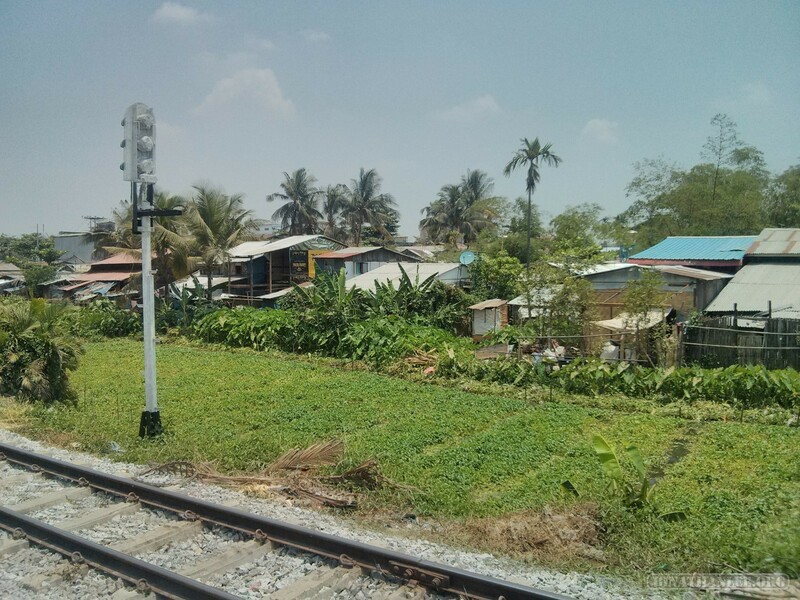 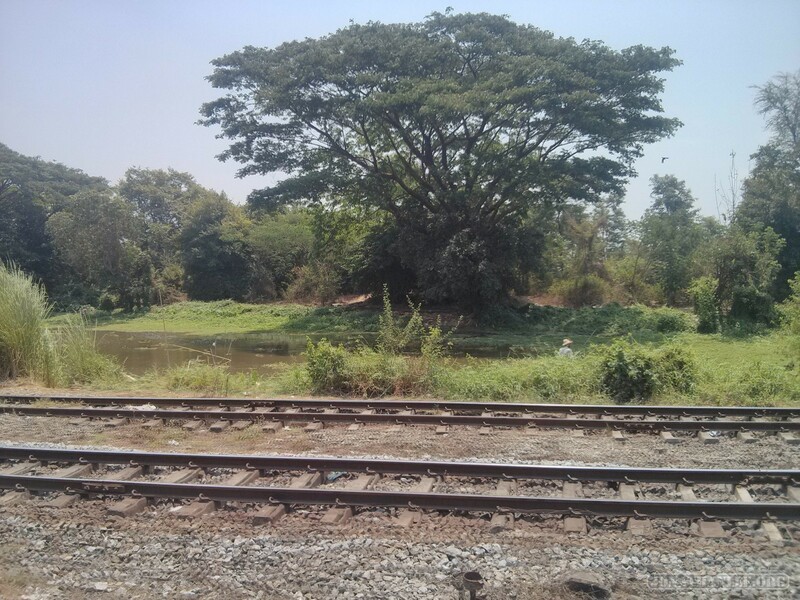 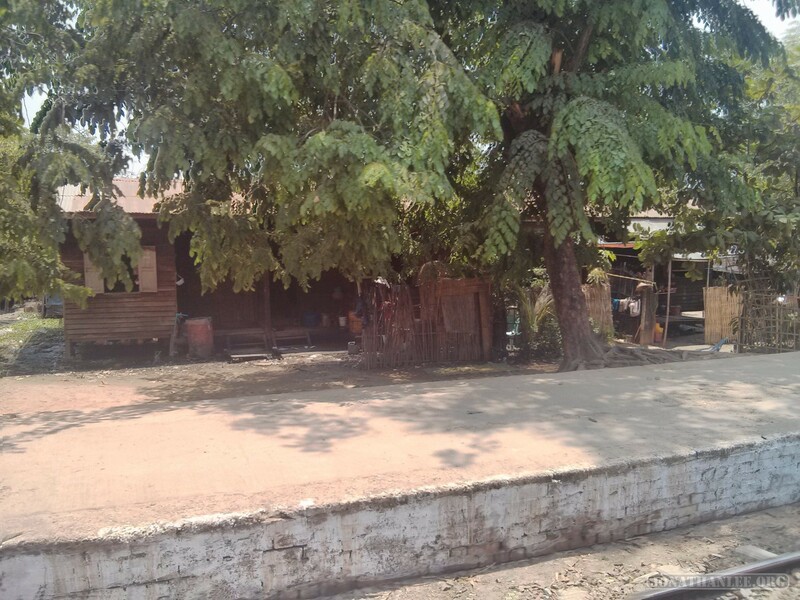 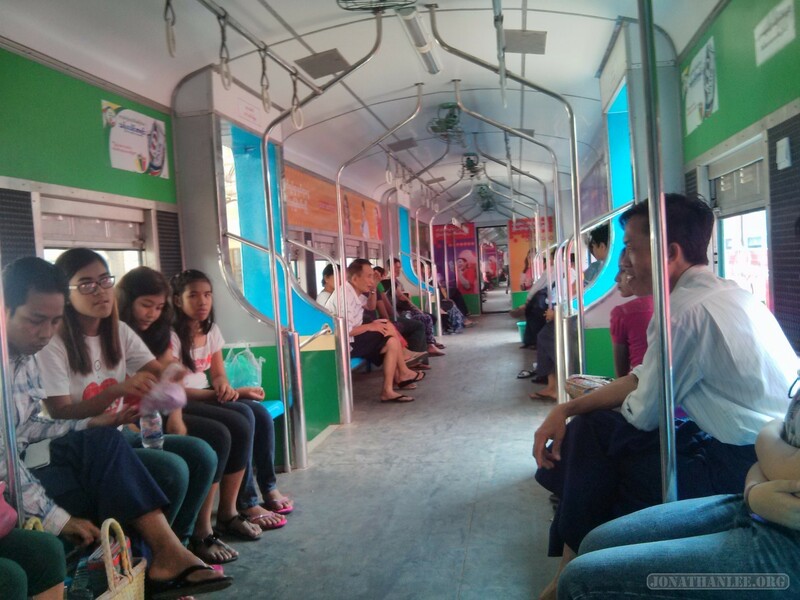 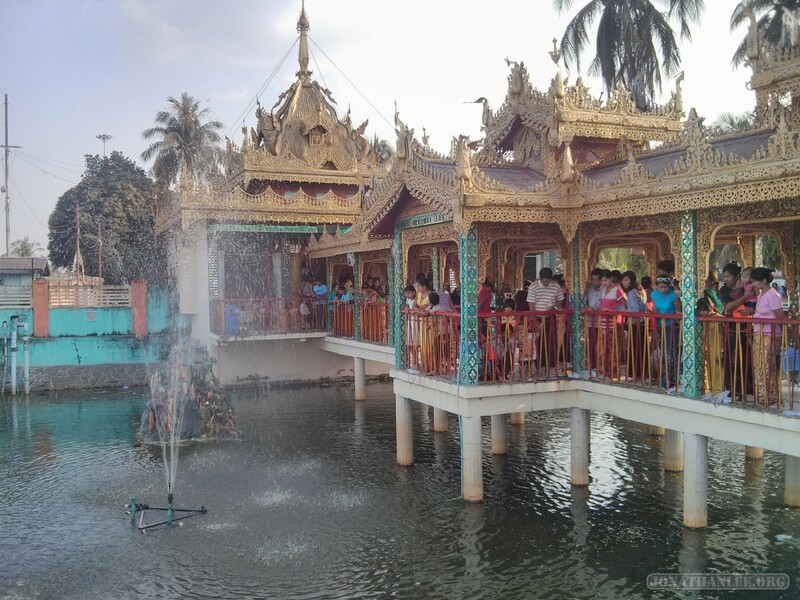 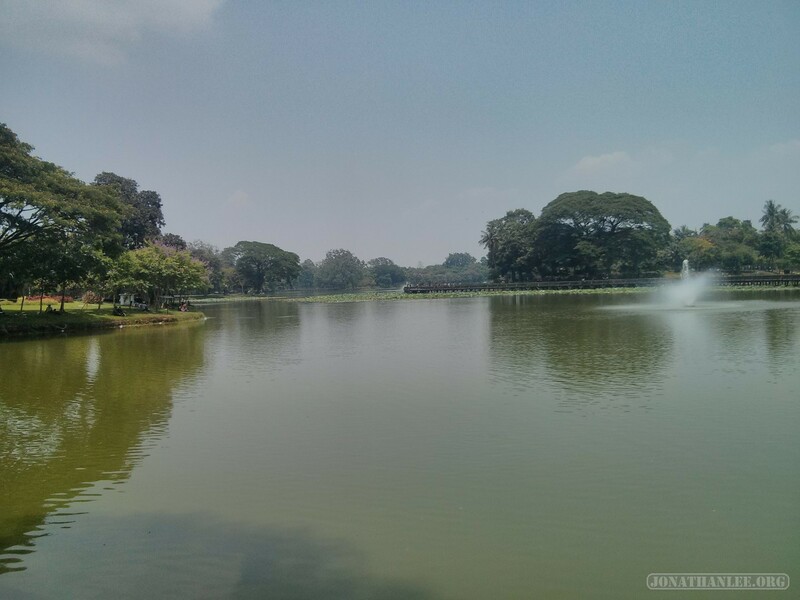 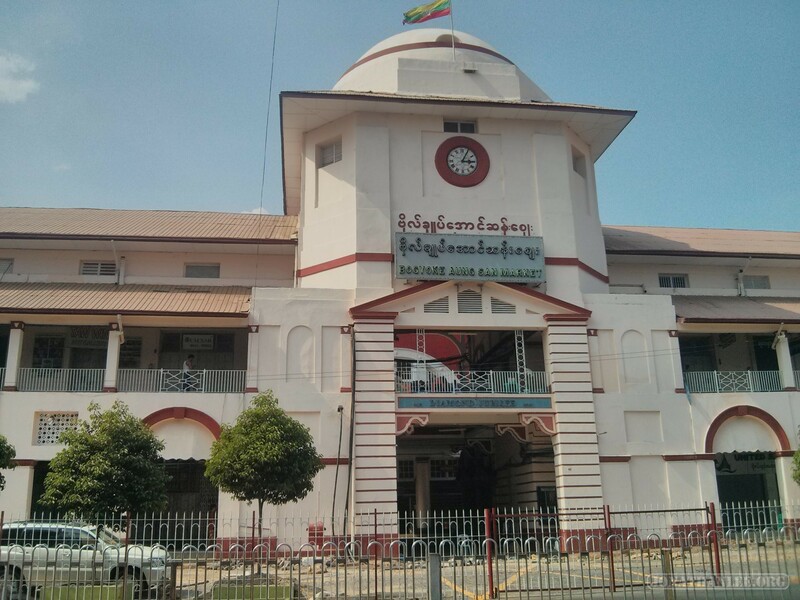 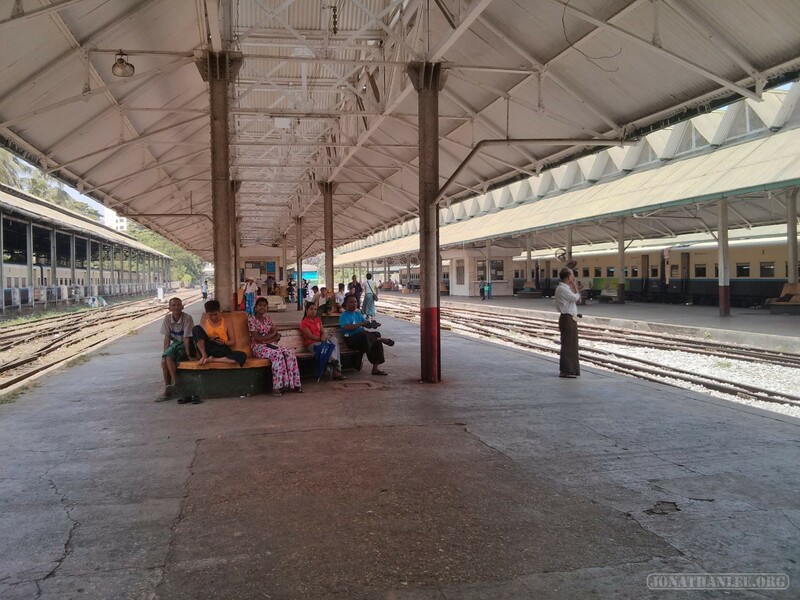 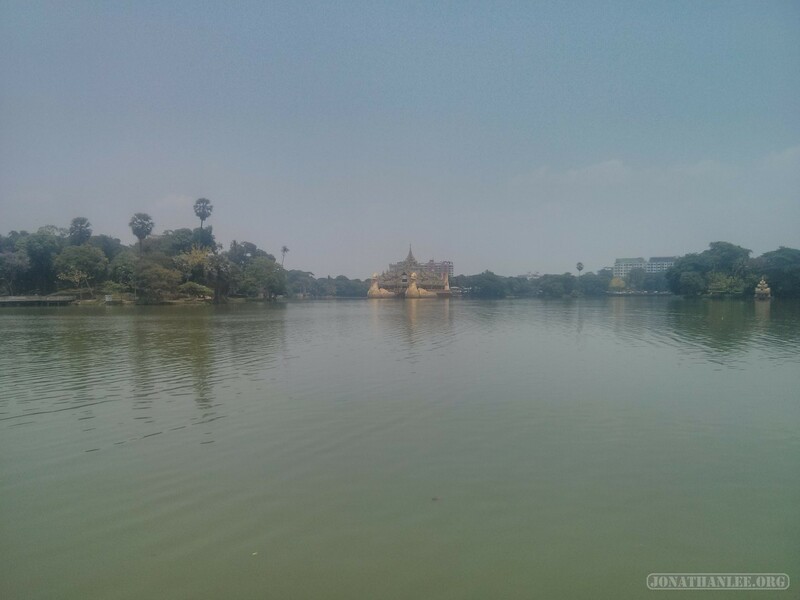 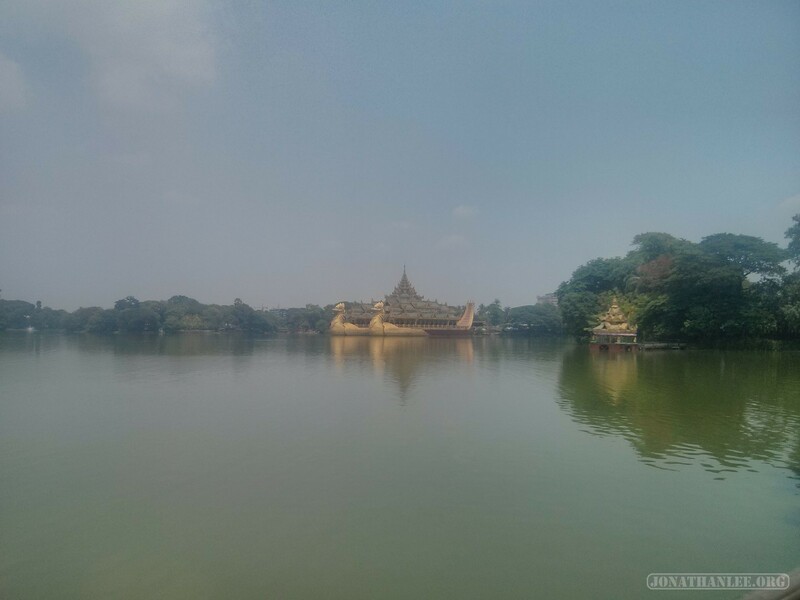 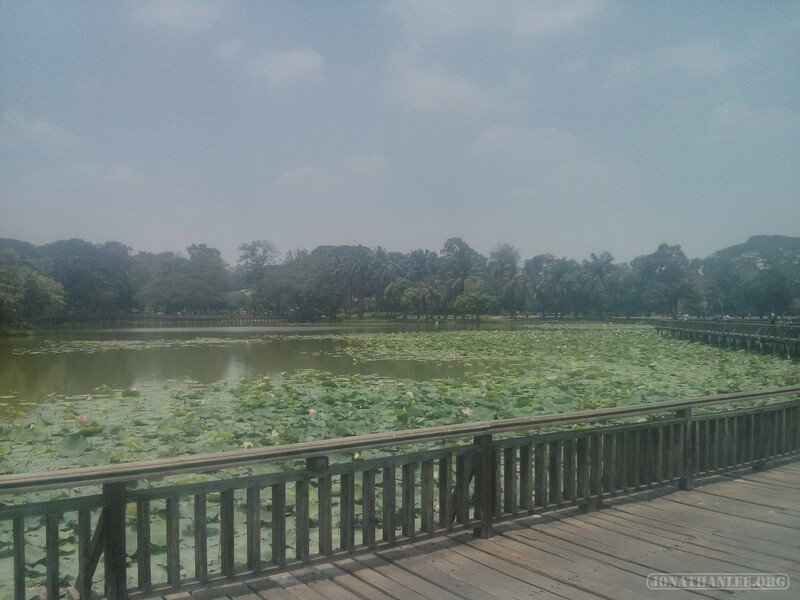 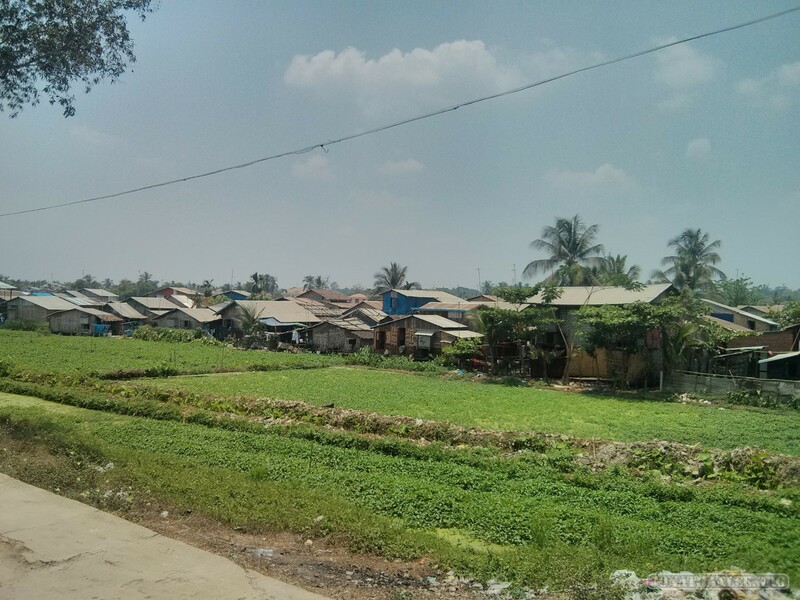 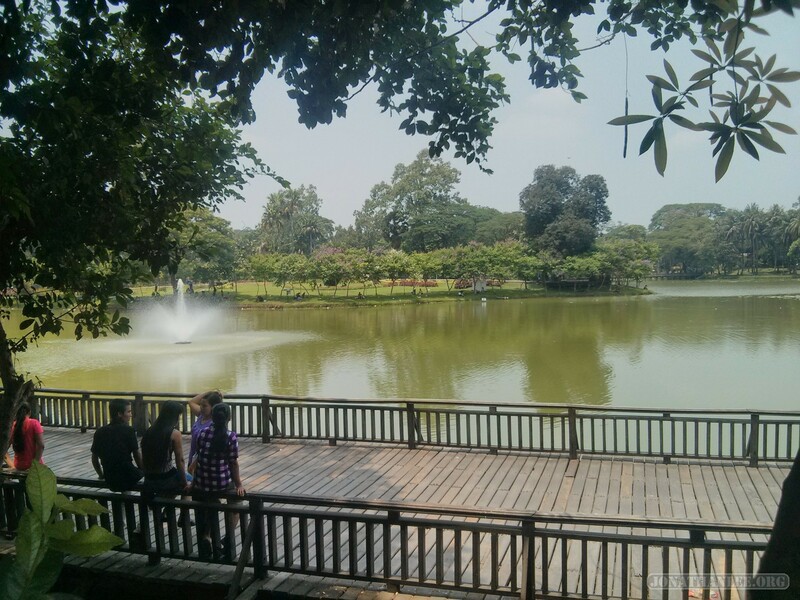 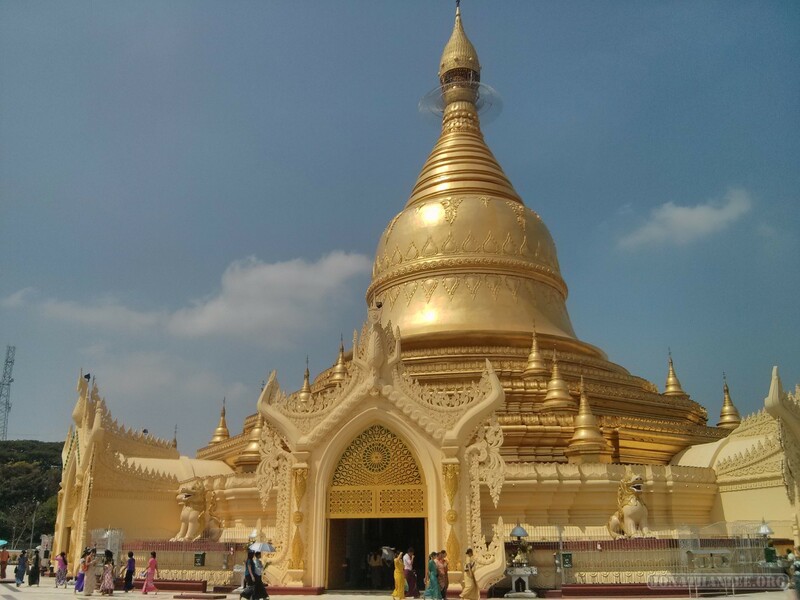 The ride itself is quite tranquil – once you leave Yangon train station, you enter the suburbs very quickly. 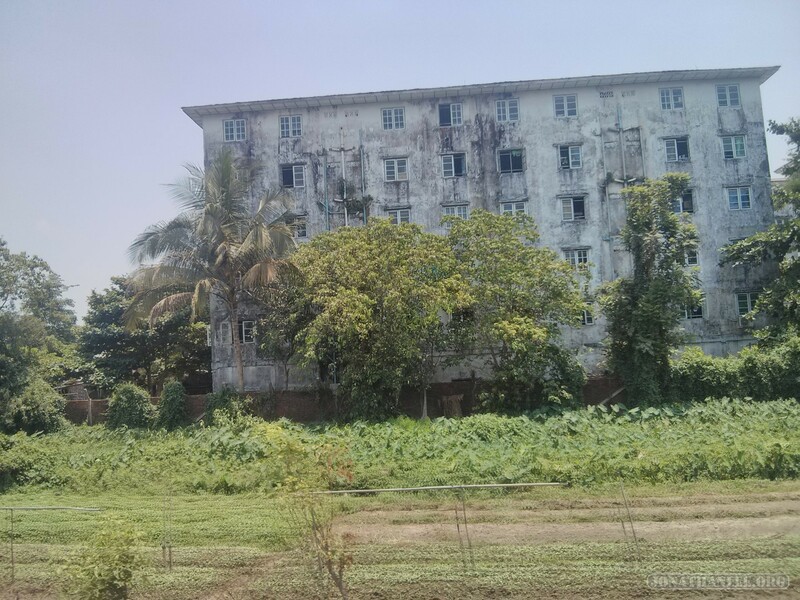 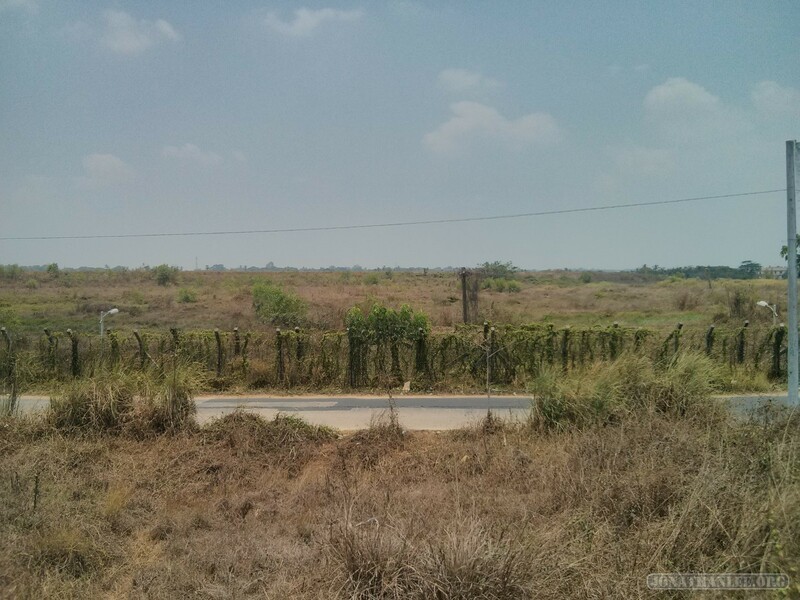 Multistory buildings quickly disappear, to be replaced with fields and forest, small villages and shantytowns, abandoned buildings and empty expanses. 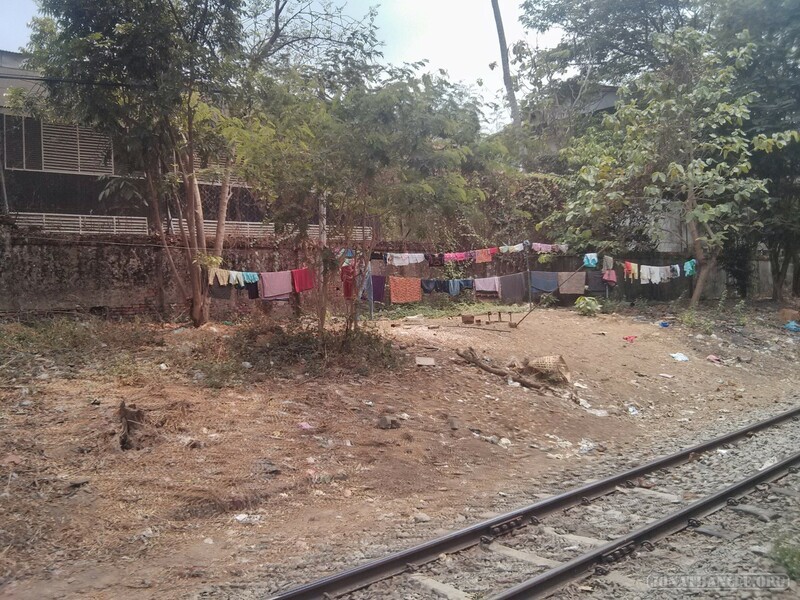 Curiously, there was also the common practice of hanging drying laundry on the fence right next to the train – or even sometimes right on the train tracks! 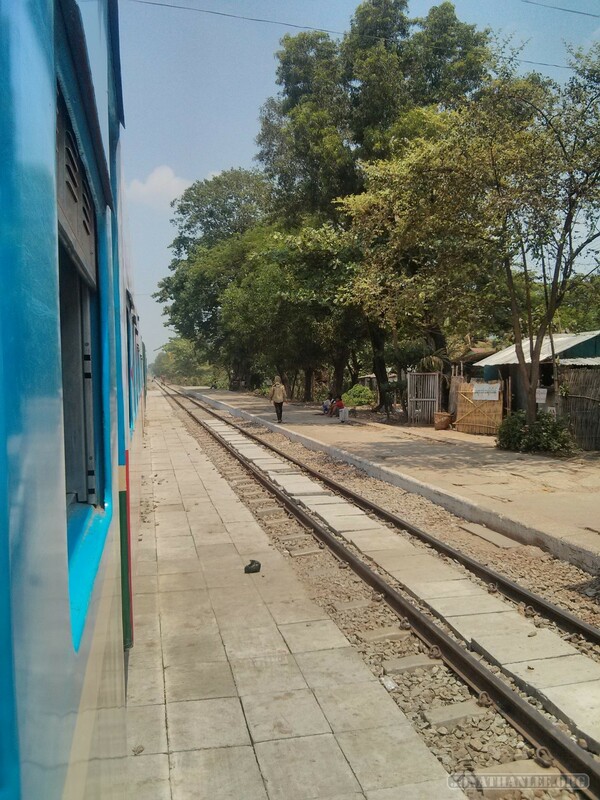 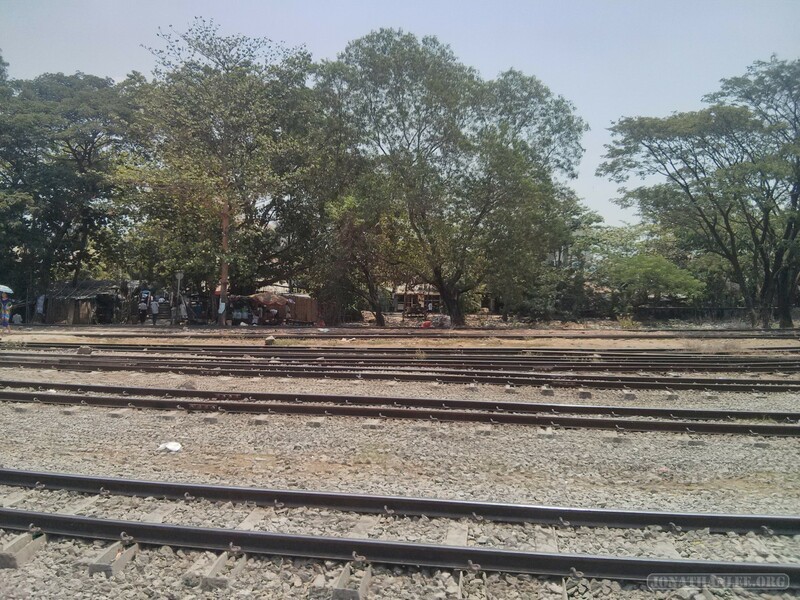 And of course, on the last stretch, just as the train is pulling back into Yangon station, it breaks down. I, as well as most of the other riders, simply hop off, and walk the rest of the way. 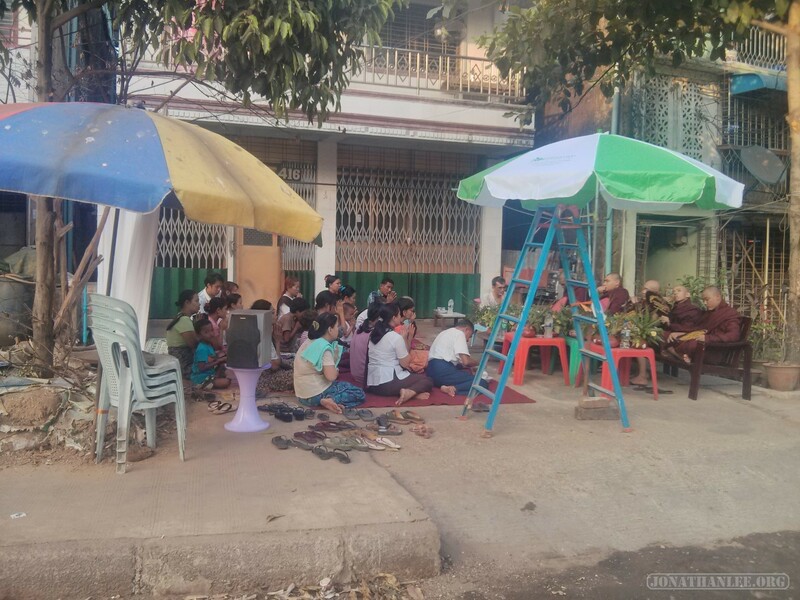 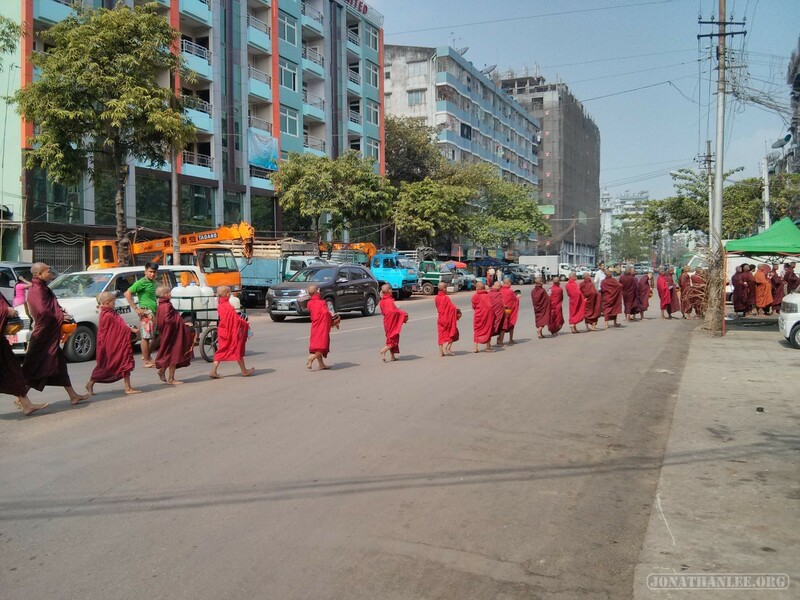 A regular day in Myanmar, I guess? 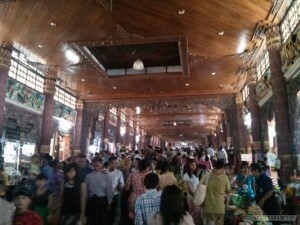 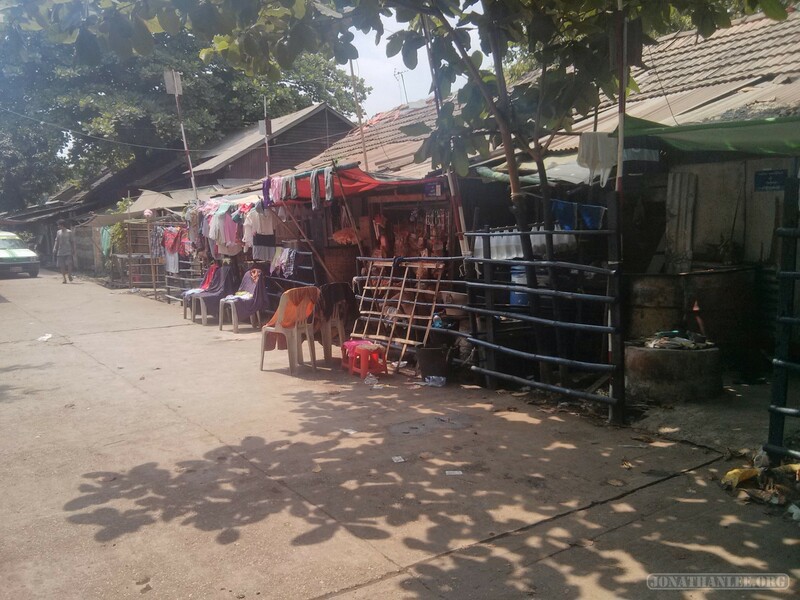 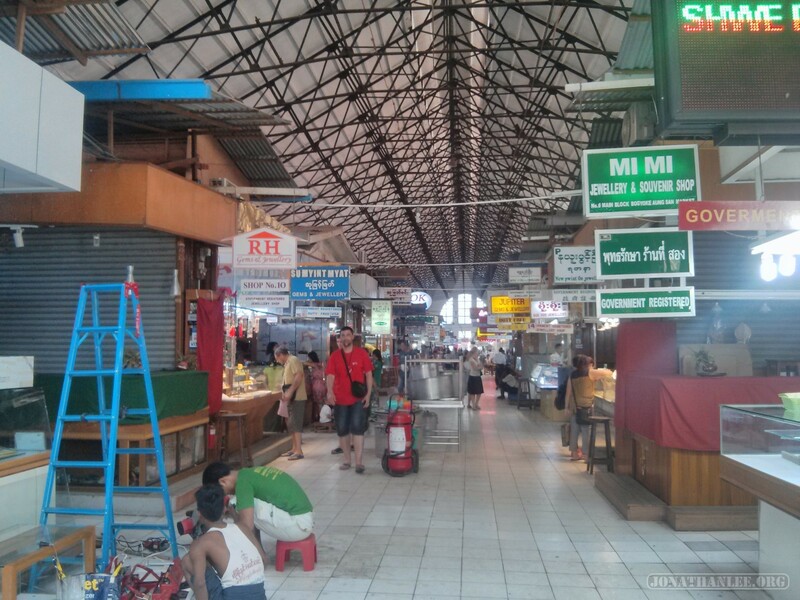 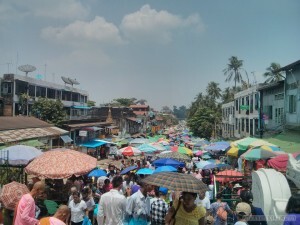 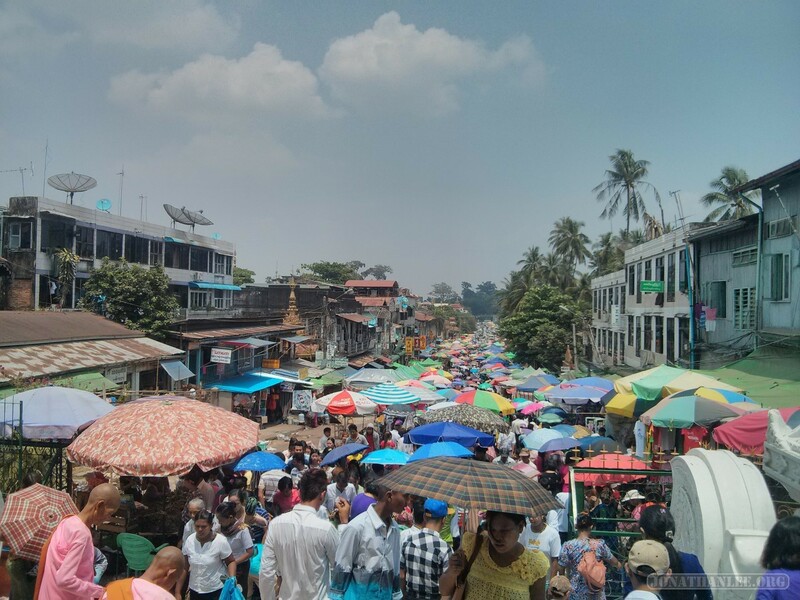 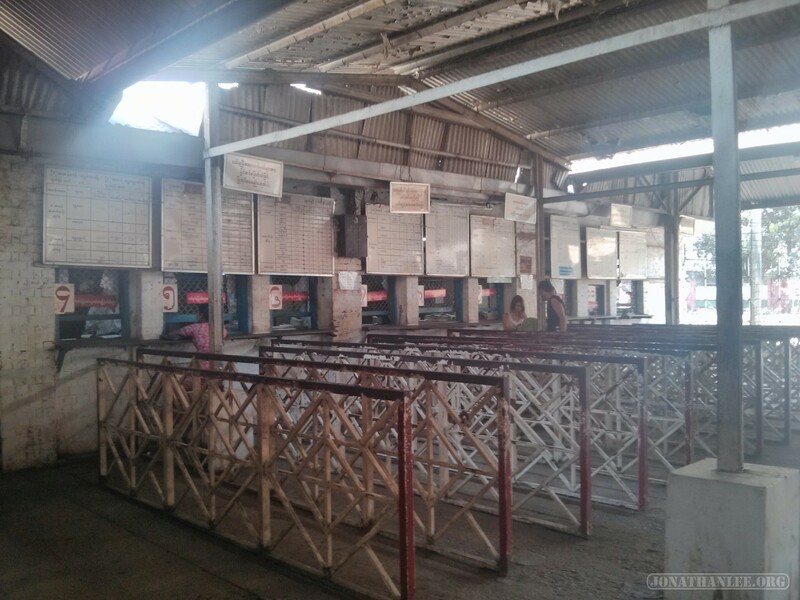 Bogyoke Market is the main merchandise market of Yangon, but is somewhat lackluster compared to its compatriots in Vietnam, Thailand, or even Laos. 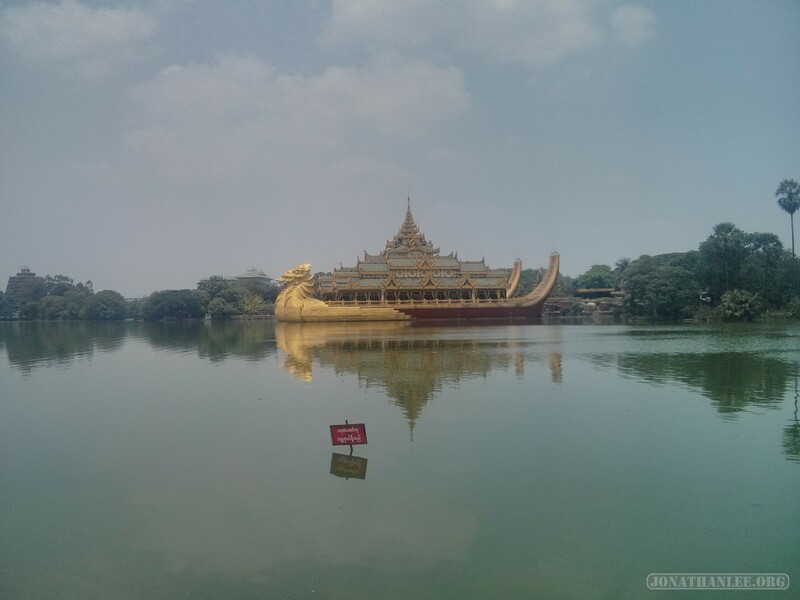 Curiously, the golden boat-like structure is a restaurant! 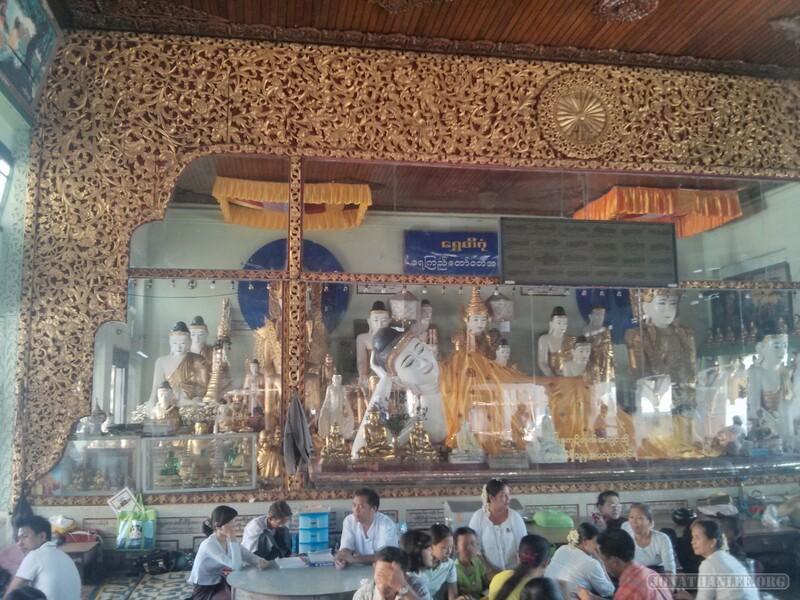 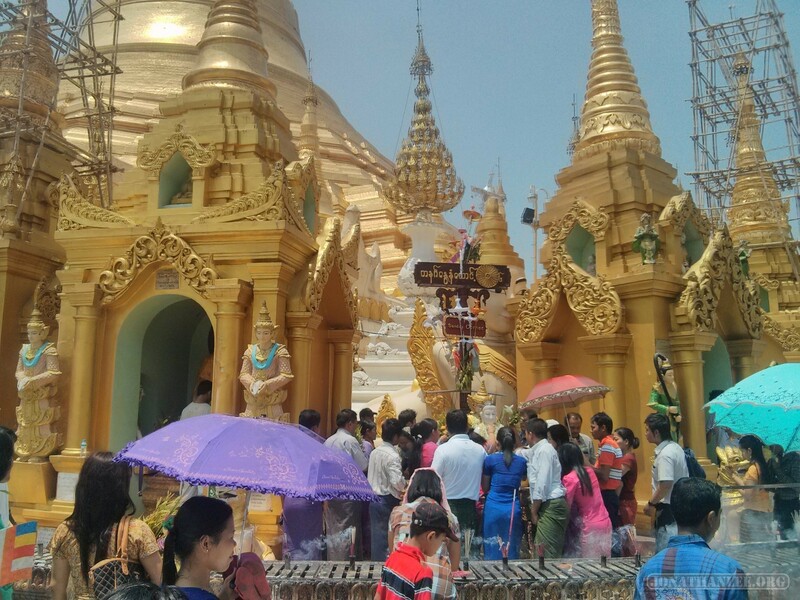 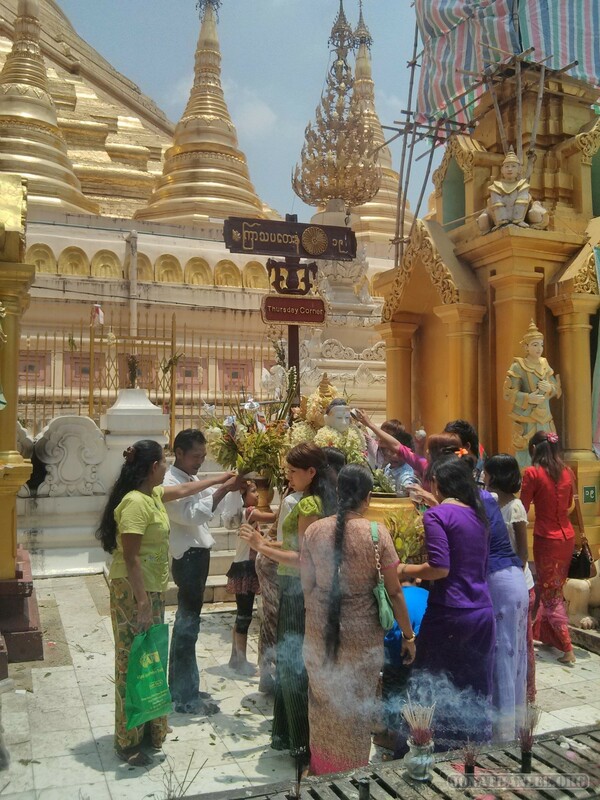 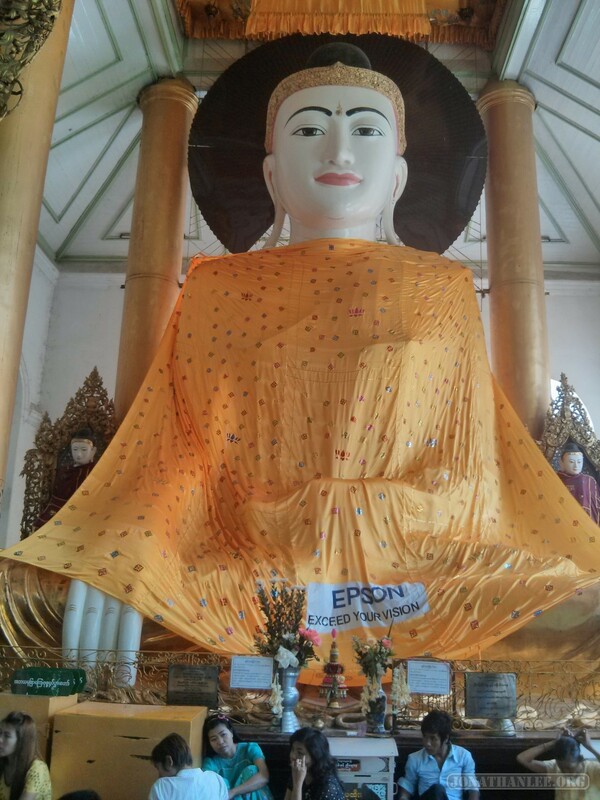 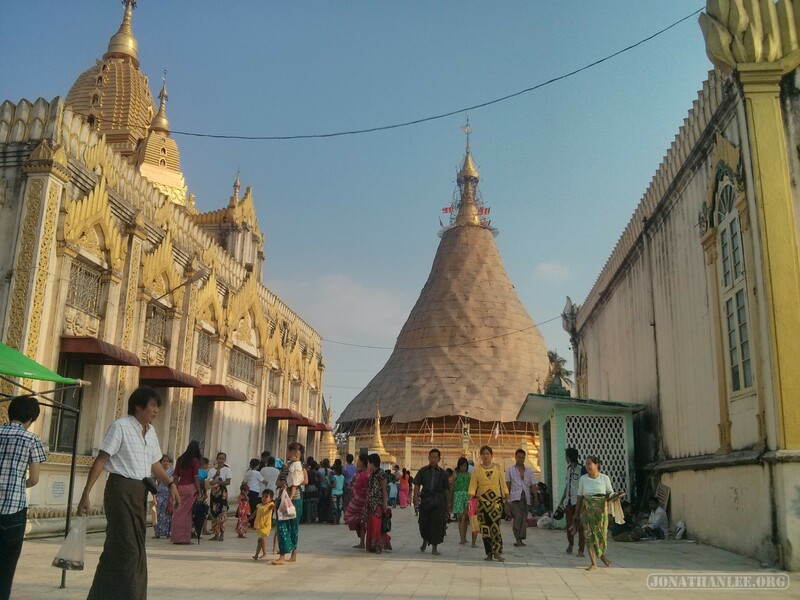 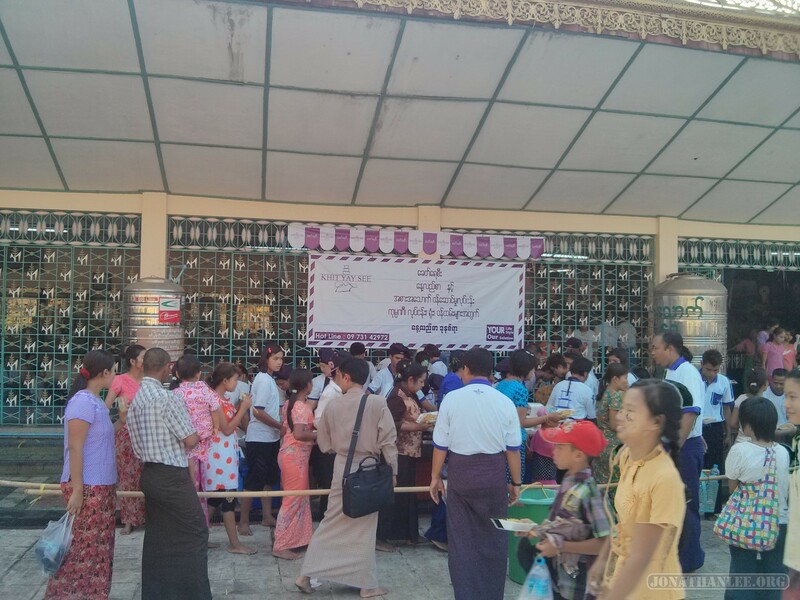 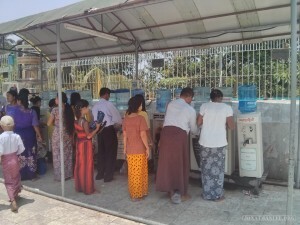 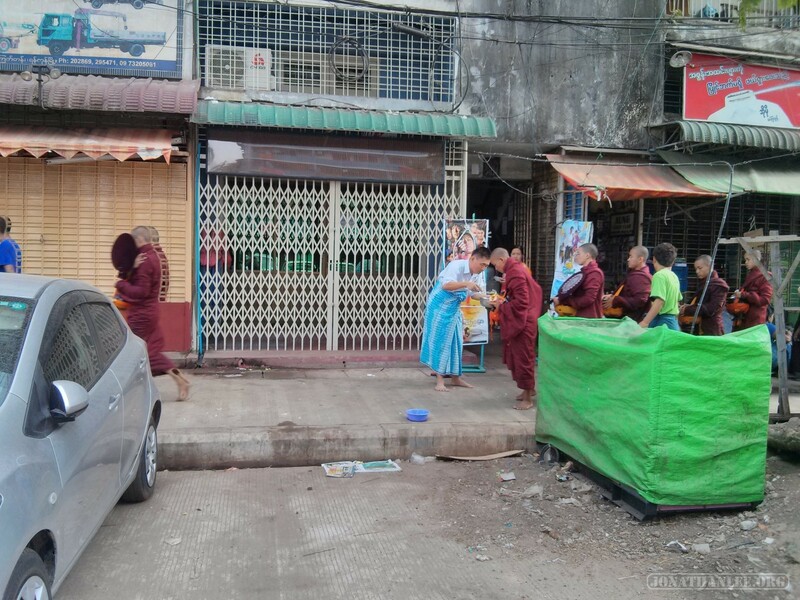 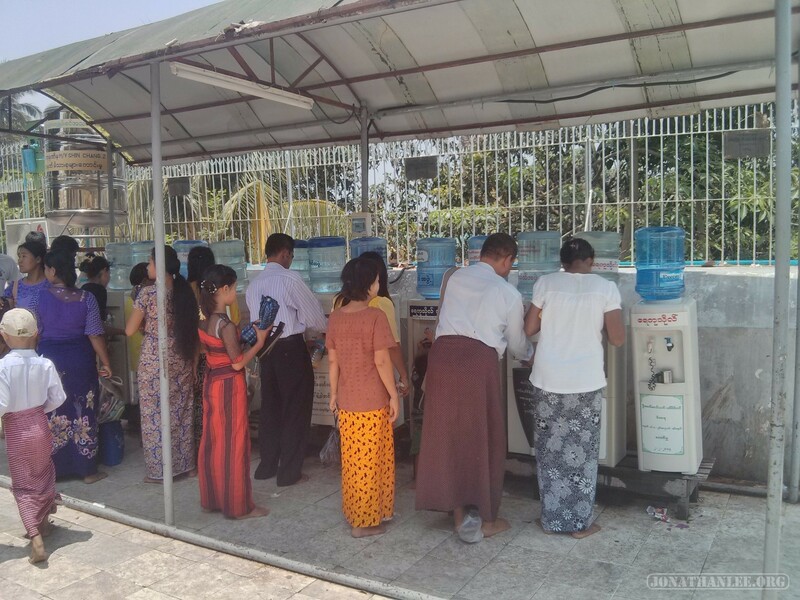 – Monks were to be seen all over Yangon – walking around, collecting donations, even performing a blessing ceremony! 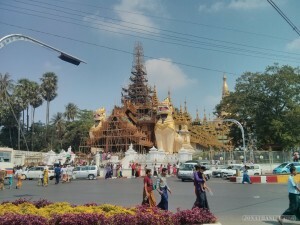 – Since Myanmar is right next to India, there’s a strong Indian food influences – I had some pretty good curry here, and ate with my hands for the first time! 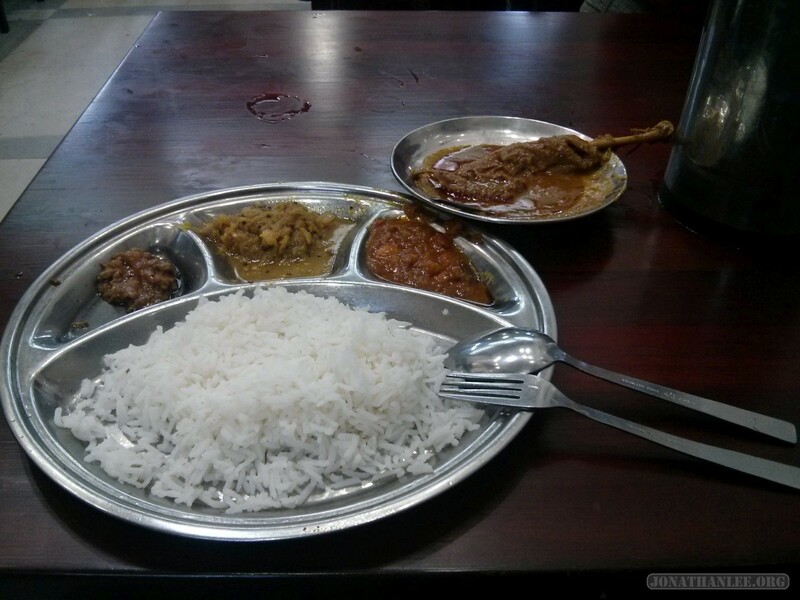 It was pleasantly enjoyable! 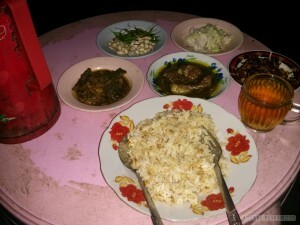 Random street food was also delicious in Yangon – at night, people just bring out pre-cooked pots of food, and sell it economy rice style. 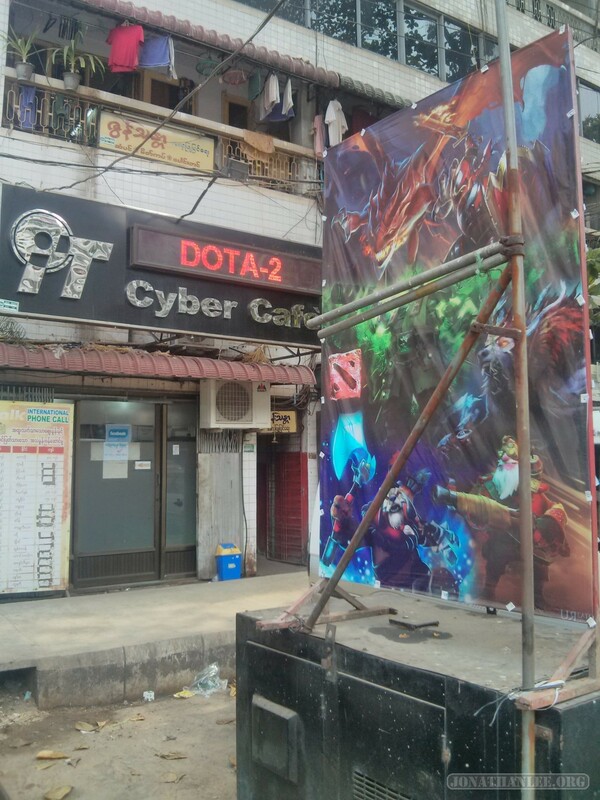 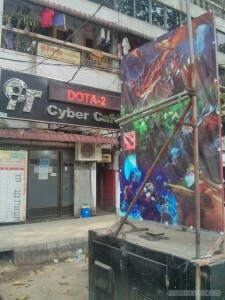 – I found my favorite computer game, Dota 2, in Yangon of all cities! 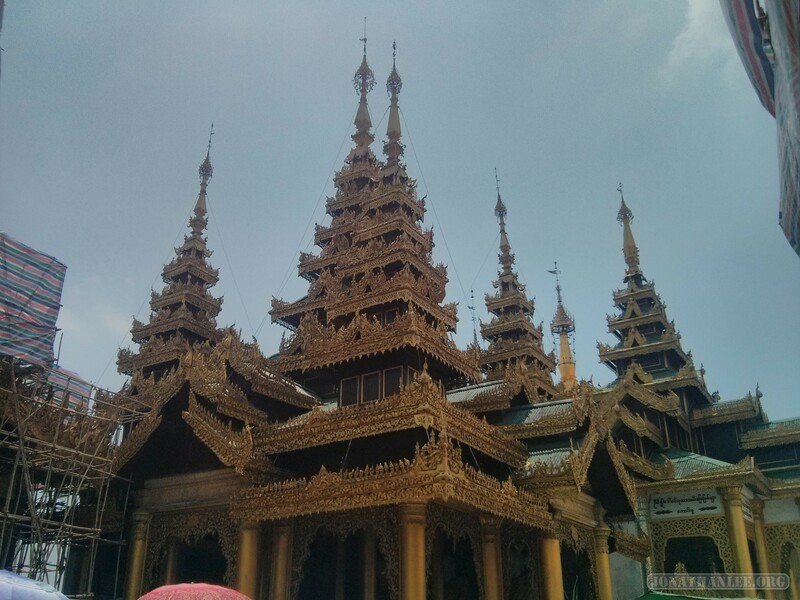 Which is quite surprising, since the internet in Myanmar is basically at 56k dial-up modem speeds!